Time sure flies. I can’t believe that my last entry was in December when I was setting up my Christmas decor and unwrapping the holiday dishware. 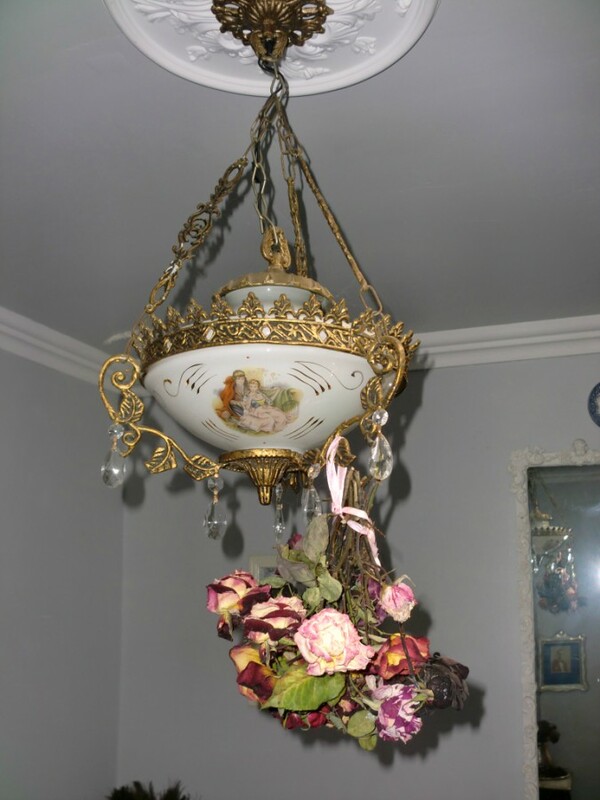 The yuletide decorations have long since been packed away and stored carefully until next year. 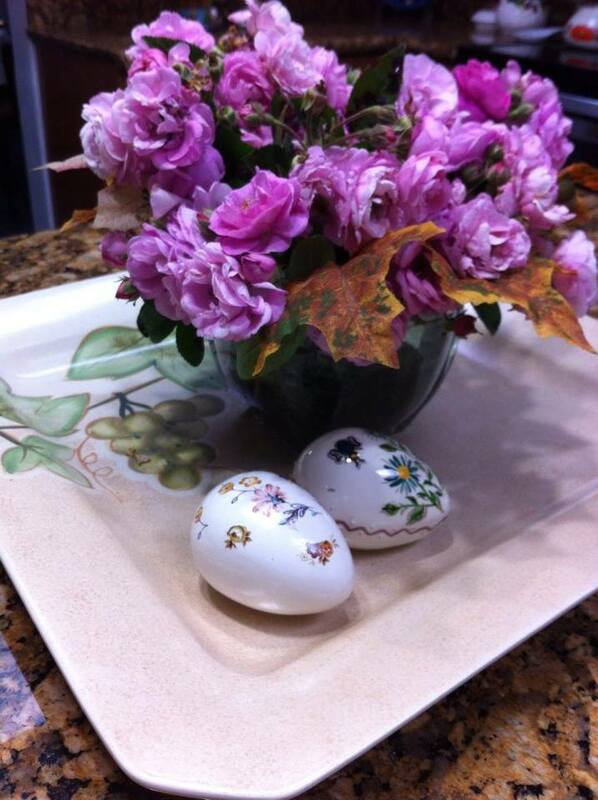 And now, it seems that suddenly spring has arrived! 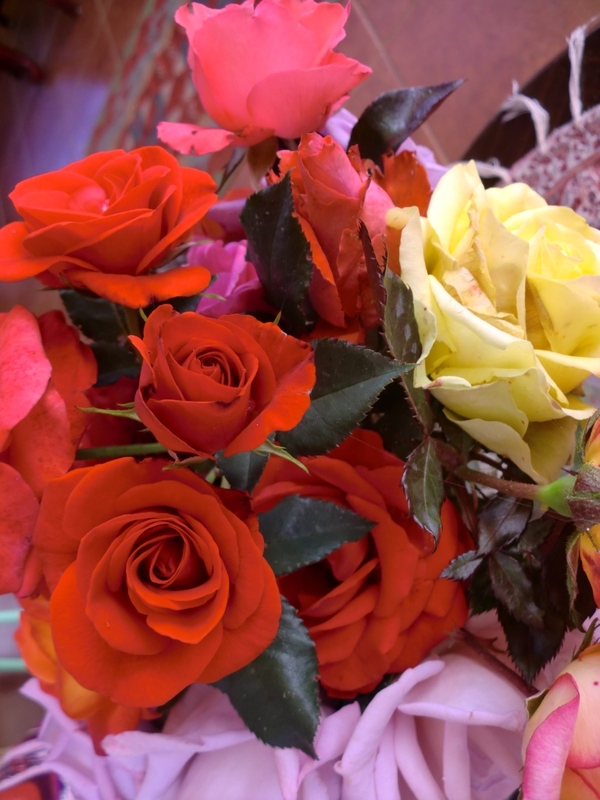 The rain has finally stopped, the ground is no longer wet and soggy and my roses have burst into bloom with a display of dazzling colors that feast my eyes every morning as I sip my coffee on the balcony overlooking the garden. 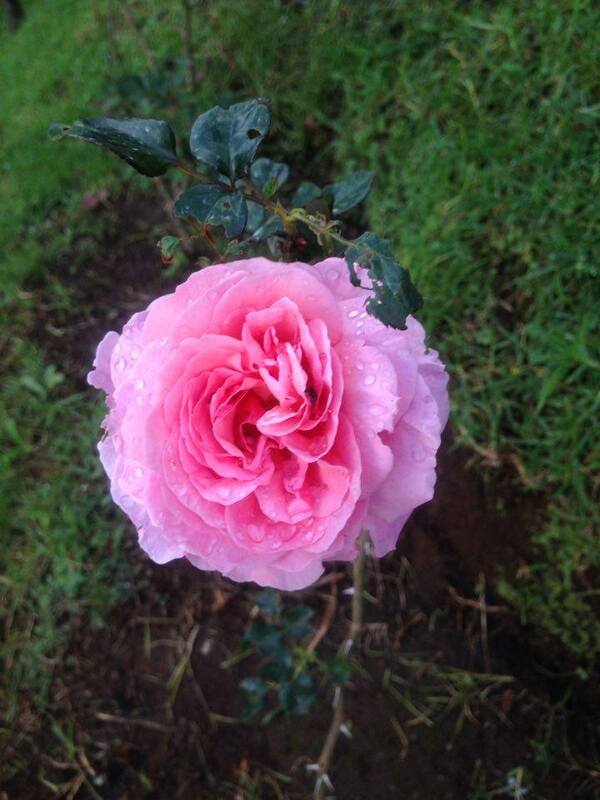 The roses in the first pic came from this bush. I think I like seeing the many colored petals strewn on the ground almost as much as I like seeing the blooms on the rosebushes. The white spots you see on the leaves are from a fungal spray that is an absolute must in my humid climate. 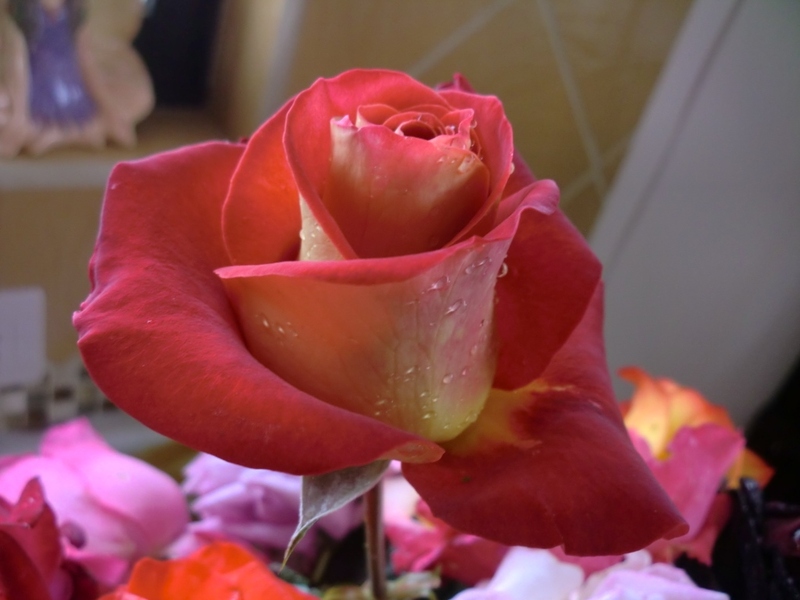 It washes off when the roses are watered or when it rains. 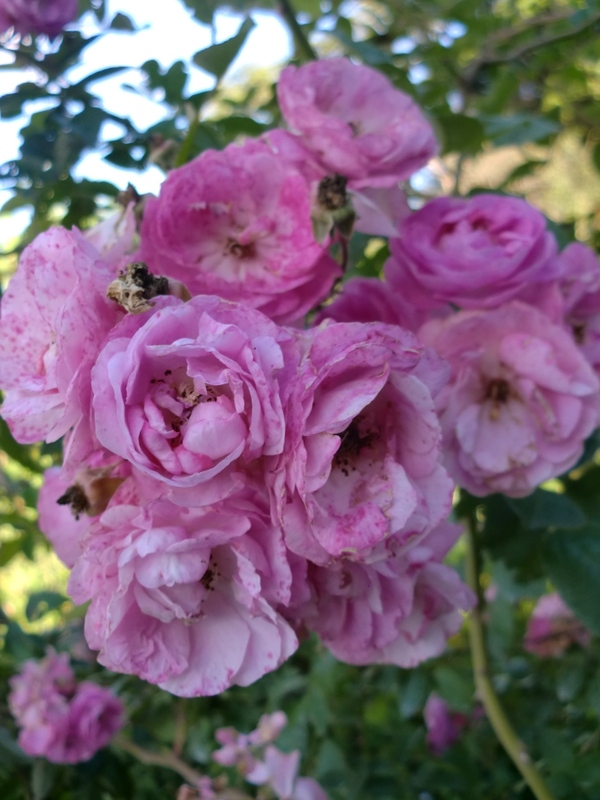 There is no other way to grow roses around here without spraying, otherwise the many aggressive funguses can destroy an entire garden in just a few weeks. That’s one of the drawbacks of living in a rainforest. 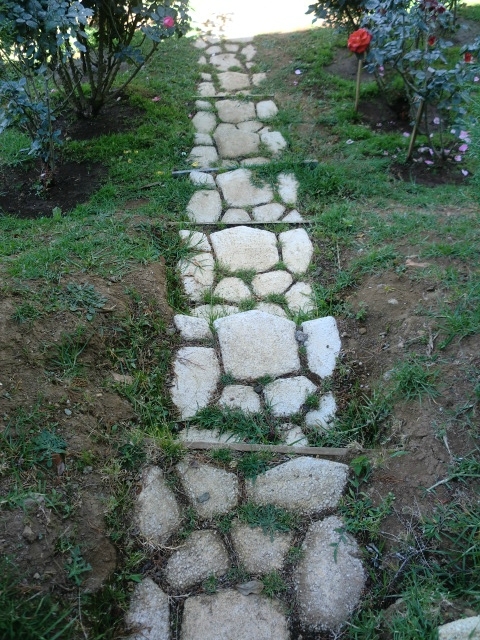 I put in a little stone pathway in the very center of the rose garden which is quite helpful, because the garden is on a steep slope that can become quite slippery when it rains. They’re actually faux stones. 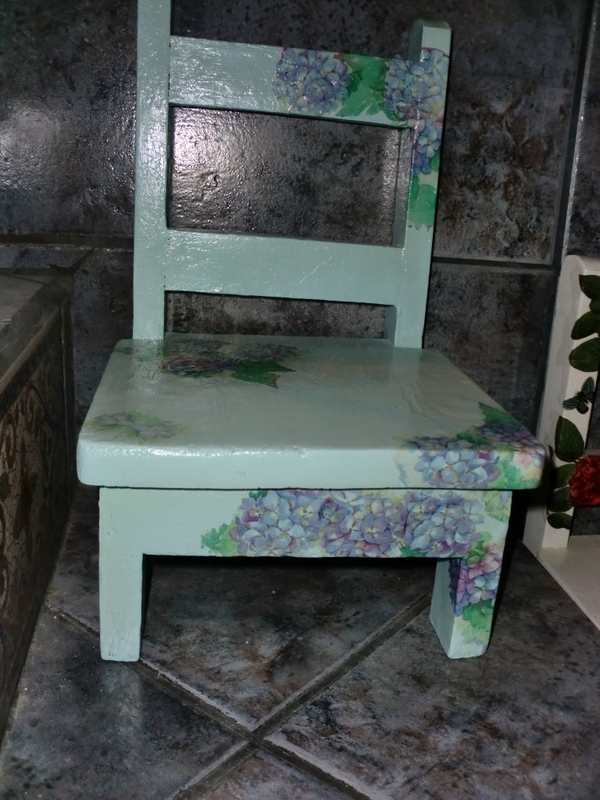 I made them out of concrete using a large mold that I bought at the home improvement store. 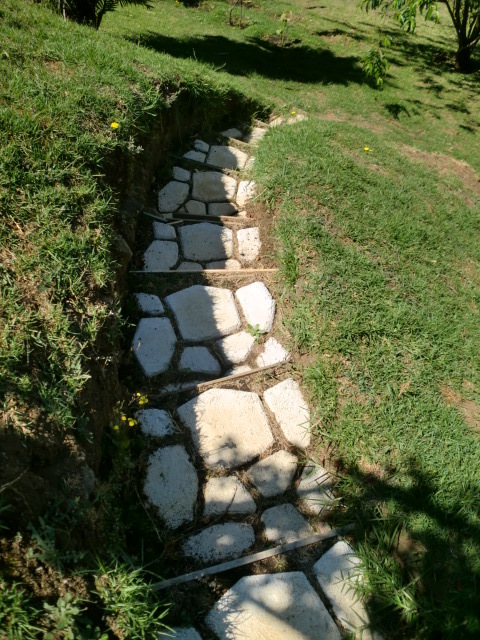 I’m hoping that eventually the grass will grow in between each stone and give the pathway a more natural look. 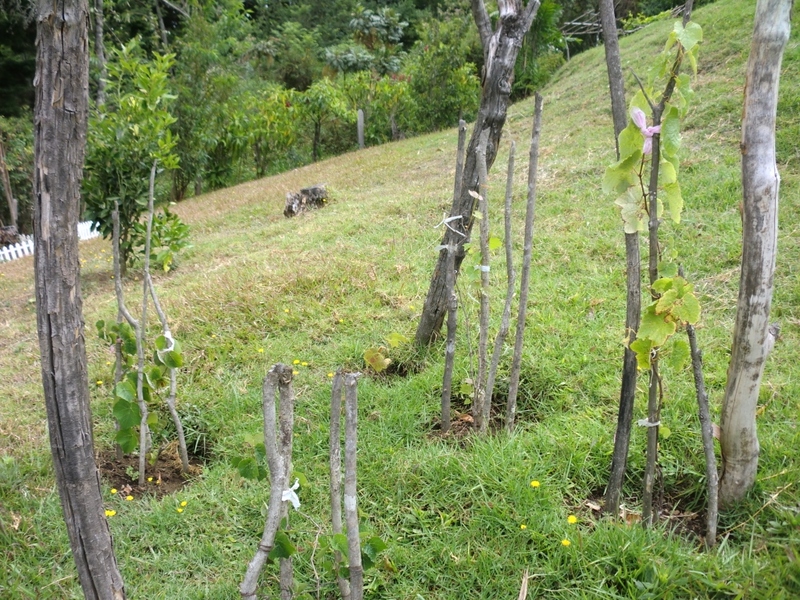 It extends all the way down the slope and leads to the other part of the garden where the fruit trees are. 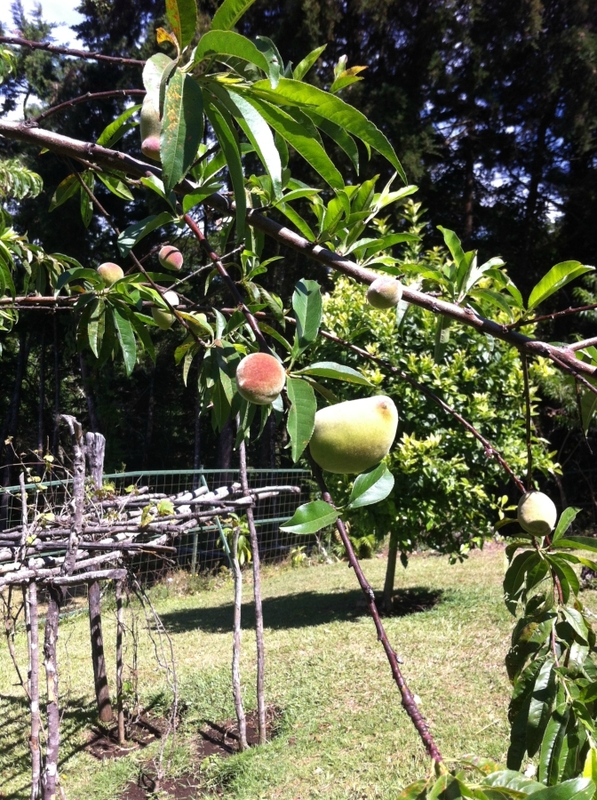 Most of the fruit trees already have ripening fruit on them. Others are full of blossoms. I’m crossing my fingers that the birds and squirrels will stay away. In the background you can see my failed attempt at growing grapes. Those vines have been there for at least five years but they never grow more than a few scraggly leaves, let alone grapes. I have not quite yet accepted the fact that grapes don’t do well in a humid rainy cloudforest. But I haven’t yanked them out because I keep hoping a miracle will occur. The figs are doing quite well. 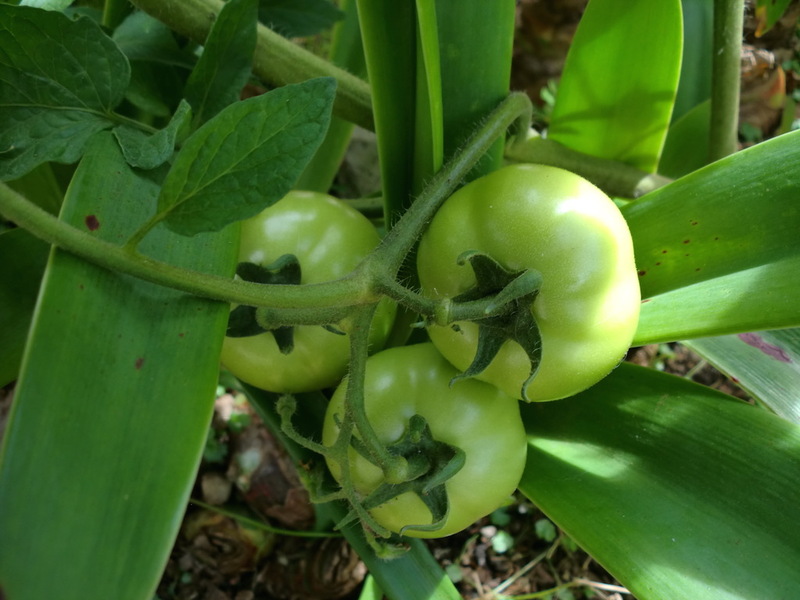 They are starting to ripen, plump and juicy. 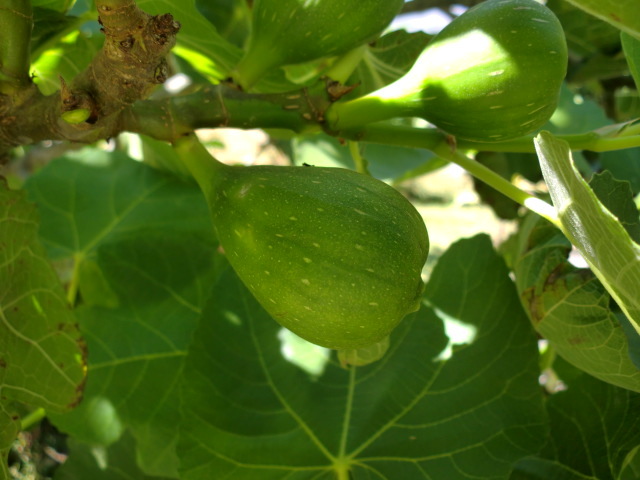 I see fig compote in the near future. 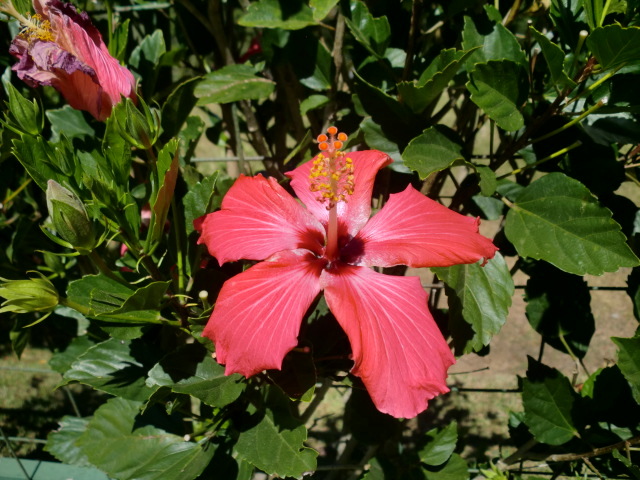 Hibiscus bushes are reliable bloomers in the garden. 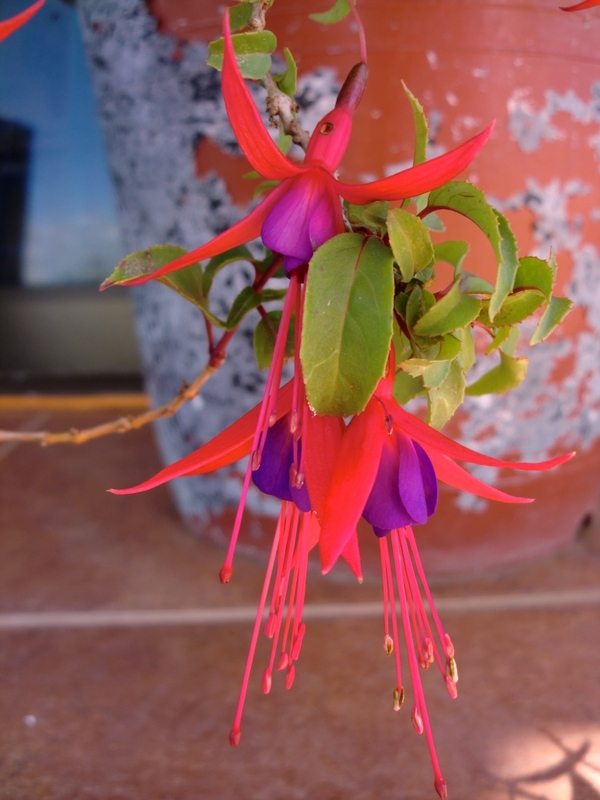 These flower continually year round and provide a cheery pop of color even when the other plants aren’t blooming. 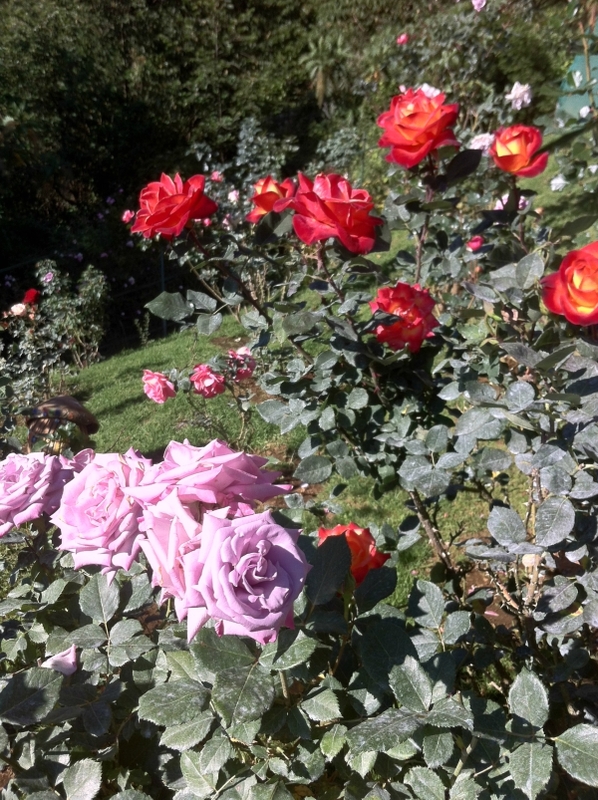 My favorite part of the garden however, is the rose garden. 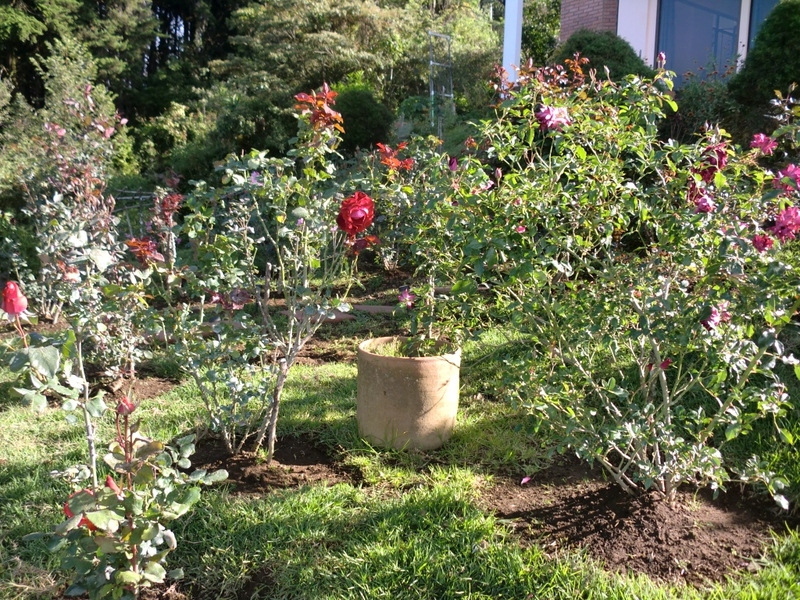 I’ve started another little rose garden down below on the left side of the slope with just cuttings from the larger plants. They’ve already rooted and they’re doing nicely. 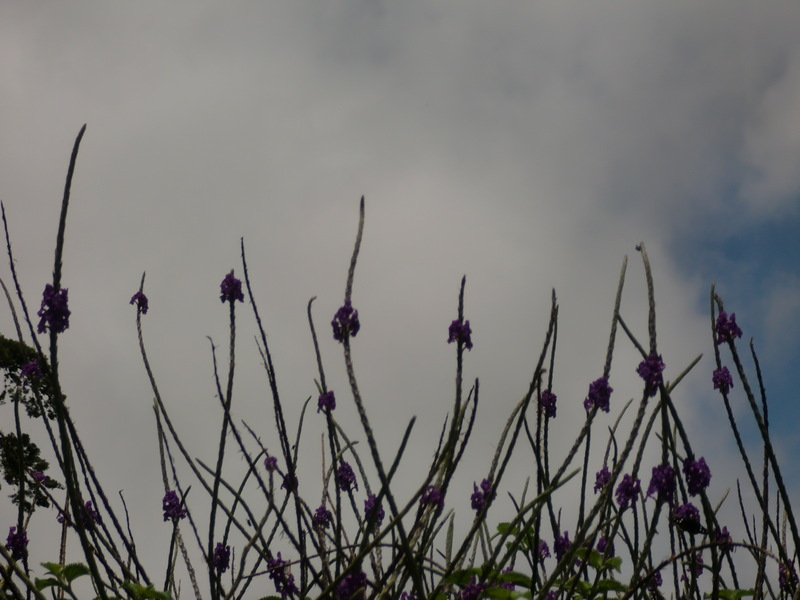 Hopefully next year they’ll bloom as much as their parents do in the garden directly above them. I know, I know. There is no such thing as a black rose. 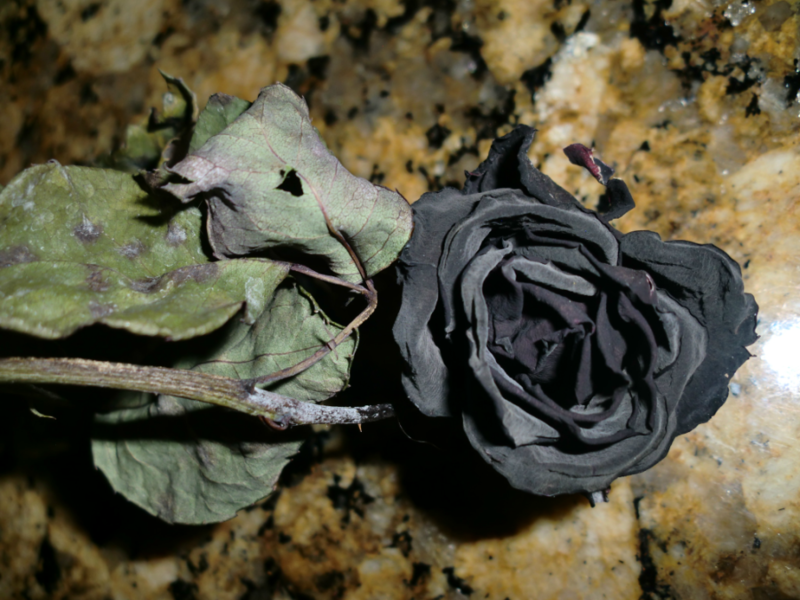 I know I’ve talked about my black roses before and have even showed you pictures, but I thought I’d post about them again because a few days ago as I was removing some bouquets of faded roses from their vases, I discovered that some of those “black” roses had turned an amazing and velvety pitch black as they dried. 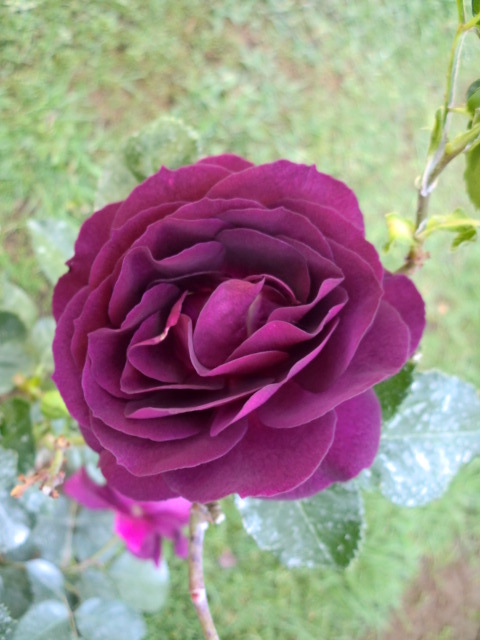 For quite some time I didn’t know what the name of this rose was, but I suspected that it was Black Baccara. 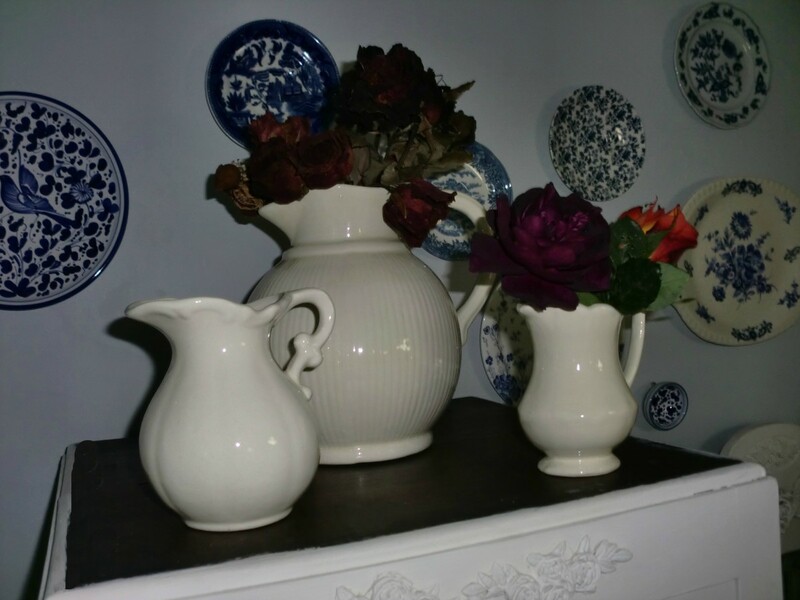 The nursery where I purchased it confirmed my suspicion recently and they told me that it was indeed Black Baccara. 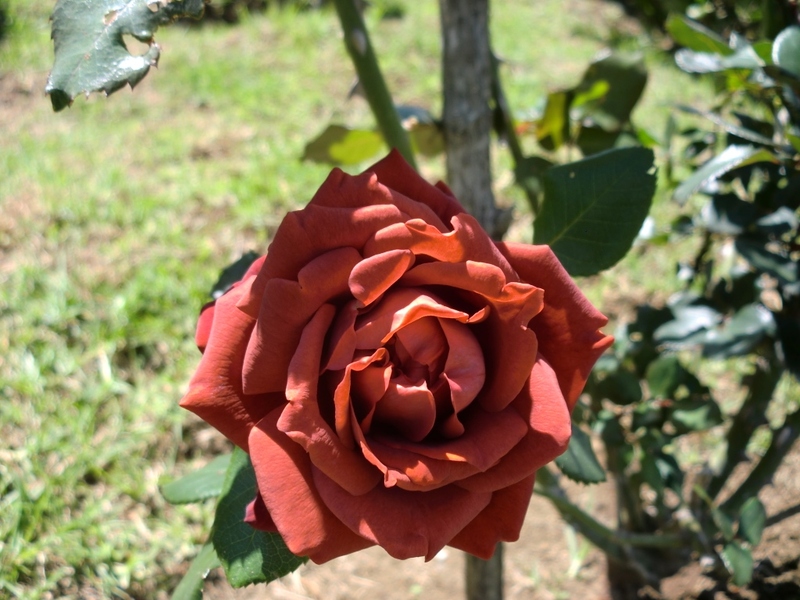 This rose is actually considered to be a very deep dark red but the color on the petals is uneven throughout, thus much of it does look black. 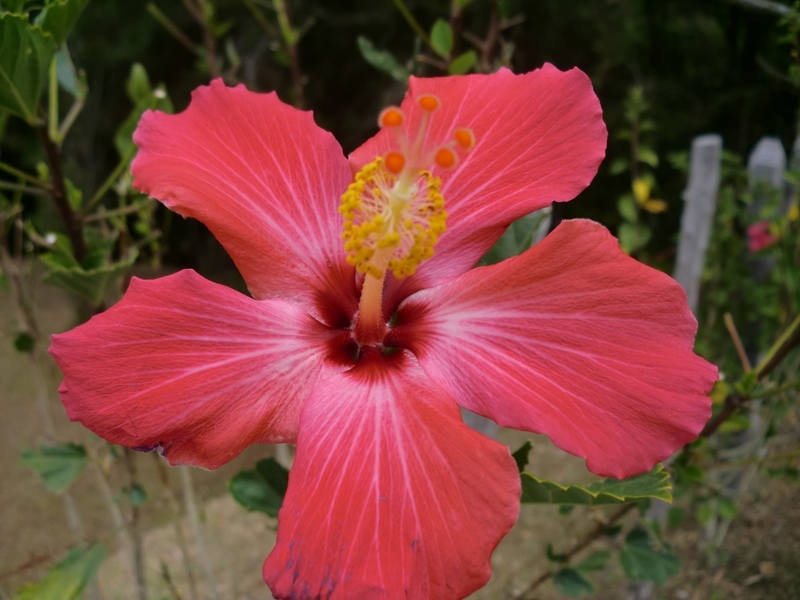 On the same plant some of the blooms are darker and others are redder. Here it is as a bud. 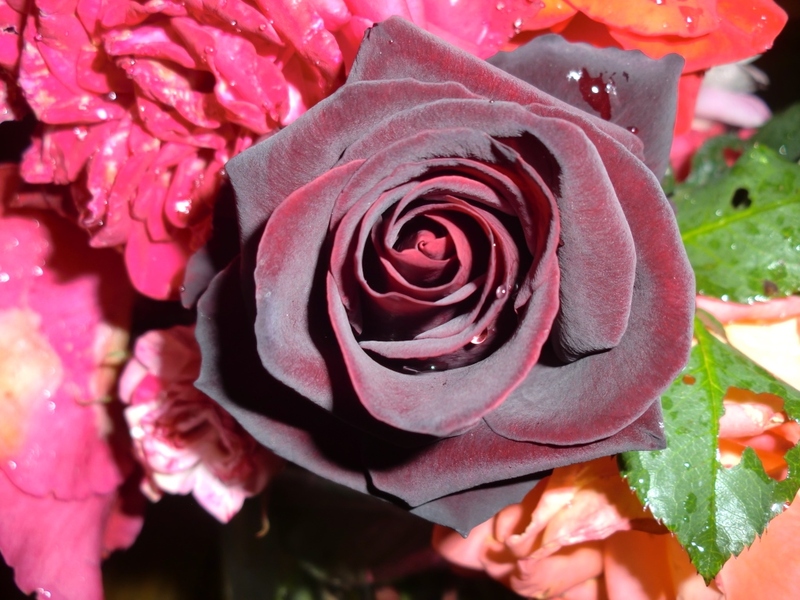 As you can see, the base of the petals is reddish, but above the base and to the tips, it is indeed black. 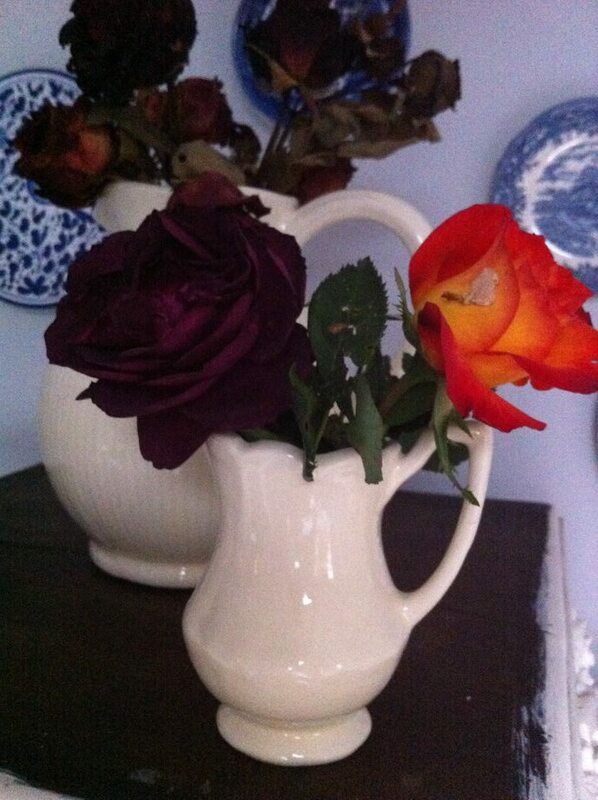 I’ve read that Black Baccara is a very unpredictable rose which sometimes blooms red and rarely blooms black. Apparently it depends on the soil and the climate. I guess I must have favorable conditions here because it does get quite black and you actually have to look very closely to see the tinges of red. 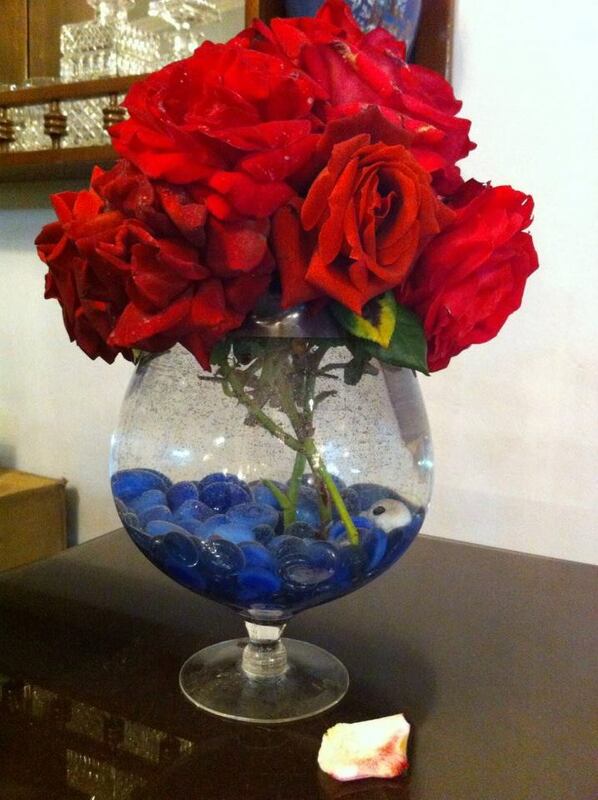 Here it is in a vase. This photo is completely unretouched and it is the true color. Even up close this particular bloom was for the most part, quite black. 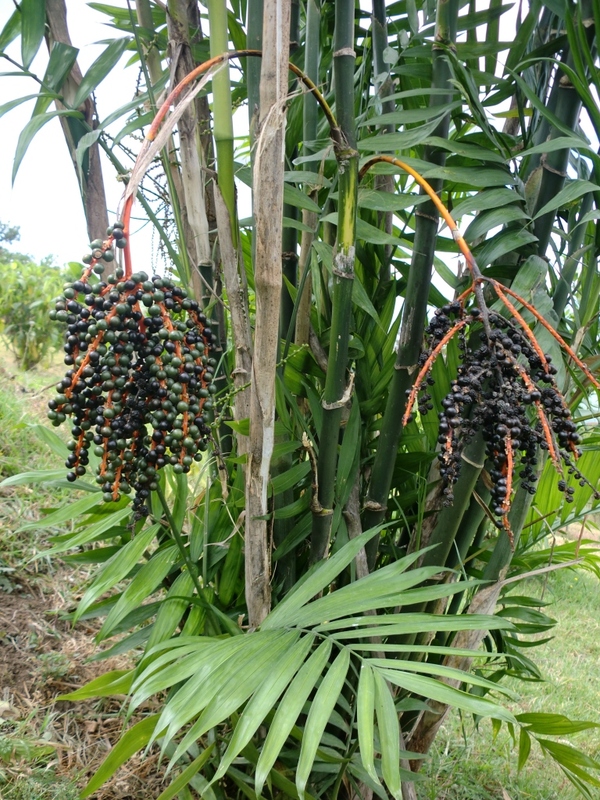 Others from the same bush are sometimes less black and more maroon. 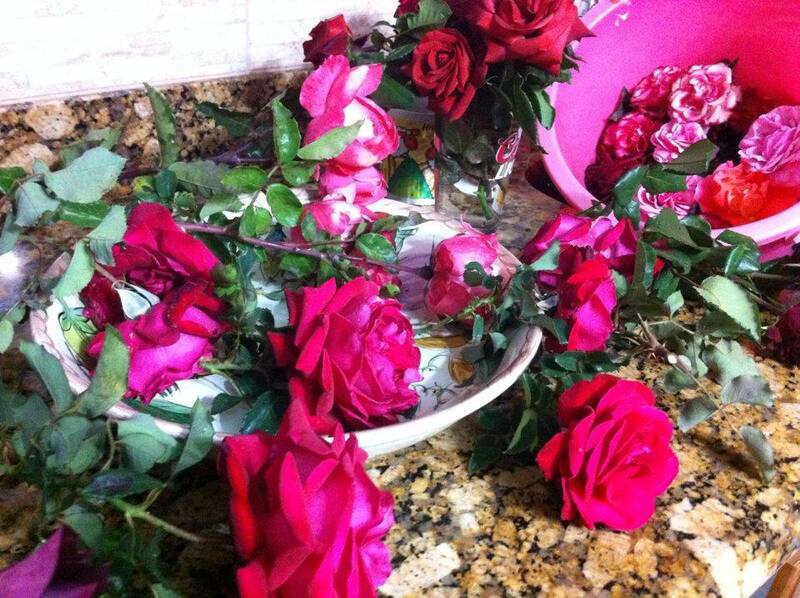 Last week I was about to throw out some faded roses that I had placed in a couple of vases, but I loved the way the colors had intensified as they dried, particularly the black ones so I decided to save them. 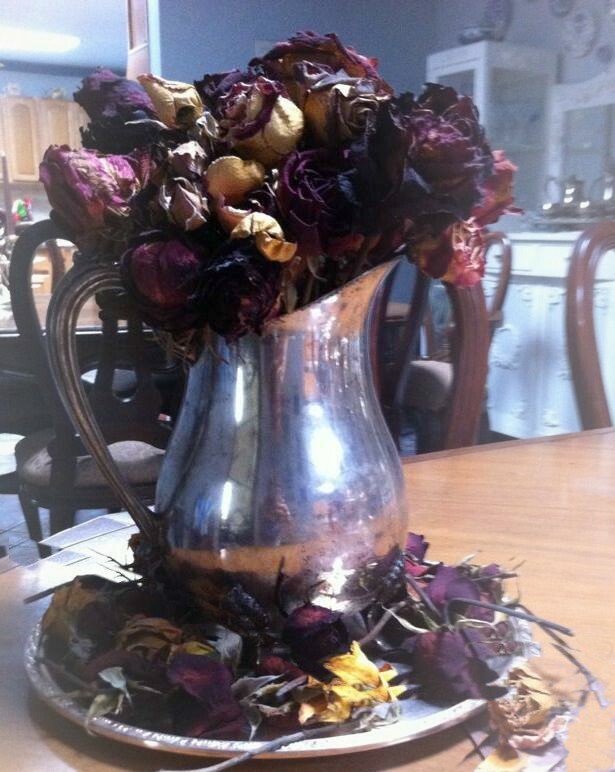 I really like the look of dried roses. 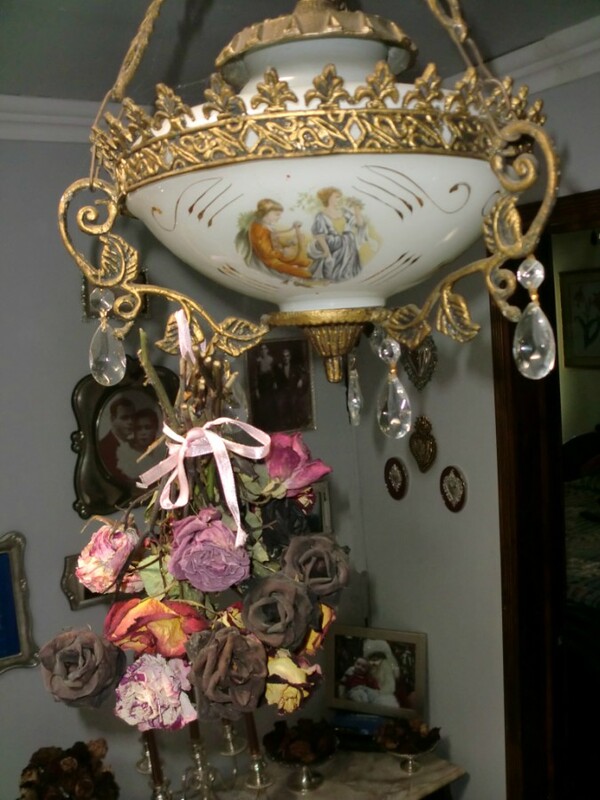 I tied them in a bunch and hung them with a ribbon from a ceiling lamp to finish drying. The sweet fragrance still lingers and wafts of delicately scented perfume reach my nose every time I walk past the hanging bouquets. 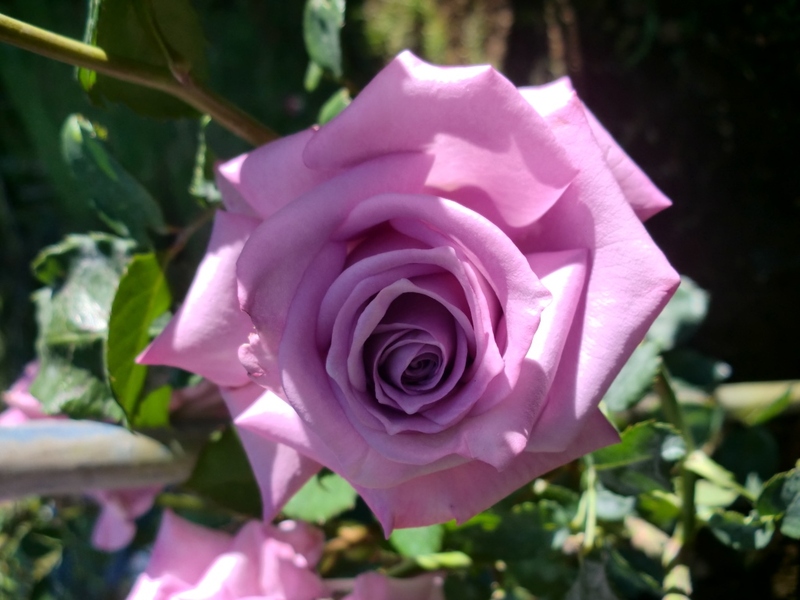 I am reminded of an old Egyptian proverb that says, “Even if the flower has faded, it still retains it’s beautiful fragrance.” The proverb of course is a poetic reference to women who have matured. 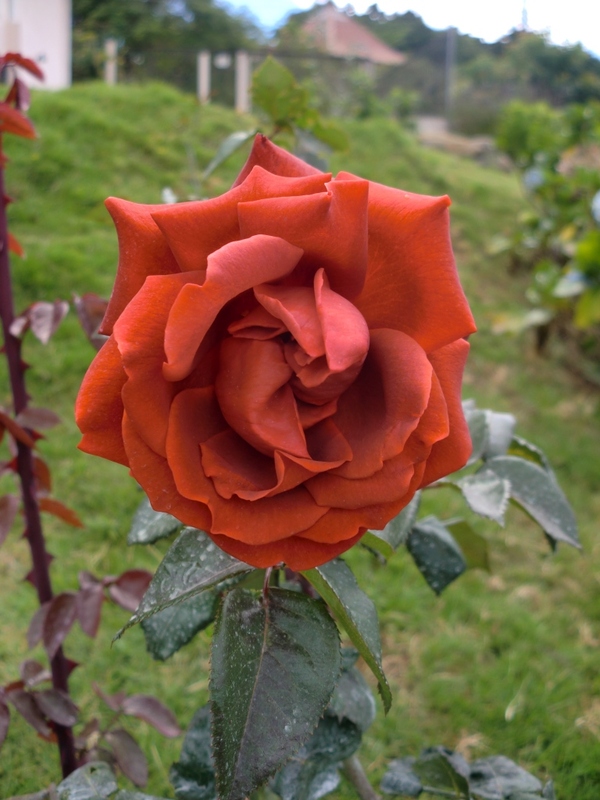 I am always fascinated by the deep russet, gold and burgundy tones that aging roses aquire. 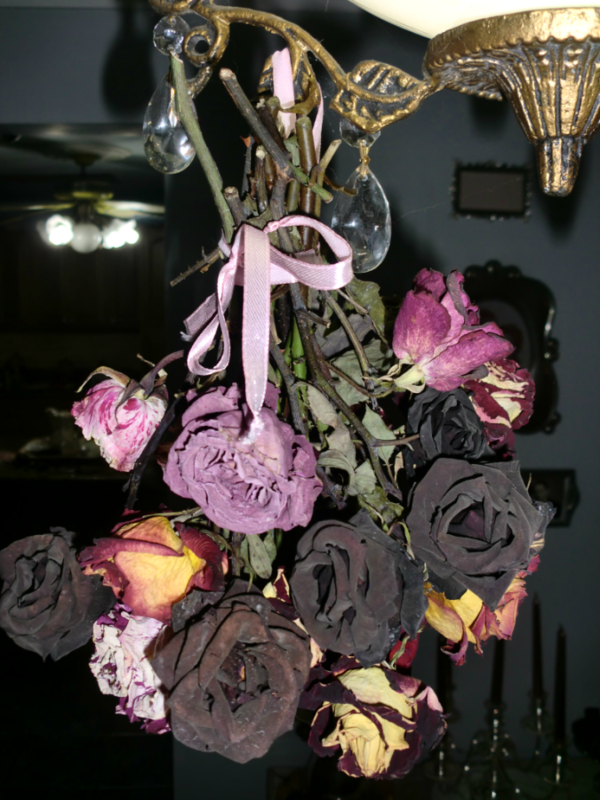 I think I like dried bouquets almost as much as fresh ones and I am thinking that perhaps I can collect enough black roses for a gothic flower arrangement. 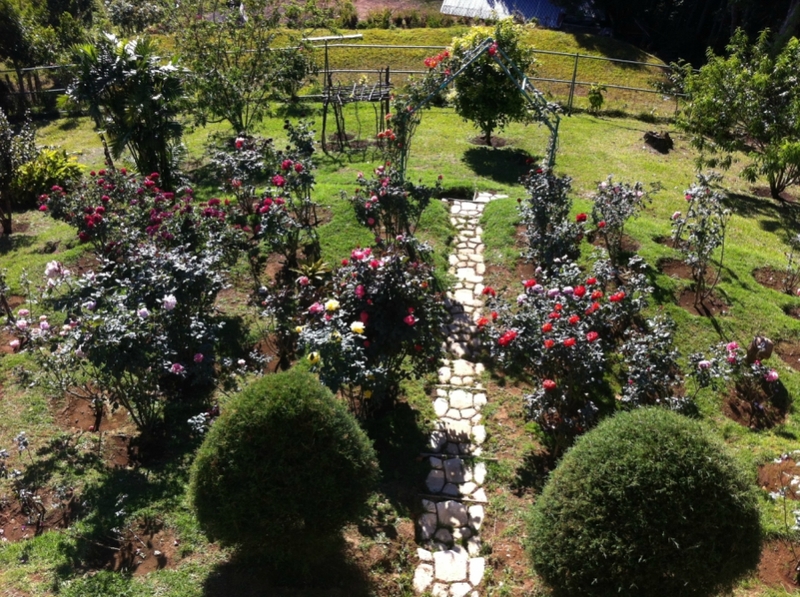 Even though the rainy season has not officially begun yet, my roses have decided to get a head start and they’ve been happily blooming for the past few weeks. I’m certain that it’s in response to the fertilizer I applied over a month ago. They were quick to show their gratitude for the nourishment, bless their fragrant little hearts and I didn’t have long to wait before I began to see buds popping up on almost every single one of them. I honestly felt guilty for having been forgetful with the fertilizer lately. 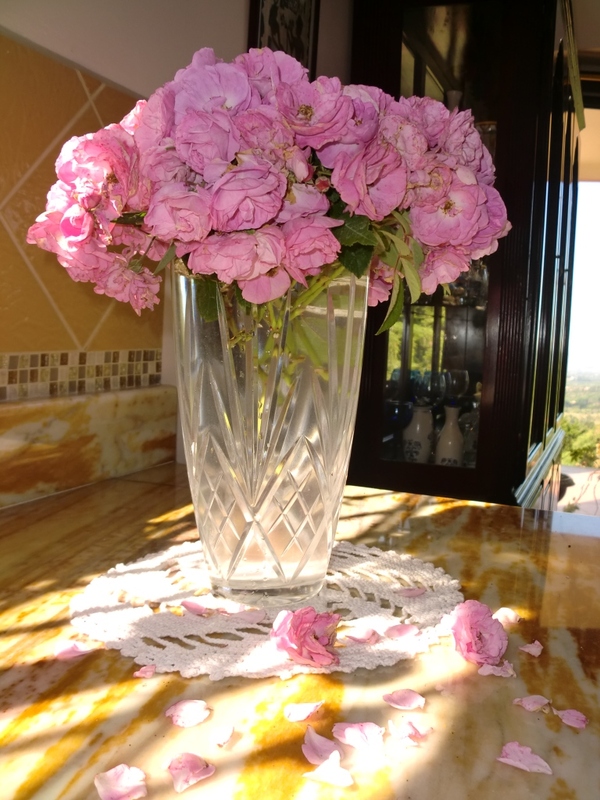 A couple of weeks ago I went out to the garden, scissors in hand and began to snip off bloom after bloom, tossing them into a water filled plastic bucket to keep them fresh under the blazing sun until I could get them in the house and into vases. I guess I must have gotten carried away because I didn’t realize I had cut so many until I brought them inside and began to separate them by colors. 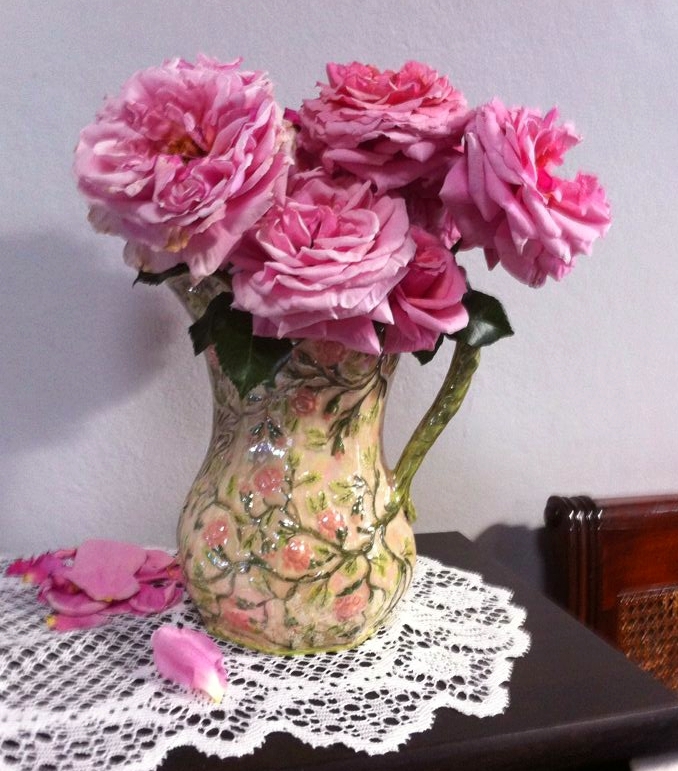 The best thing of all was the heavenly fragrance! 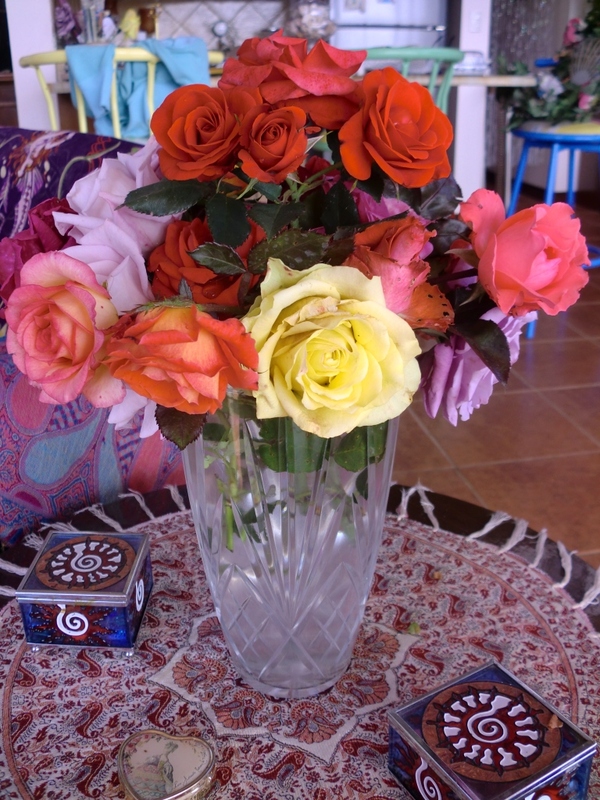 The whole house was perfumed with a myriad of different rose scents some light and lemony, others more heady and intense. I am always in awe of the smell of flowers and can’t help being dissapointed when I come across one that has no fragrance. I was tempted to leave them all lying on the counter in a lovely disorganized mess but I needed the countertops for other things and they desperately needed water to quench their perpetual thirst. 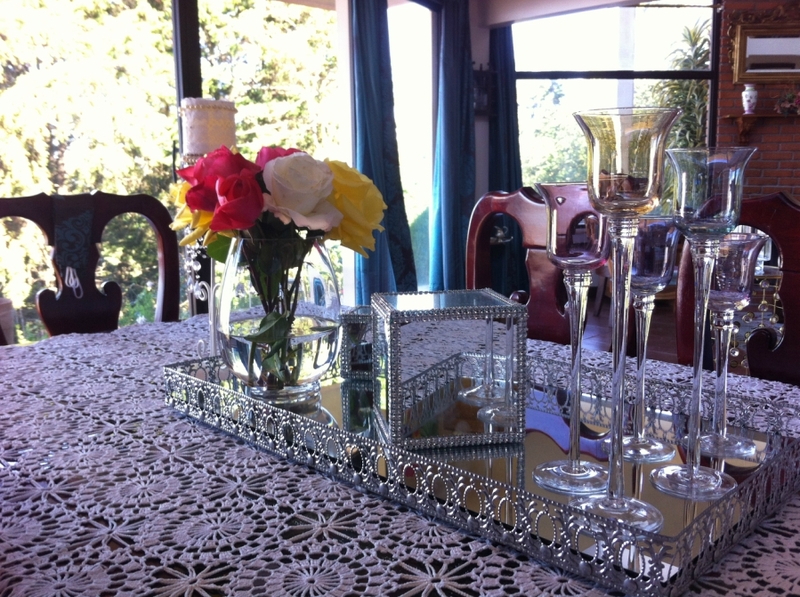 These went into a crystal vase and onto the round dining room table in the smaller dining room. 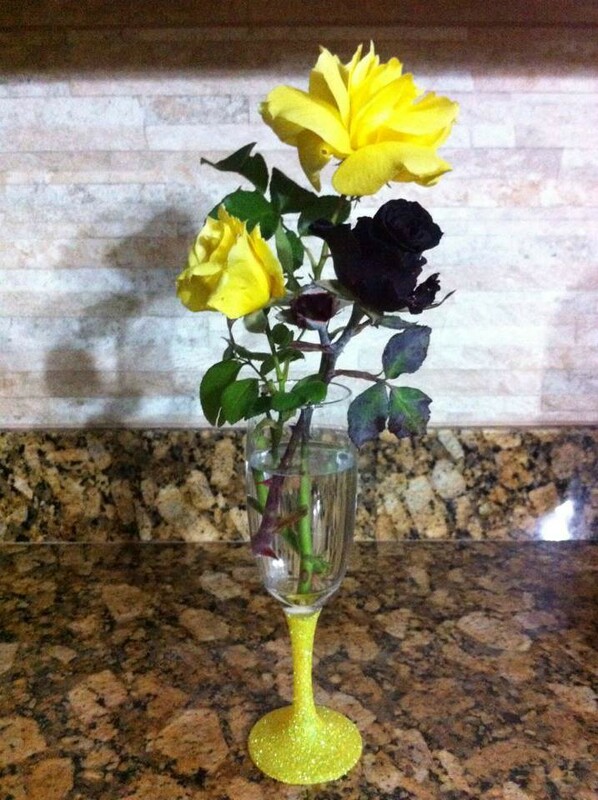 These dark violet roses with a delightful lemony scent were placed on top of the piano in a goblet with a matching violet stem. 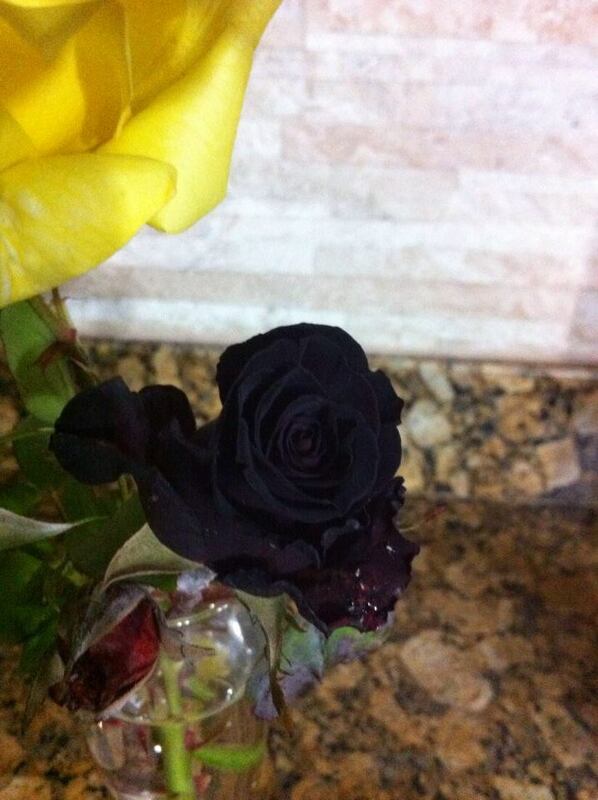 This is the nearest to black rose I have ever seen. They didn’t tell me the name of it when I bought it at a local nursery but I think it might be Black Baccara. 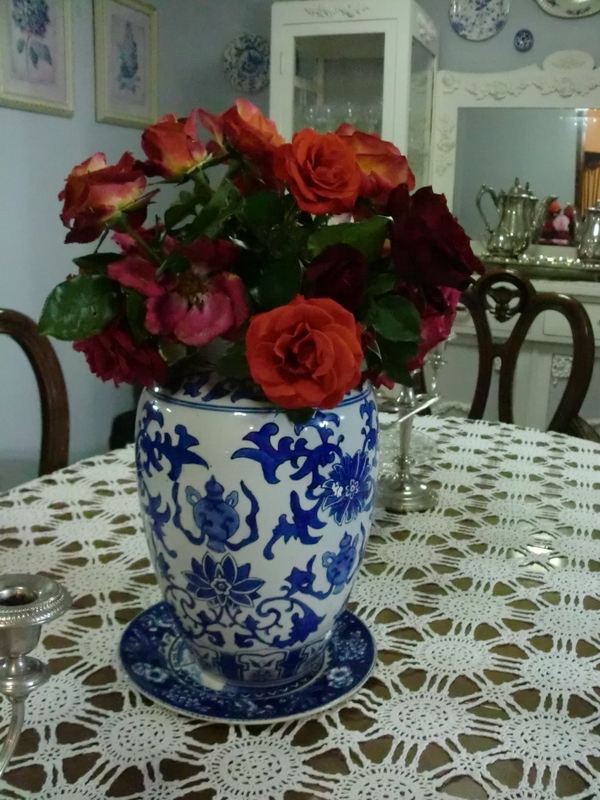 The blooms are on the smallish side but the unusual shade more than makes up for that. 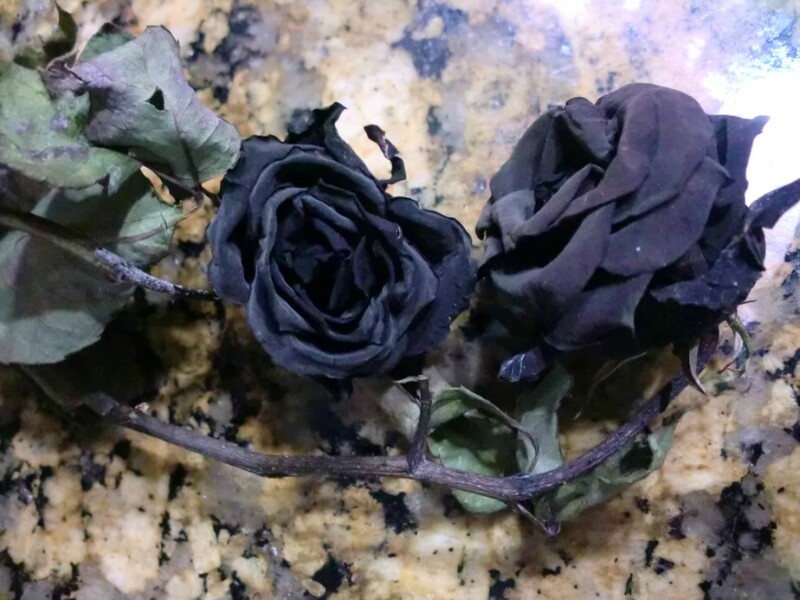 They aren’t really black, as there is no such thing as a black rose. But when the buds are closed most of them really do start out quite black. 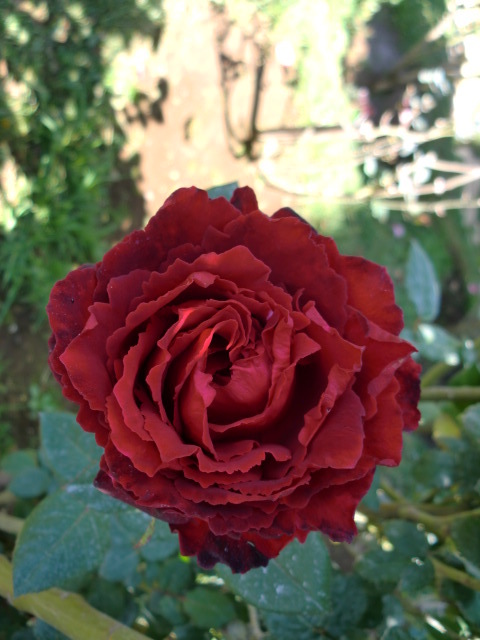 As they open, the petals begin to turn a deep dark blood red at the base, but the tips always remain black. 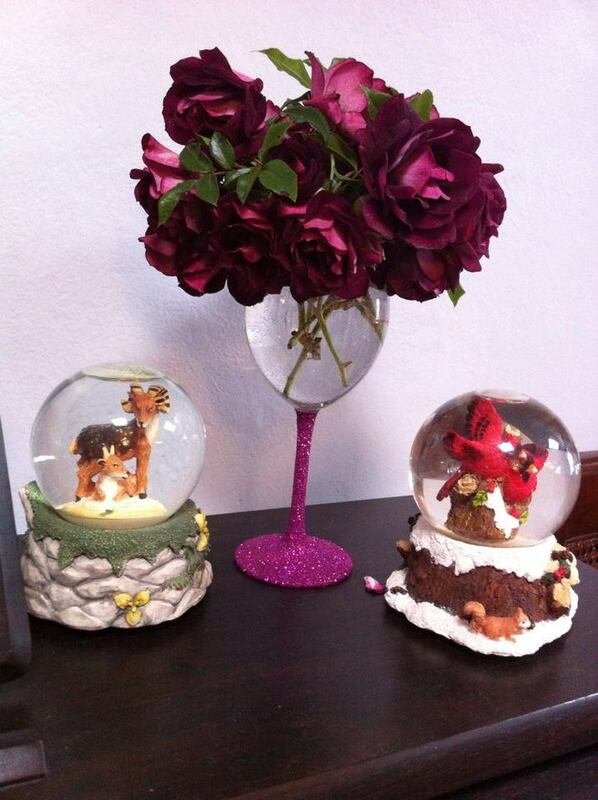 I put it next to a couple of yellow Queen Elizabeth roses for contrast in a matching yellow stemmed glitter goblet. 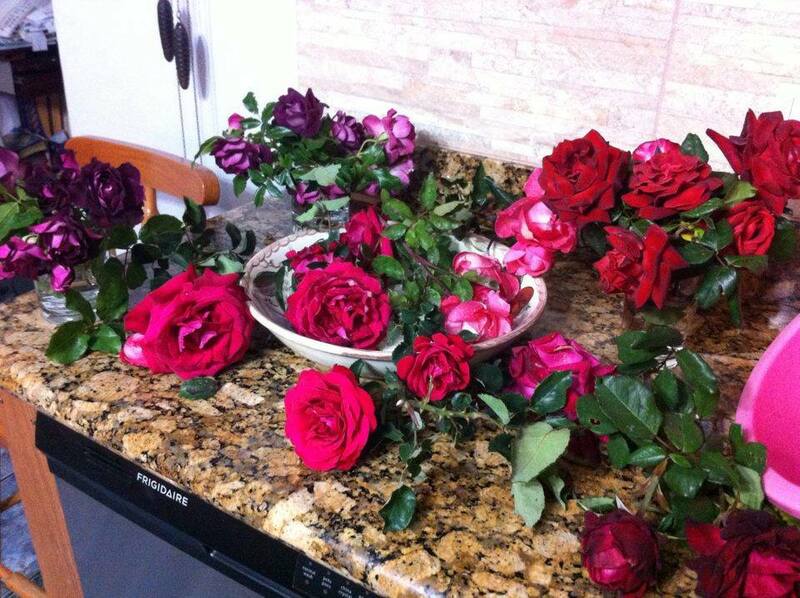 But it’s not just the roses that have been blooming. Other residents of the garden are flaunting their colors too. 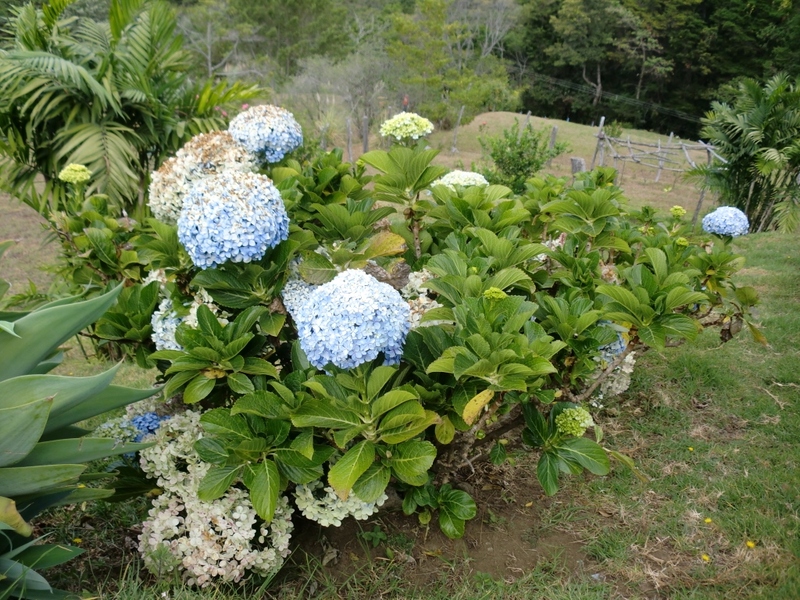 These bright blue hydrangeas bloom year round here. I don’t think I’ve ever seen them without any flowers and they seem to thrive in the humid foggy weather up at the mountain house. 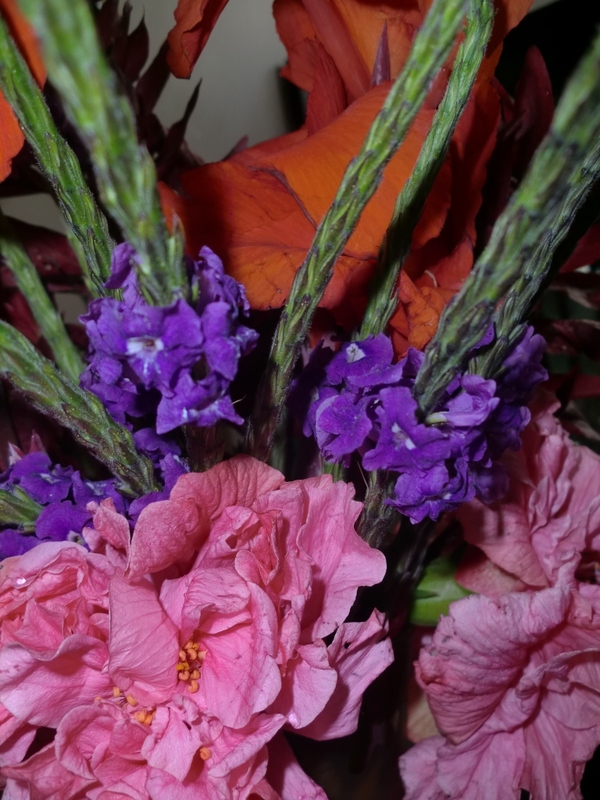 Sometimes when I get tired of blue I let the flower heads dry on the plants and then dip dye them in different colors. Hollyhocks were blooming in my city garden. That’s very unusual because I don’t think hollyhocks normally like tropical weather . But they seem to be oblivious to the heat and they have grown almost as tall as the house. I planted these from seed that I ordered on Ebay. 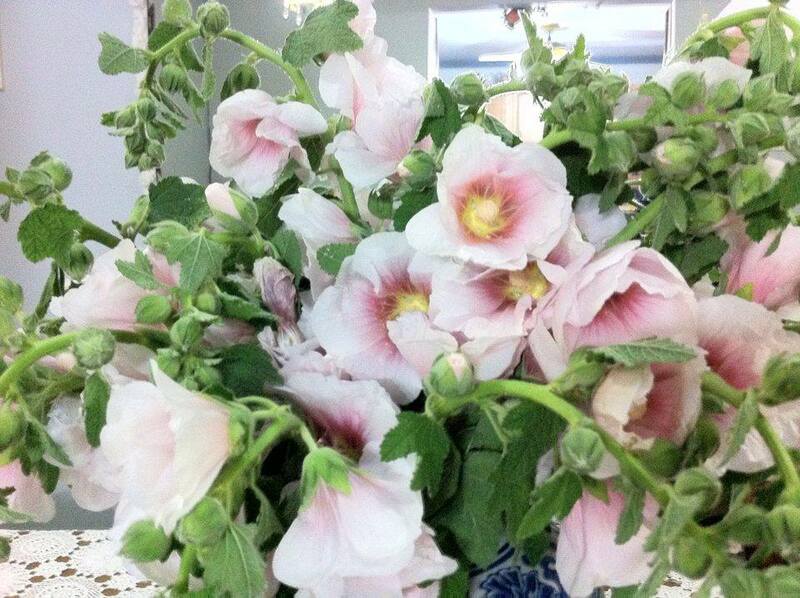 I have never grown hollyhocks down here in my city garden before where it’s so much warmer than our mountain house. 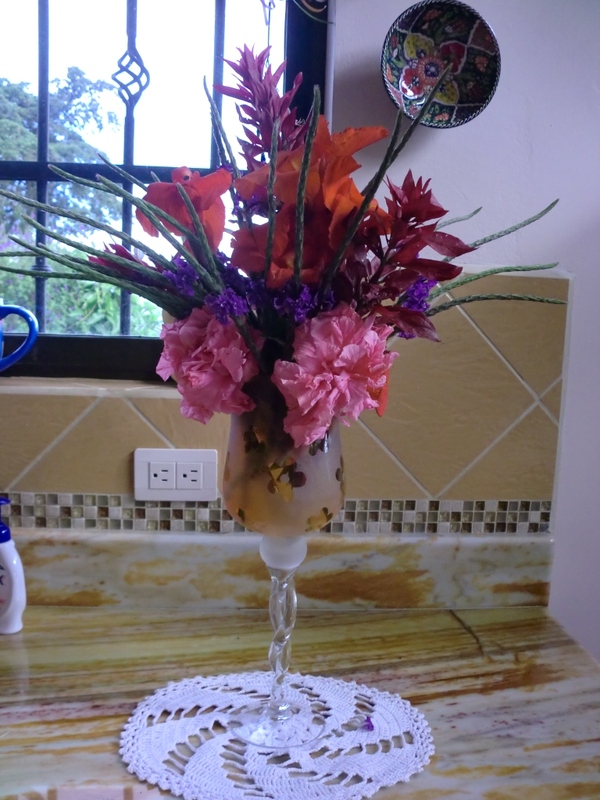 I wondered if they’d make good cut flowers. I discovered that they aren’t as long lasting as other flowers but they look pretty in a vase for at least a couple of days. 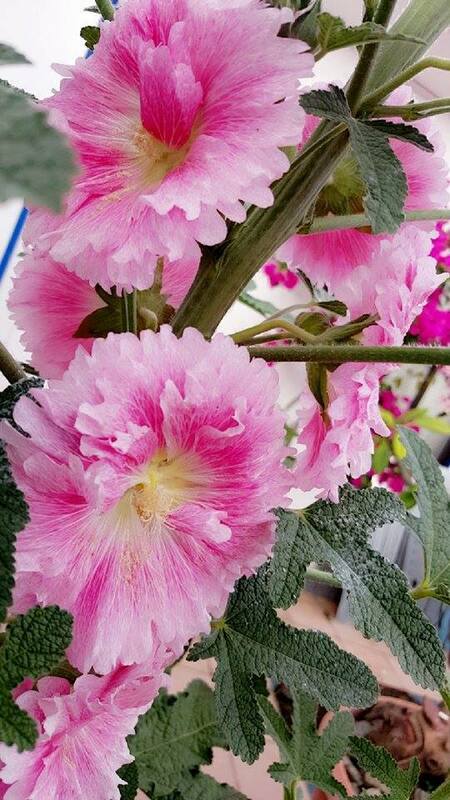 These are ruffly hollyhocks in a darker shade of pink than the other ones. They are just beggining to bloom. My potted bougainvillea hadn’t bloomed in over a year and I didn’t know why. 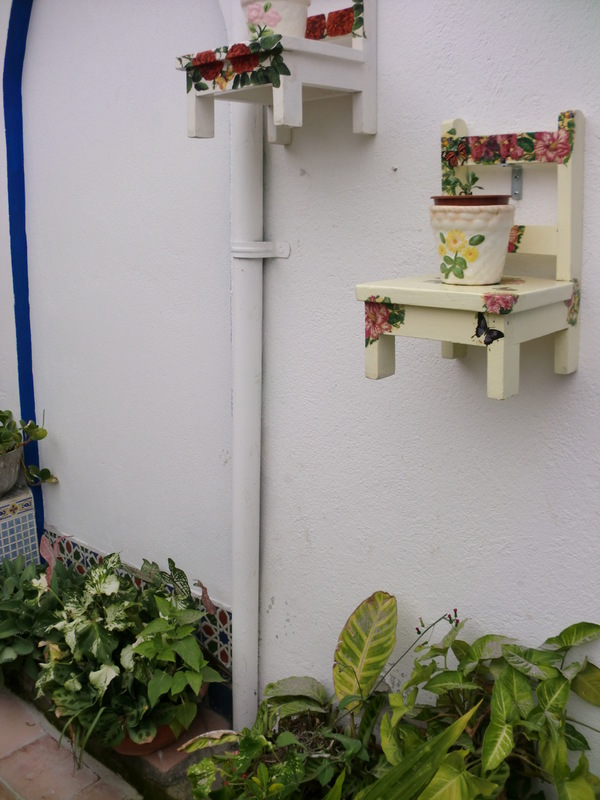 I fertilized it, watered it, pruned it, scolded it and still no flowers. 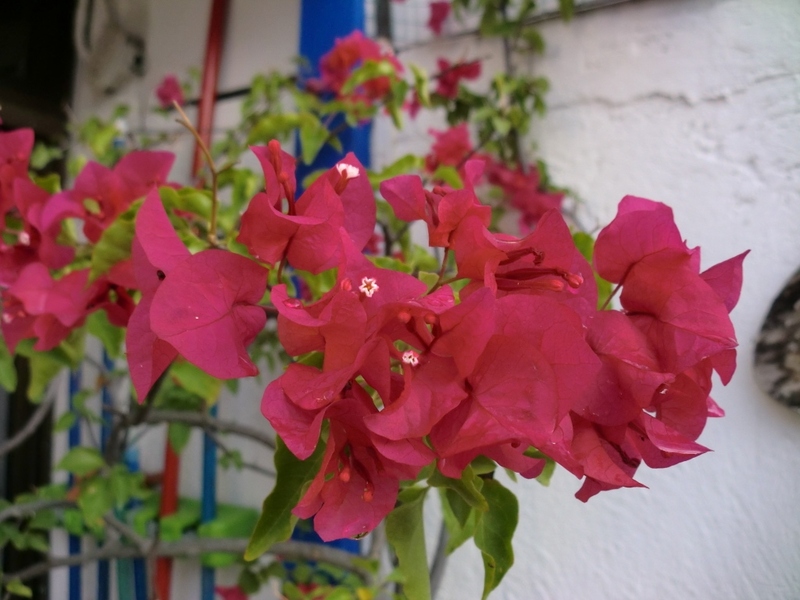 Then I read that bougainvilleas need quite a bit of sun in order to bloom, so I moved it over to a sunny spot in the courtyard and within a week the flowers began to appear. Then there is the frangipani. Oh the intoxicating fragrance of this beautiful flower! It’s just impossible to describe it in words. Sometimes I go out to the patio on warm evenings just to inhale the delicious perfume that hangs and lingers heavily in the air. It’s so much stronger at night. 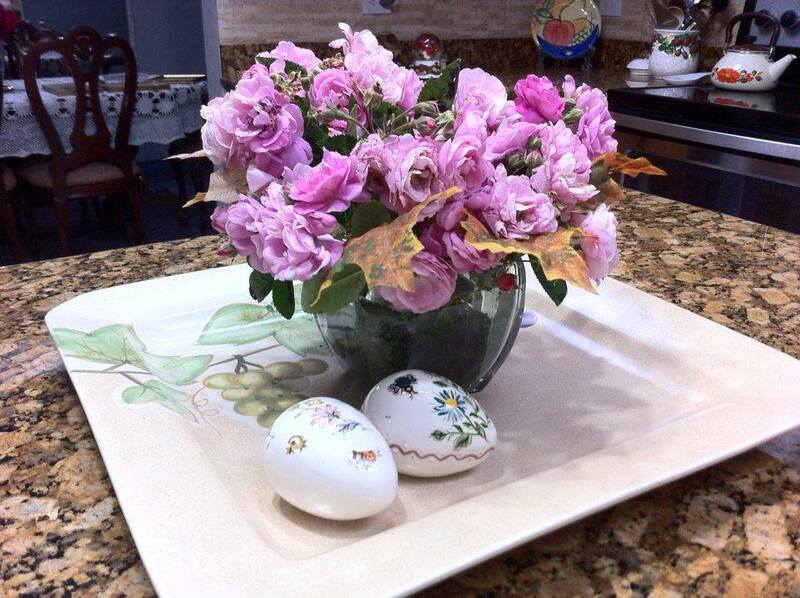 The flowers burst forth in clusters, like little ready made scented bouquets just waiting to be put in a vase. 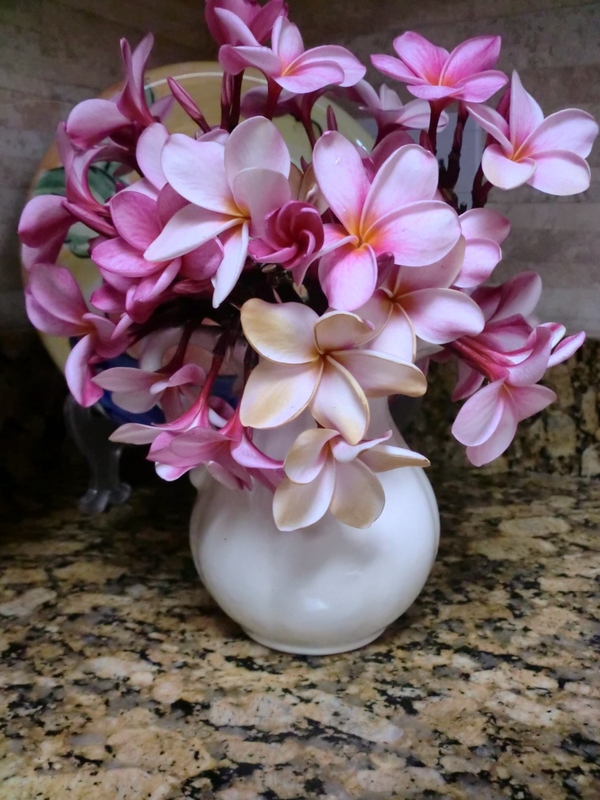 I always thought that frangipani (or plumeria as it’s also called) was a hawaiian flower because it’s what leis are made with. But I was surprised to discover that its not native to the South Pacific at all, but rather to Central America, where I live. No wonder it thrives in my garden. 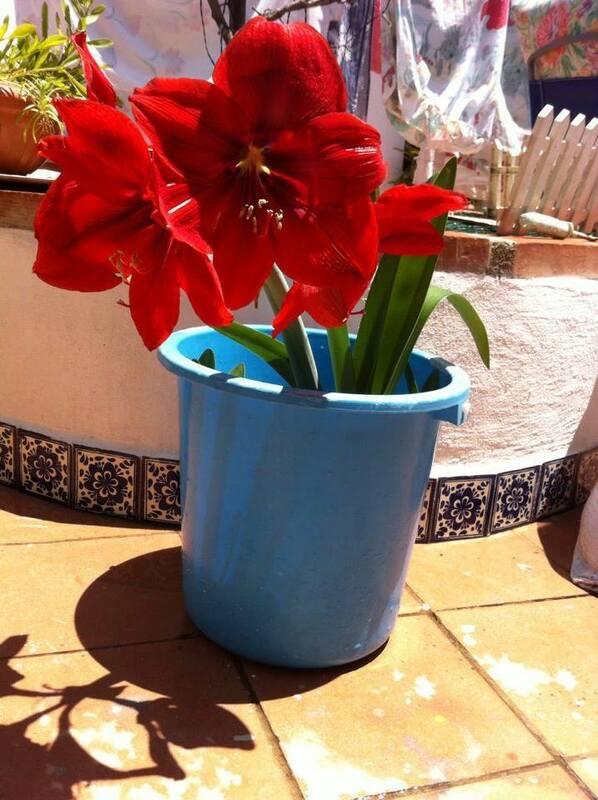 These giant Amaryllis have been piled inside this plastic bucket without any soil for over a year. I dug up about 50 bulbs last year and replanted most of them in a different location but I got lazy with these last few bulbs and forgot about them. Much to my surprise, they bloomed anyway despite the neglect. 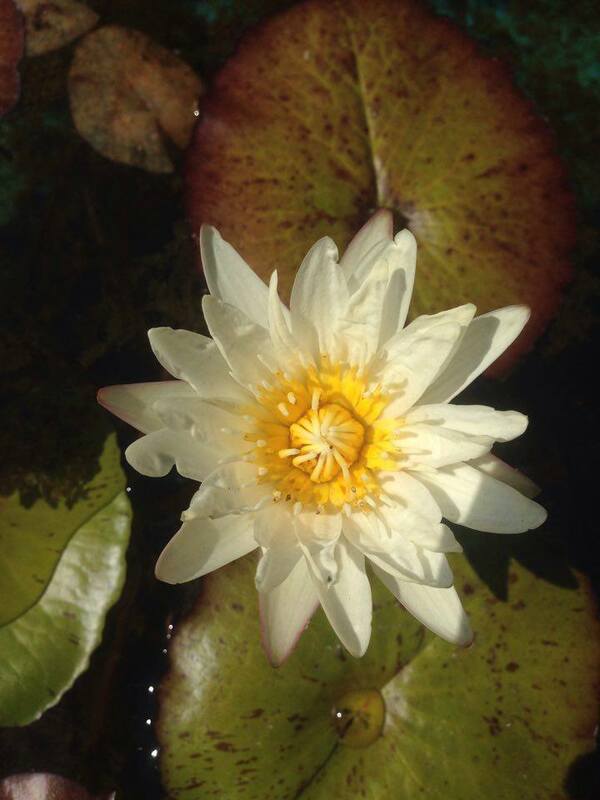 This waxy ivory water lily with a yellow center grew from a seed that I ordered from China. Actually four of them germinated and grew into adult plants but as is common with seed grown water lilies the new plant is never the same as the parent plants. Two of my seed grown lilies have bloomed but I was dissapointed with the first one because it produced an insignificant little flower about the size of a quarter, barely visible among the giant pads. 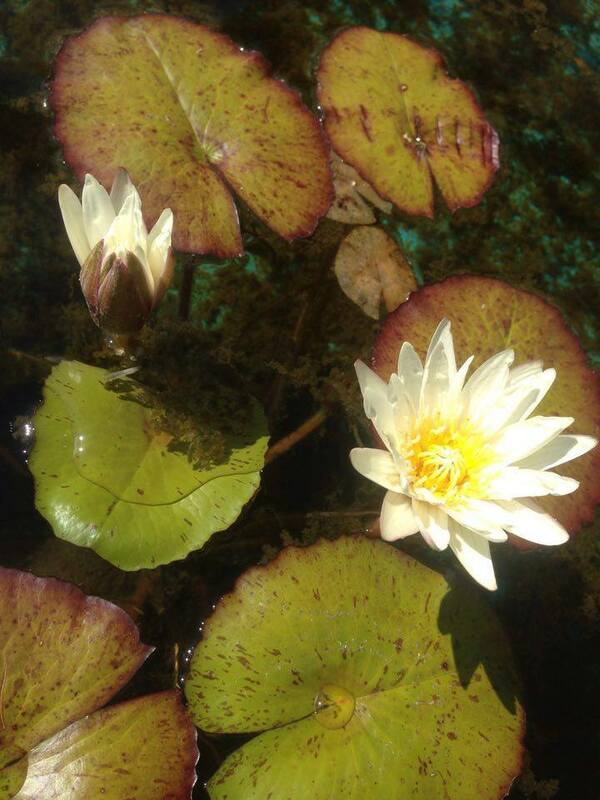 However, the second plant produced large showy cream colored flowers that look lovely floating gracefully on the tranquil surface of the pond and the leaves themselves are beautiful, speckled and multi shaded. Since it is a new and yet un-named variety of water lily grown from seed, I was free to name it anything I wanted. So I named it Samia Gamal, like the famous Egyptian dancer of the 1940s who also seemed to float gracefully when she danced. There were many things blooming in my garden this past week-end. 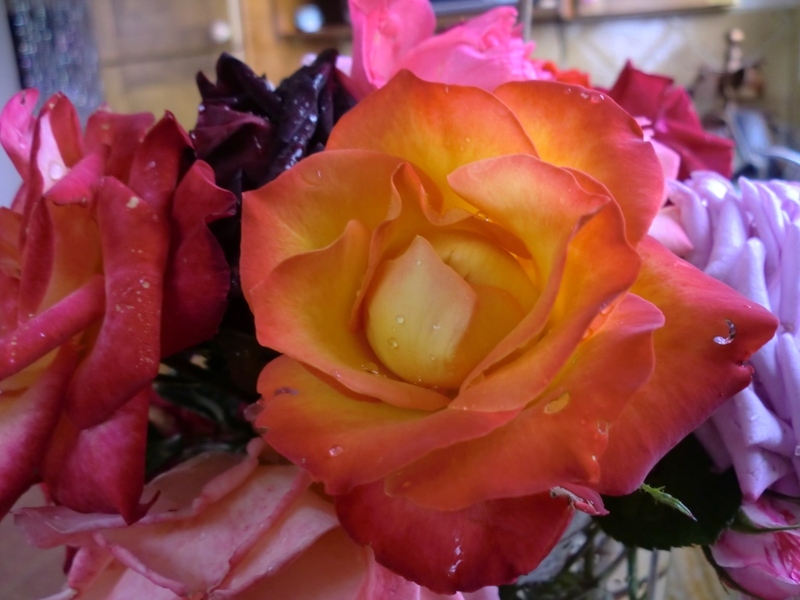 In spite of having neglected my roses for the last couple of months, Mother Nature has been forgiving and has given me an extraordinary gift of color and fragrance. 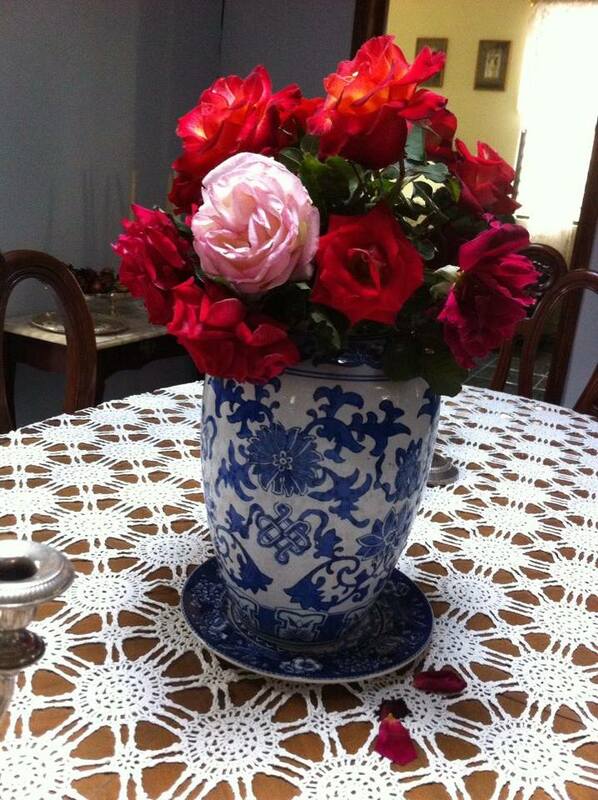 I was able to cut enough flowers for several bouquets to bring down to our city house and enjoy all week long. For the past couple of months I’ve been organizing the storage rooms in our store and haven’t had as much time to spend in the garden as I would have liked. I found weeds sneaking their way into the rose beds and algae threatening to take over the pond, embracing the water hyacinths and creeping up on the lily pads. Everything was thriving. 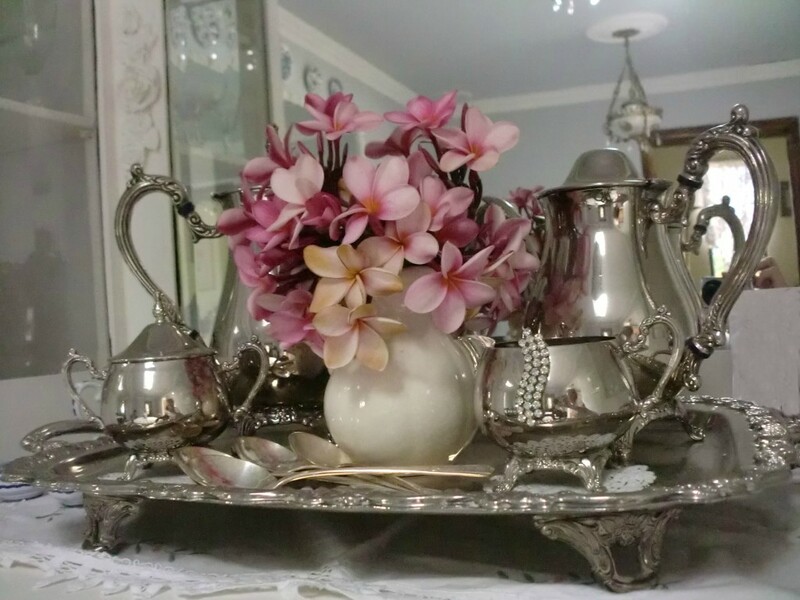 The Lilies and the Amaryllis were in full bloom. 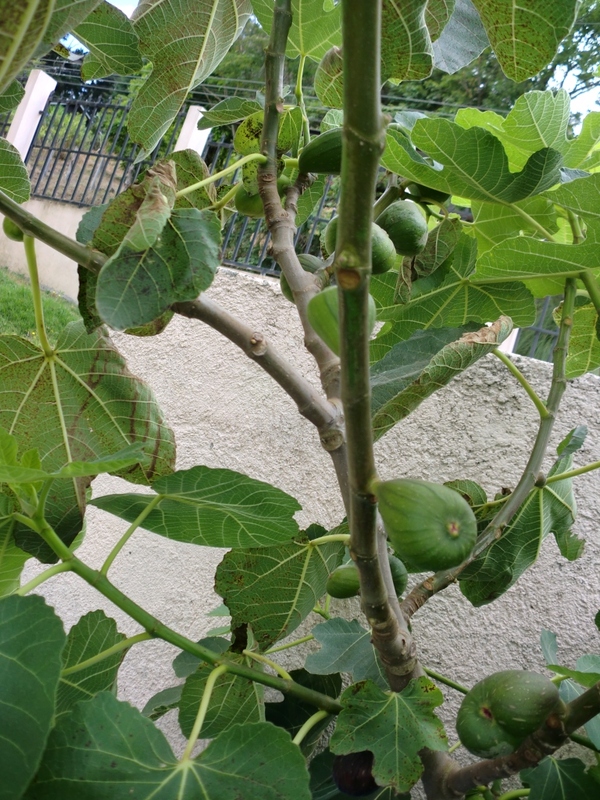 The little fig tree was laden with small green figs that will very soon ripen into plump black giants which will be turned into a delicious fig compote to be eaten with fresh cheese. 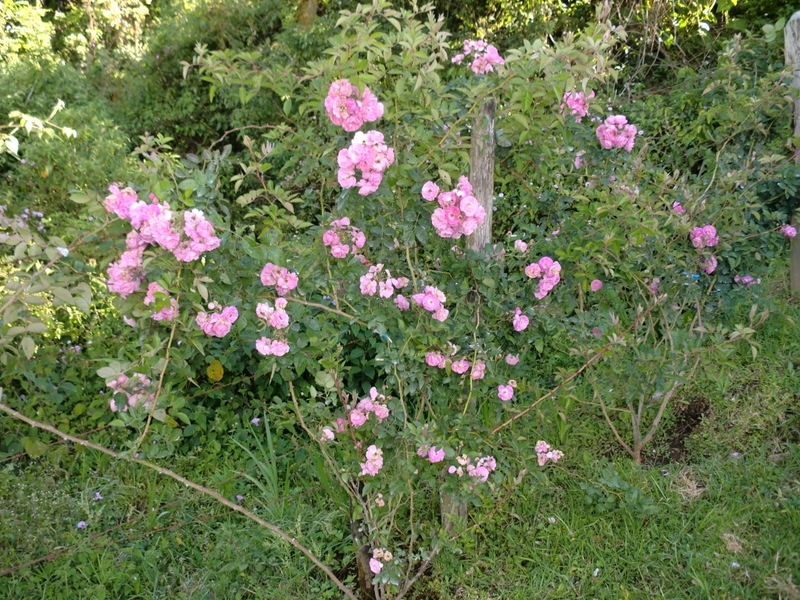 Even the nameless pink rambling roses that cling to the fence all along the property line were almost exploding with bouquet-like clusters. 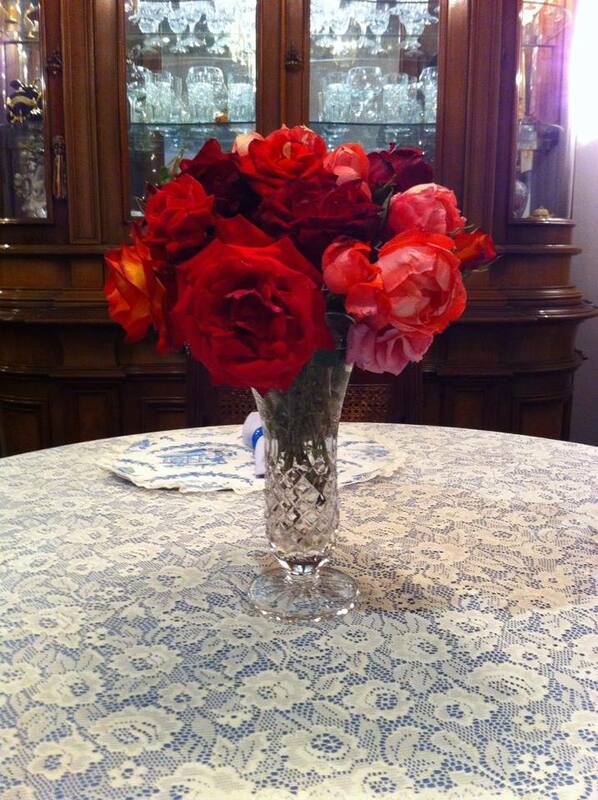 Roses with regal names like Miss Amber, Mr. Lincoln, Princess De Monaco, Queen Elizabeth and Diana Princess of Wales all contributed fragrant blooms which were placed in pretty vases. Someone is very sleepy and probably not even thinking about nibbling flowers…..
We’ve had a welcome respite from the rain these past couple of weeks. I love warm sunny days when I can go out in the garden at any hour without worrying about menacing thunder clouds lurking on the horizon. But it’s literally the calm before the storm and I know it won’t last. In just a few days time, the break will end and the daily downpours will resume once more. 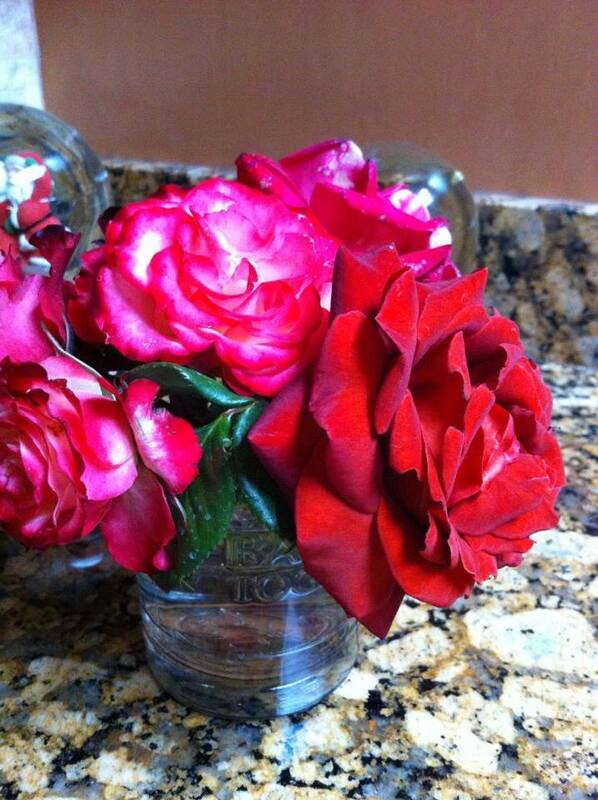 This week some of my Abracadabra roses were in various stages of bloom. 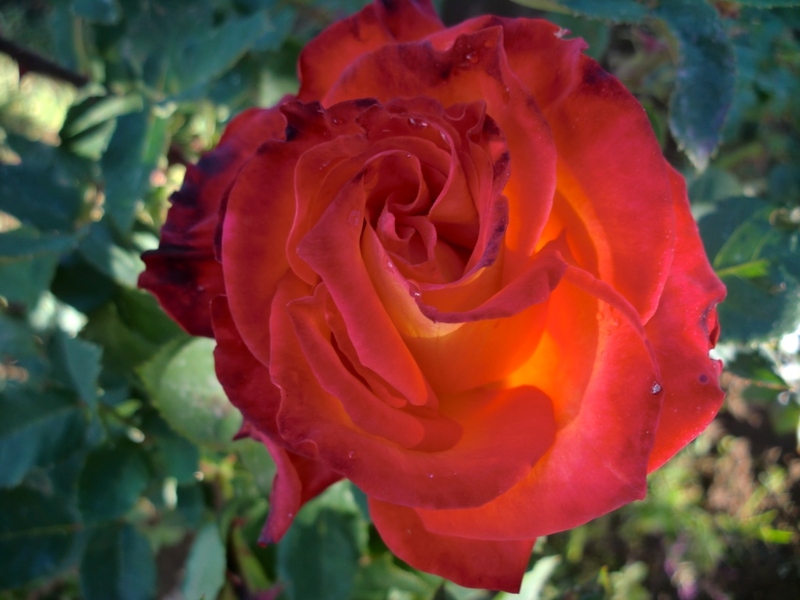 This is one my favorite roses. I’d been coveting one for the longest time but I was unable to find any nurseries that sold them. The only place I had ever seen Abracadabra for sale was in Australia. That was a tad too far for me. 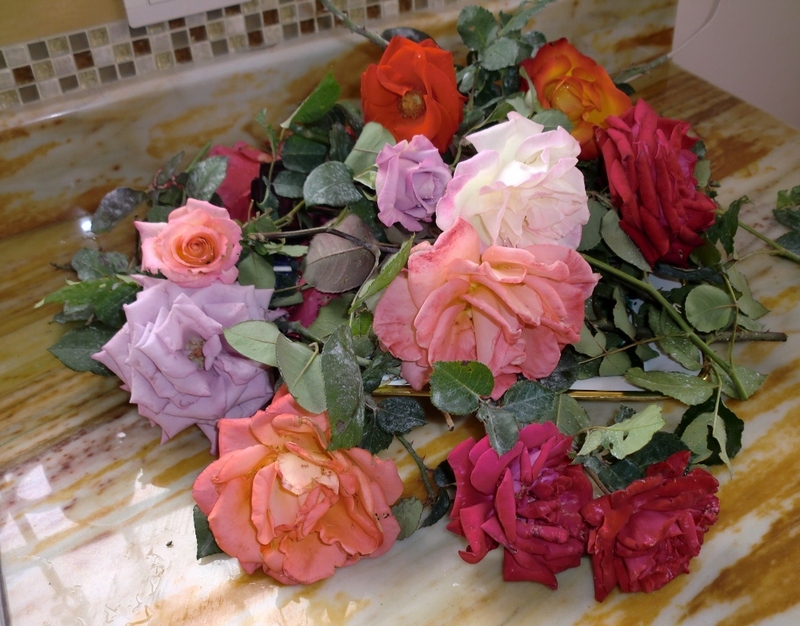 I regularly checked all the major rose vendors in the U.S. and Europe as well as on Ebay and even Google but I had no luck. 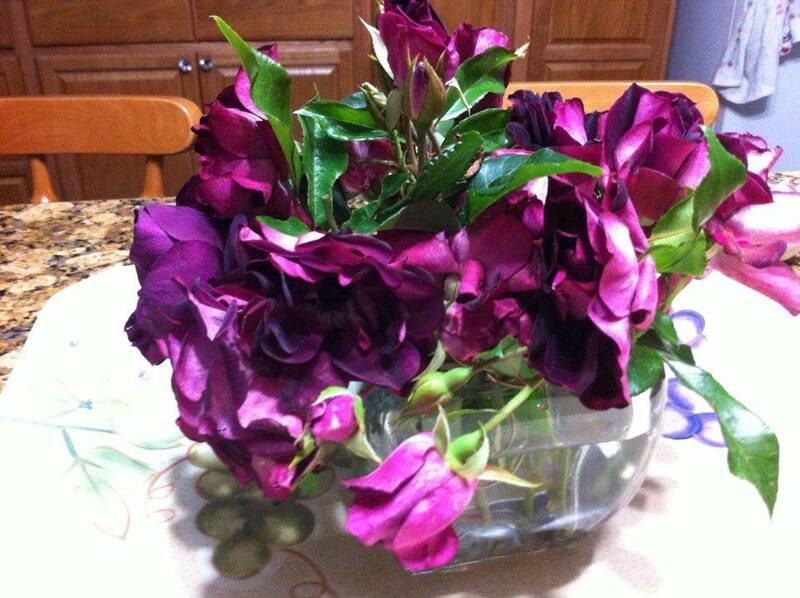 Apparently not too many sellers carry Abracadabra because it’s a very unreliable rose as it doesn’t always produce the same color of blooms. 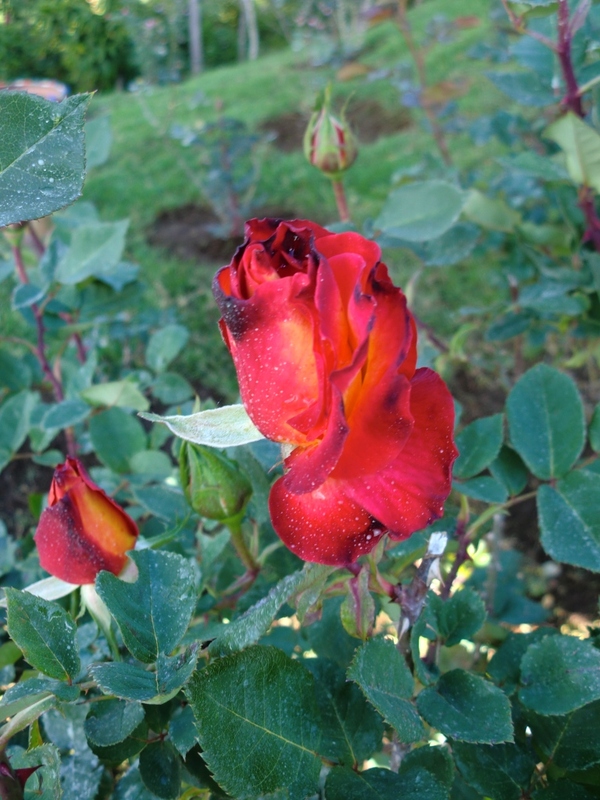 Some plants produce the desired burgundy blooms splashed with bright yellow, however other plants can produce solid burgundy blooms with no trace of yellow. 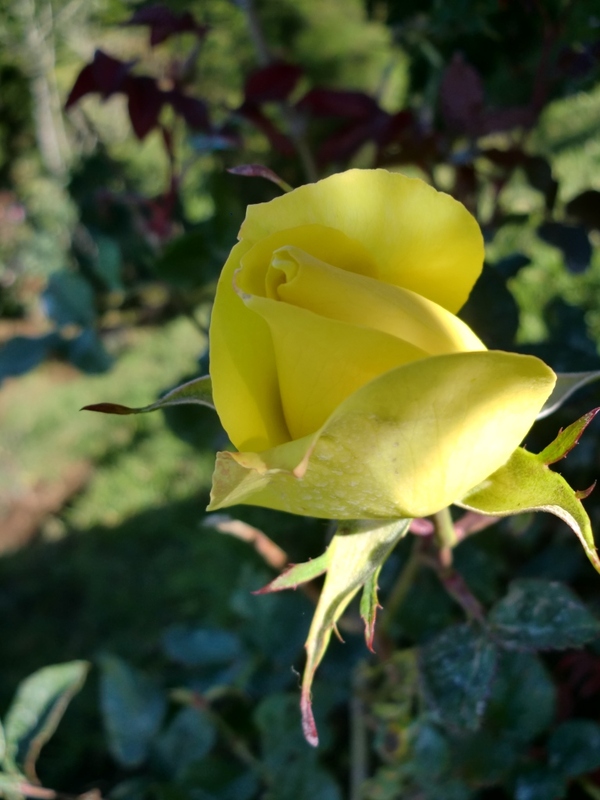 Or yellow blooms with no trace of burgundy, or half yellow and half burgundy. The combinations are endless. 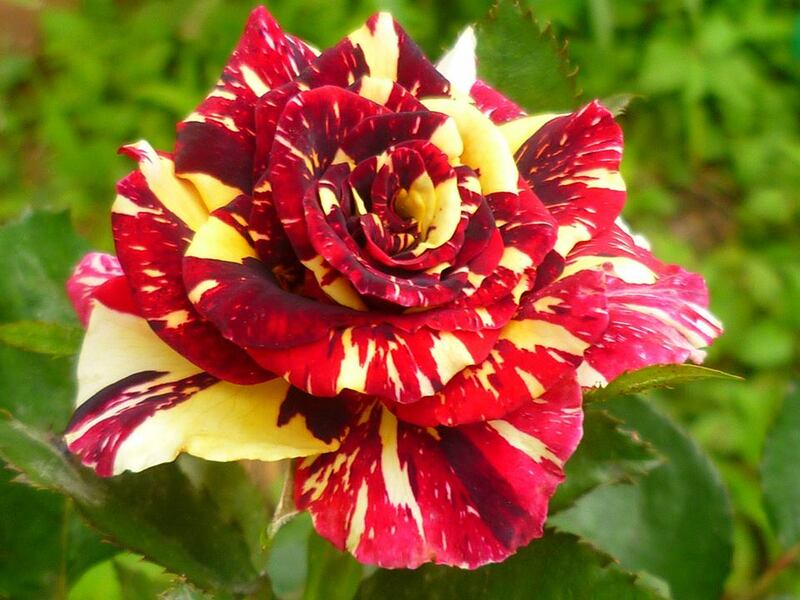 Additionally, the same plant can produce both solid and striped flowers. You never really know what it’s going to do. I had pretty much given up on finding any for sale and had accepted the fact that this rose was about as elusive as El Dorado. 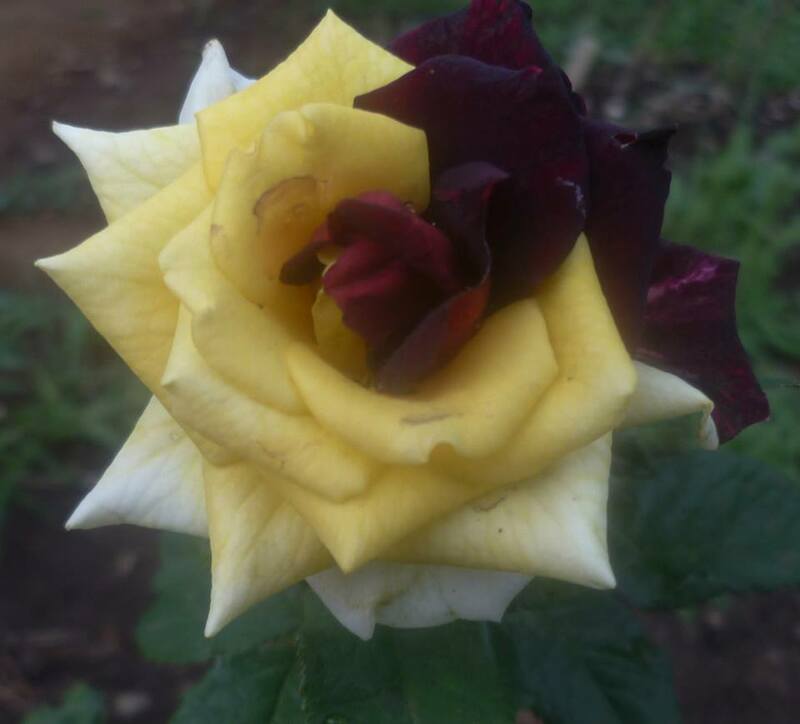 Then one day I noticed a post on a Facebook plant group in my area where someone had posted a picture of an abracadabra rose. I snickered. Surely nobody could possibly be selling these in Costa Rica of all places. A few days later, there it was again. The same photo. This time I asked if they had them for sale and to my complete surprise, the seller responded that indeed he did. For just four dollars a plant. So after getting vague directions from the seller over the phone, I drove out with one of our store employees to a run down old farm that was pretty much out in the middle of the jungle and perched on the edge of a deep ravine. 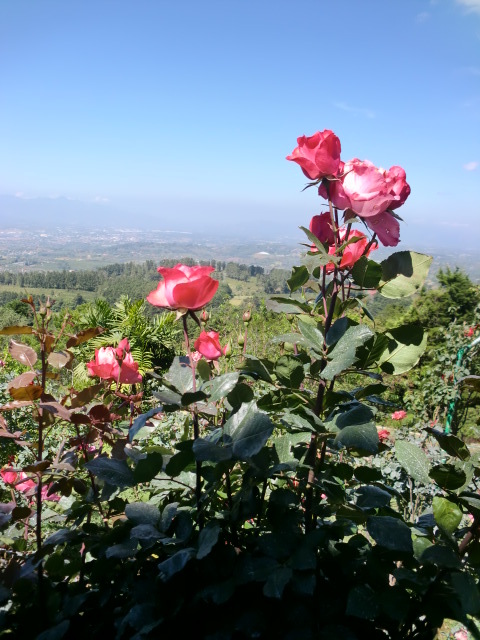 I have to say that I was more than a bit uneasy, but my yearning for that rose superseded all caution. 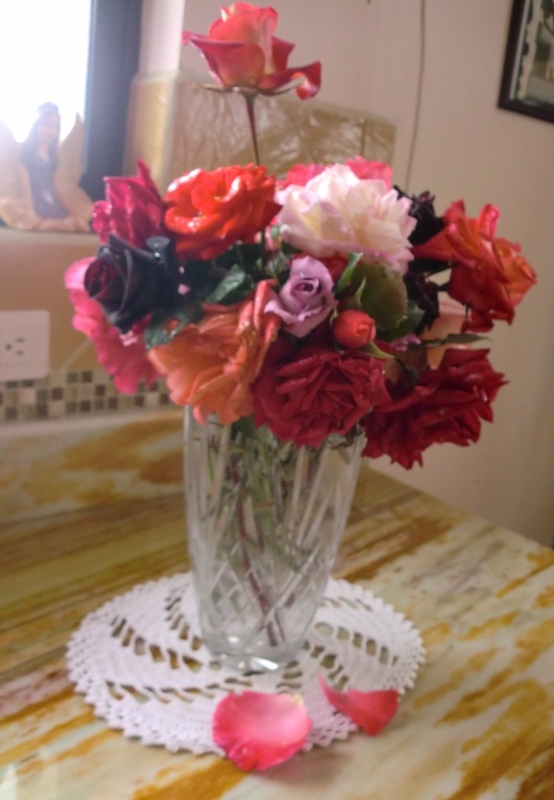 I half expected to be greeted by someone who was a cross between Freddy, Jason and Hannibal Lechter but instead I was greeted by a very gentle and kind older gentleman with graying hair tied neatly in a pony tail, who’s hobby it was to putter in the garden and to experiment with rose grafting. 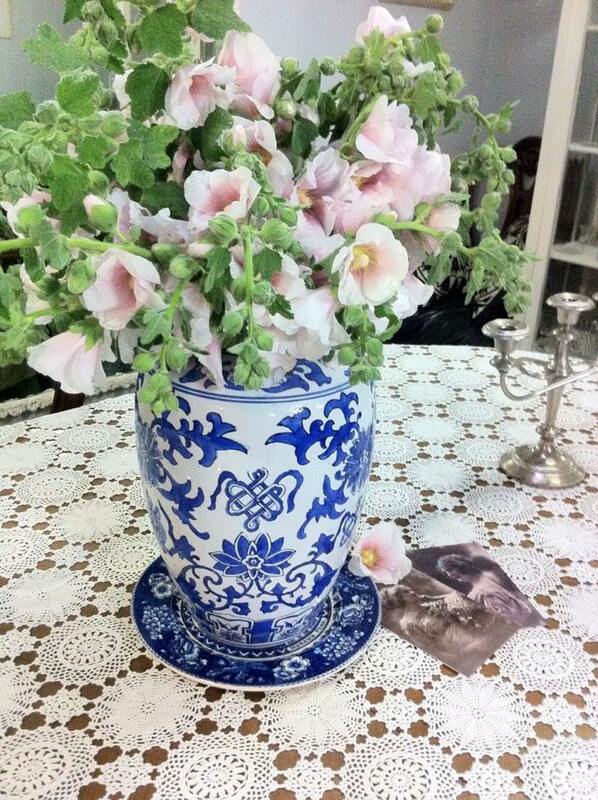 He explained to me that a friend of his had given him some cuttings of Abracadabra some time ago which he had rooted. 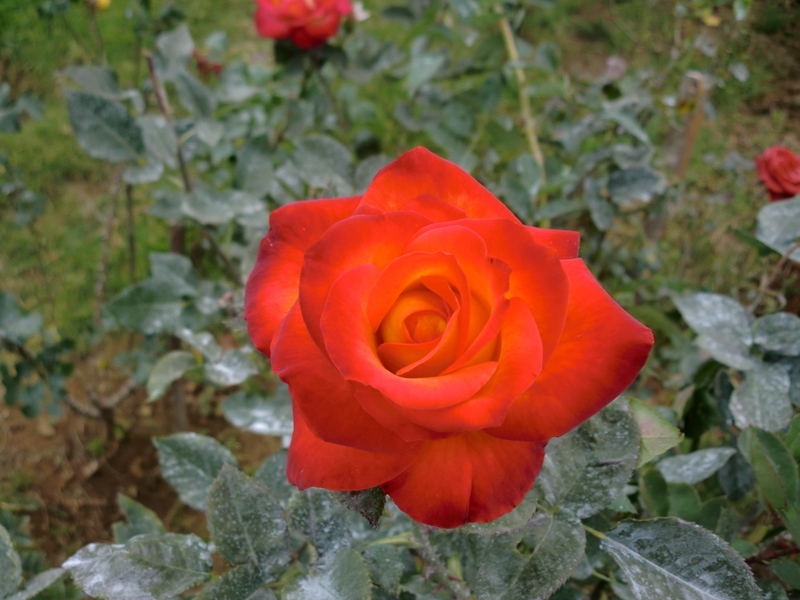 It was from those plants that he had begun grafting his own cuttings and selling the them (as well as other rose varieties) to earn a little extra income. I bought four baby plants which are now thriving in my garden. 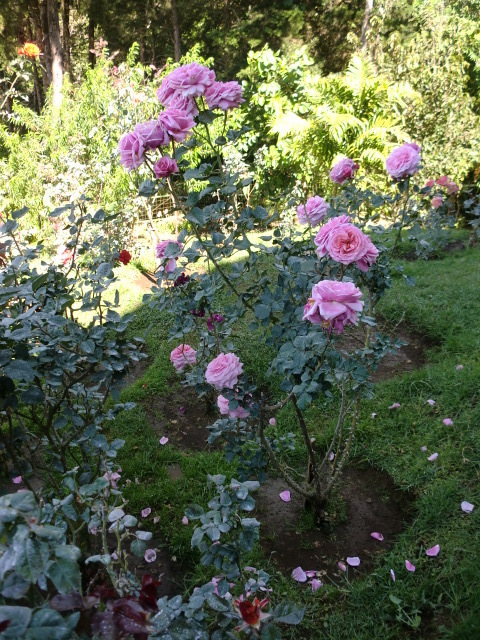 Several other roses are blooming as well. 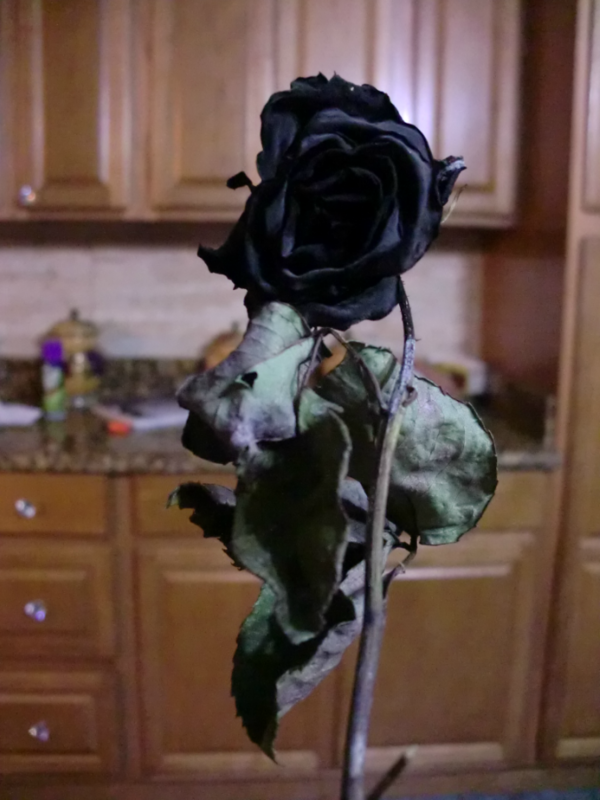 This is the closest to black rose I’ve ever seen. 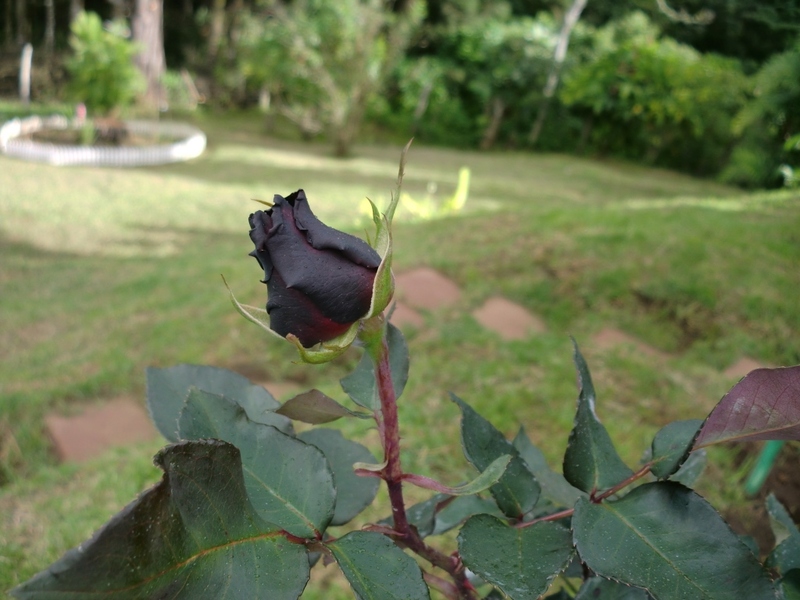 Before the buds open, it looks quite black. 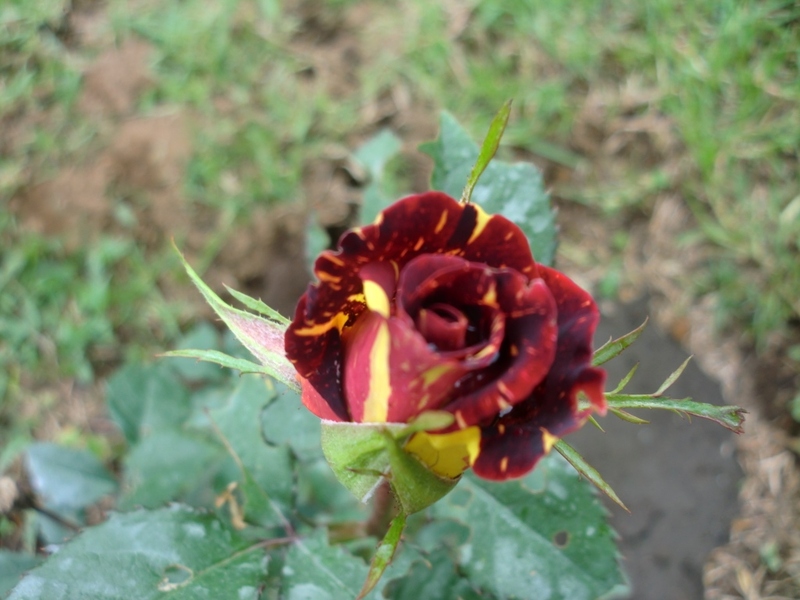 After they open, the rose is actually a very deep blackish maroon. As I looked out over the central valley, I spied a faint rainbow, one of it’s ends sprouting from the the middle of a nearby field. Can you see it? 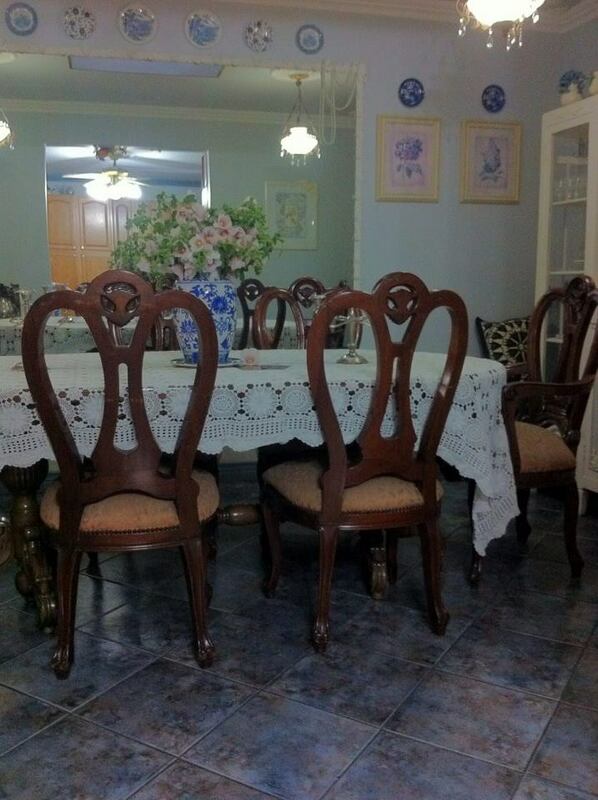 It’s right in the center of the photograph. I could have sworn I saw the glimmer of gold among the bright green grass. 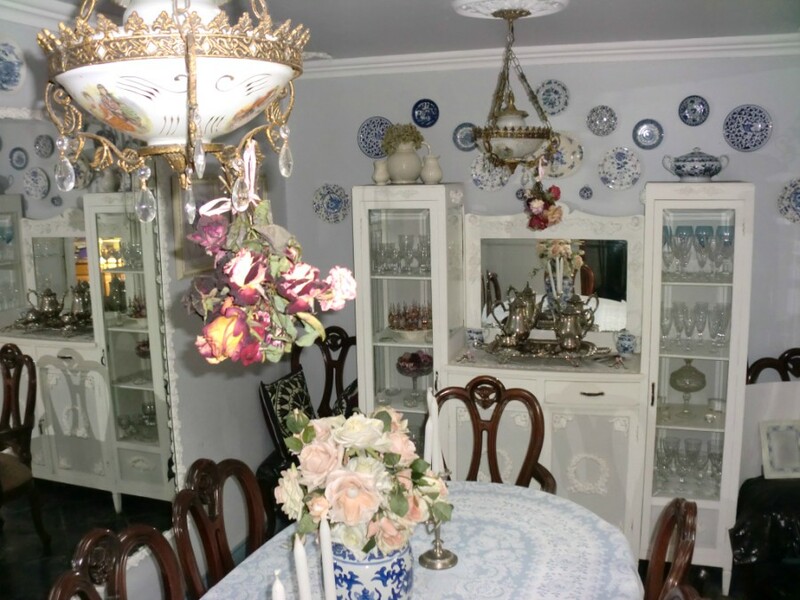 Even though I always feel guilty cutting flowers to put in vases, I wanted to be able to enjoy them inside the house as well. 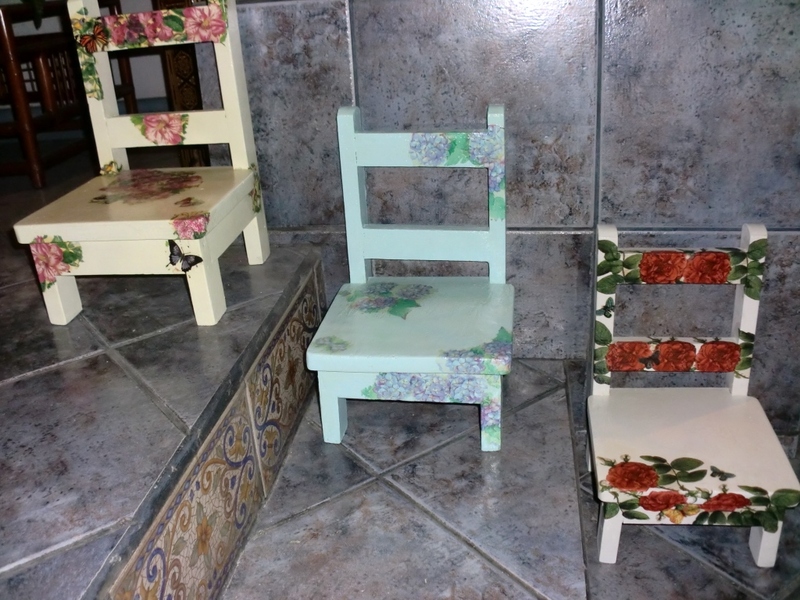 I’ve had these little mini chairs in my garden since forever and over the years they’ve seen sun and rain as well as several different colors of paint. 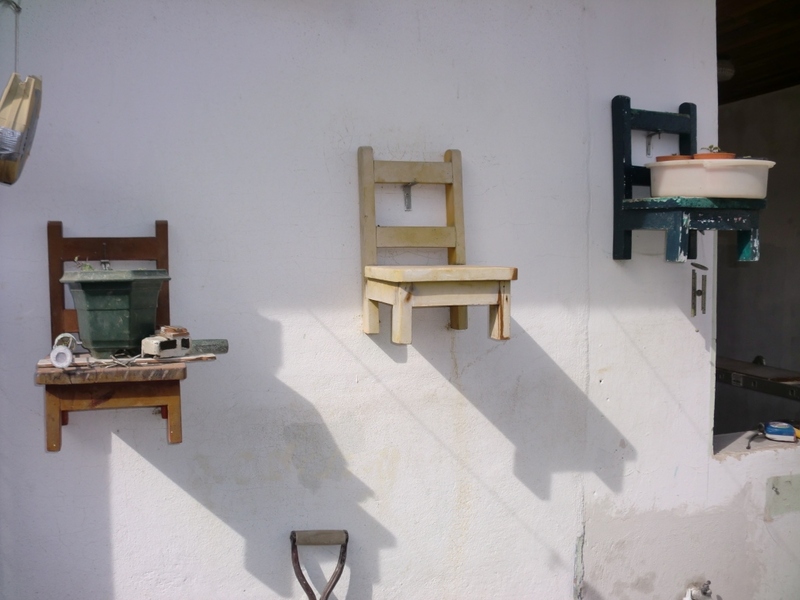 My neighbor Elmer, who is a carpenter made them for me to hang on the wall as plant holders but they’ve been used for many things, mostly as junk holders where I would place garden stuff that had to be kept out of the reach of children and of pets. 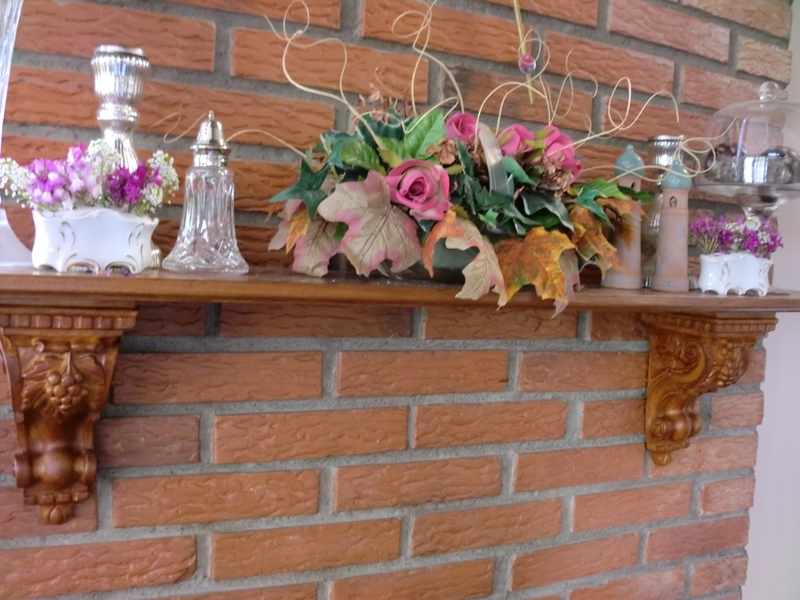 When my youngest daughter was little, she used to make me take them down off the wall so she could play house with them. 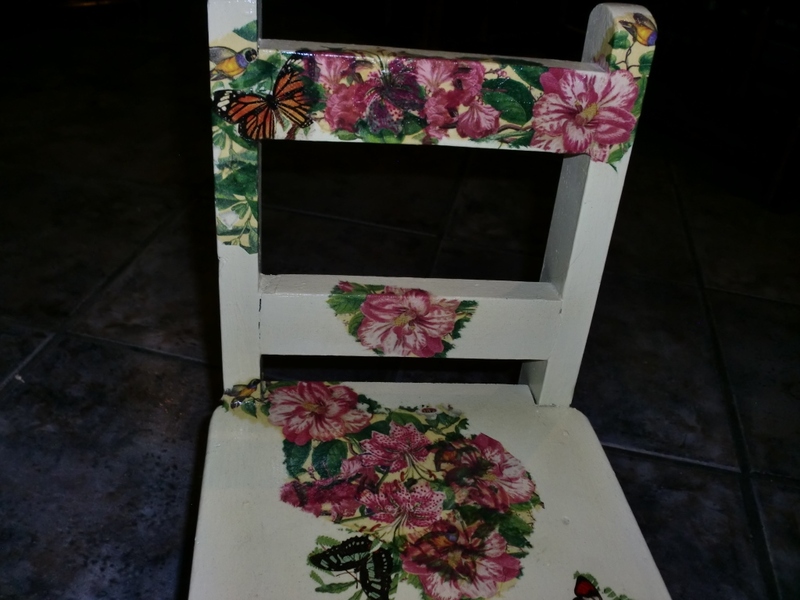 A few weeks ago I decided that it was time to repaint them once again because they were looking very faded and weather worn and I also wanted to refresh my patio garden with new plants and a new coat of paint on the walls. 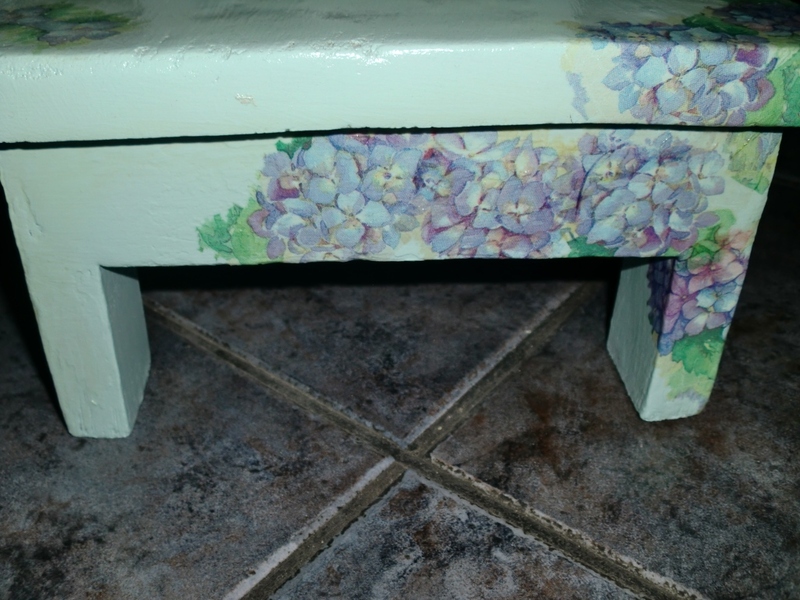 Before: I can’t remember the last time I painted them but obviously it had been years. 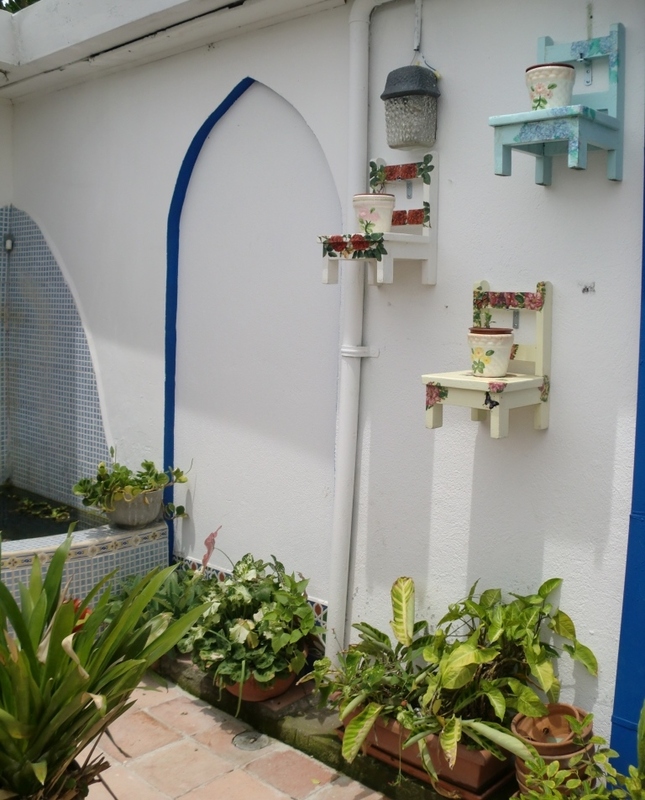 I have to admit that I’ve neglected the little courtyard garden at our city house. It’s such a small space after all and there isn’t really alot of room for plants unless they’re potted. 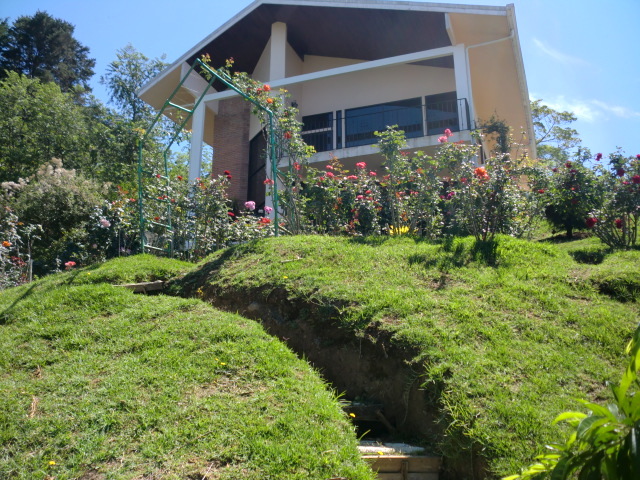 I usually spend more time in the much larger garden up at our mountain house but this rainy season I’ve decided to pay a bit more attention to my little patio and thus spent a good part of the week weeding, fertilizing and planting new seeds. 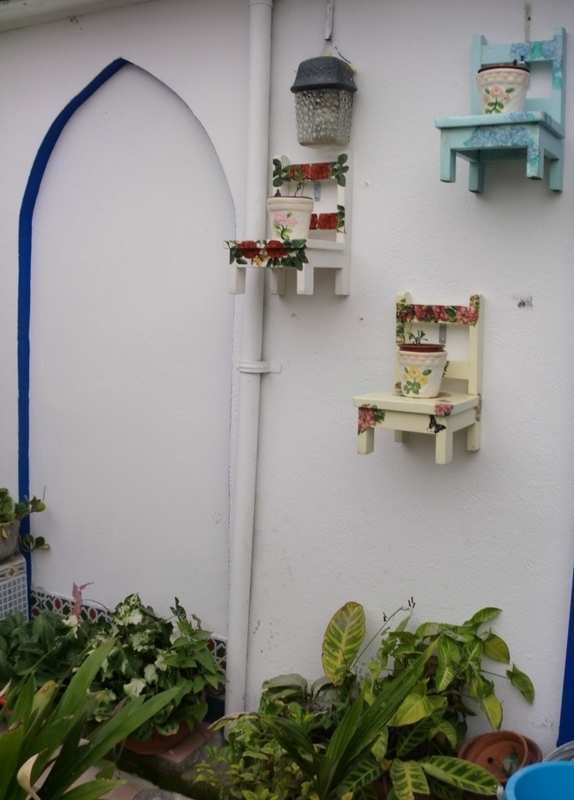 I mostly went with climbing plants because the space is small and the walls were bare. I planted Morning Glory seeds, Sweet Peas and Moon Flower seeds as well as three Clematis vines and even a few pumpkin seeds which will hopefully yield pumpkins by Halloween, unlike last year when I planted “fungus resistant” pumpkin seeds up at the mountain house only to have them ALL succumb to a woolly white fungus just as they were beginning to set fruit! Maybe they’ll do better in the city, it’s not as humid. Keeping my fingers crossed this time. 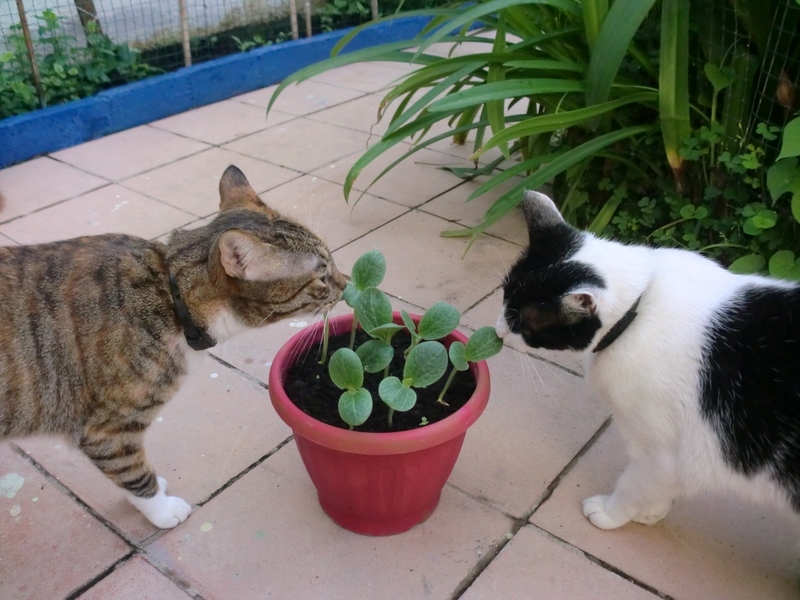 Suha and Giza think the pumpkin seedlings smell lovely. 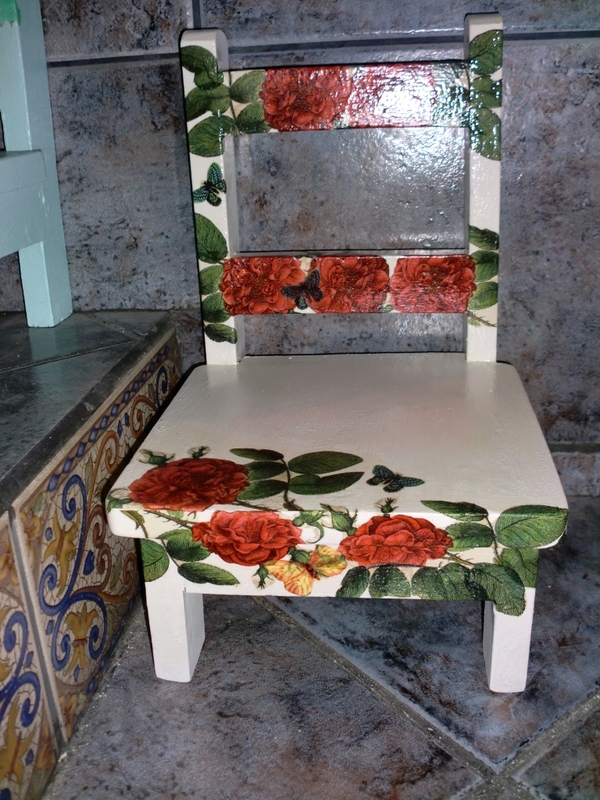 The three little chairs got a complete makeover which meant new paint and a bit of decoupage. 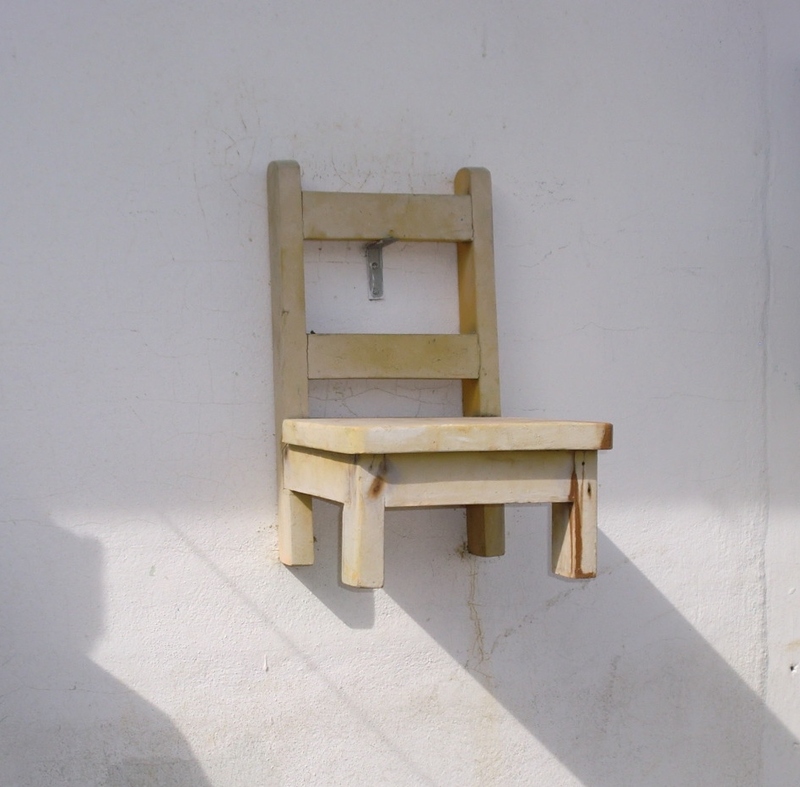 I sealed them with a thick coat of polyurethane varnish so that they’d be sun and rain resistant….at least for a couple of years. I’ve had to put a wire mesh around and above my seedlings as well as more stones in some of the larger flower pots because my naughty kitty girls love to scratch the bare soil and use it as a litter box. I’ve seen them completely bypass their fresh clean litter boxes and head straight for the planters. 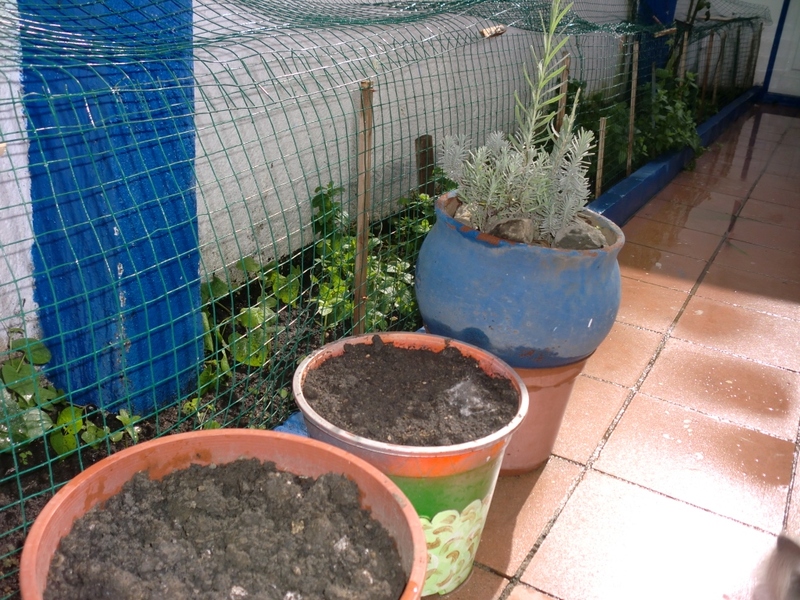 The mesh will keep them out until the plants grow in and there won’t be so much visible soil, then I can remove it. 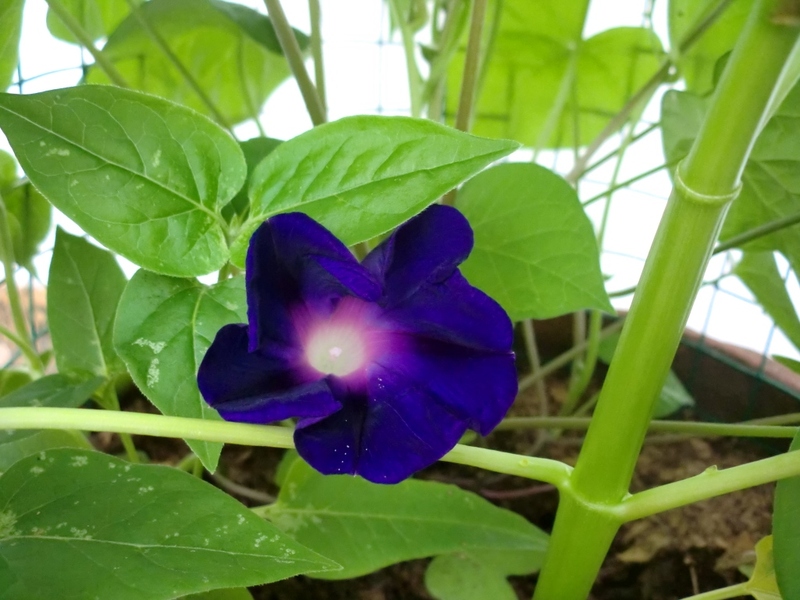 These solid violet colored morning glories grew from seeds dropped by striped morning glories. These keep reseeding themselves and I find myself having to yank out new seedlings every so often, otherwise they’ll just take over the garden. 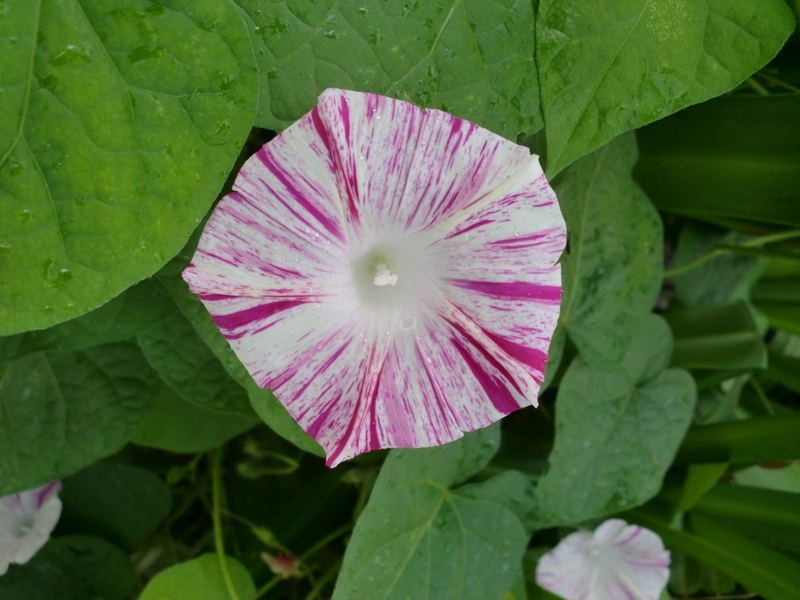 Some of the seeds did produce striped flowers that looked like the parents. 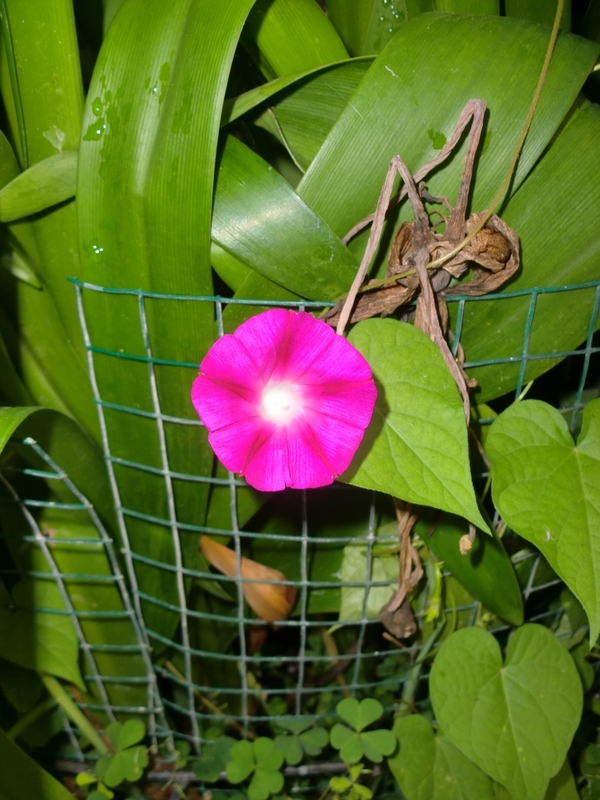 These are Grandpa Ott morning glories. I’ve never tried this variety before. The color is quite intense. 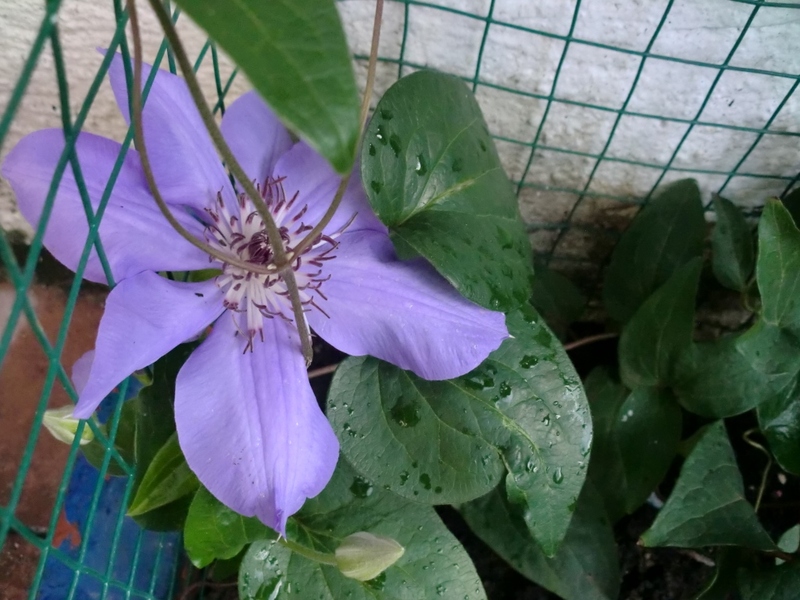 This is a lavender flowered Clematis that I got on Ebay. 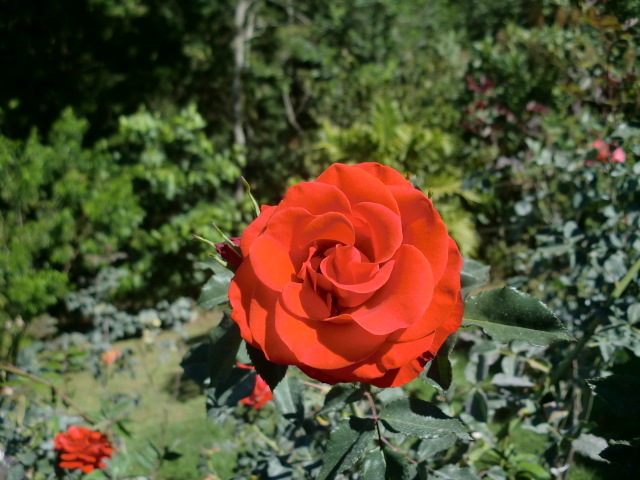 It’s an unamed variety that produces huge blooms. Apparently the seller grew these from seed. My orchids are beginning to bloom. I have several varieties and they’re actually really easy to grow. Most of them are heavily scented and they make the entire courtyard smell like vanilla. 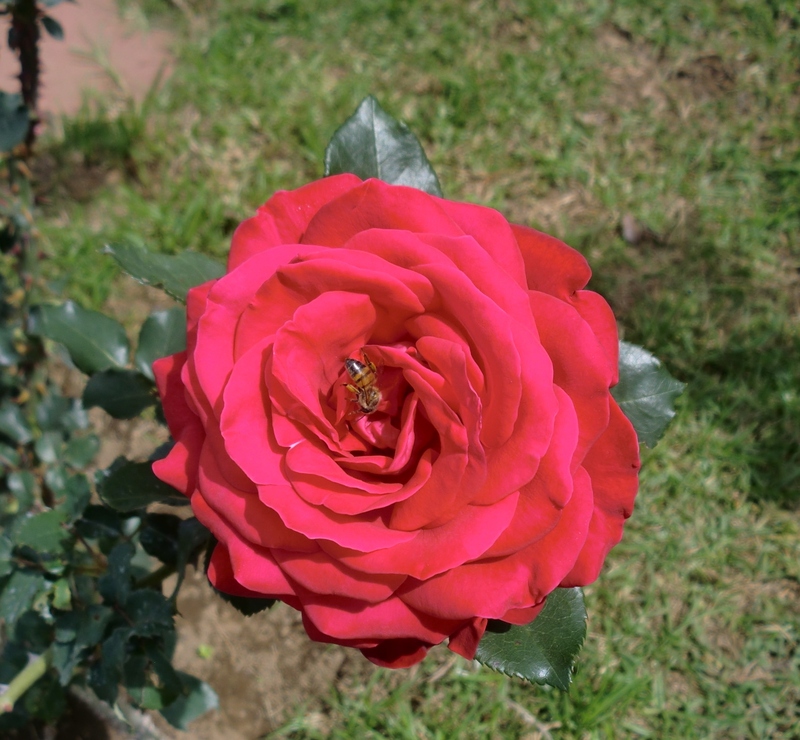 This is another intensely fragrant flower. 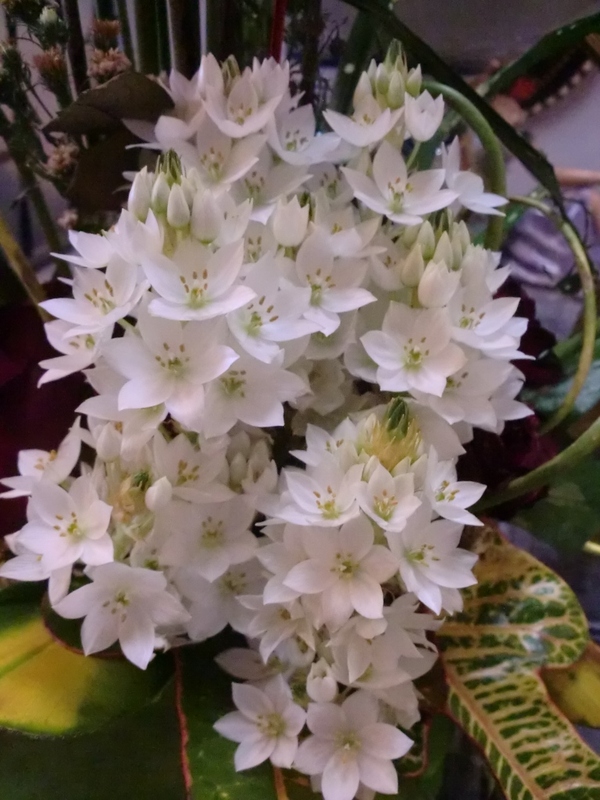 The perfume is absolutely intoxicating. It’s Frangipani also known as Plumeria. 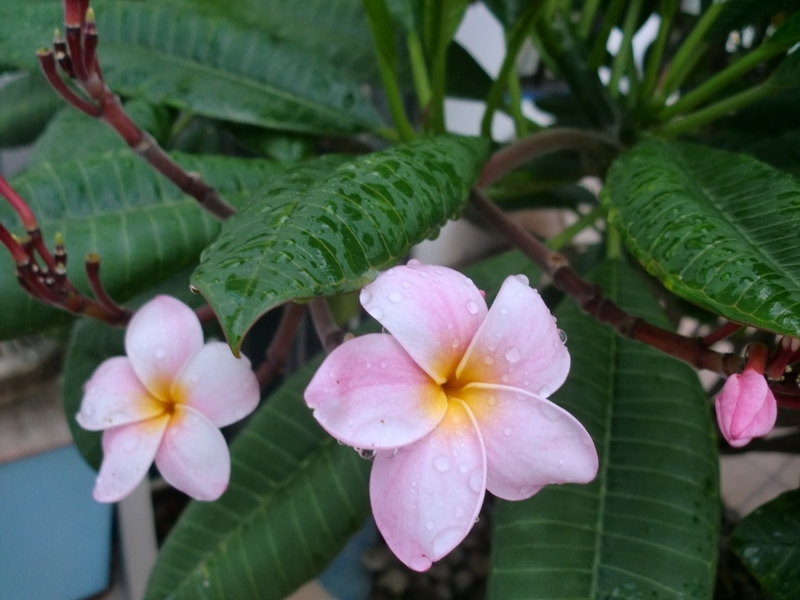 I always thought Plumeria was Hawaiian, but it’s actually native to Central America. It’s a tall tree like shrub and it’s one of the few larger plants that I have in my little garden. 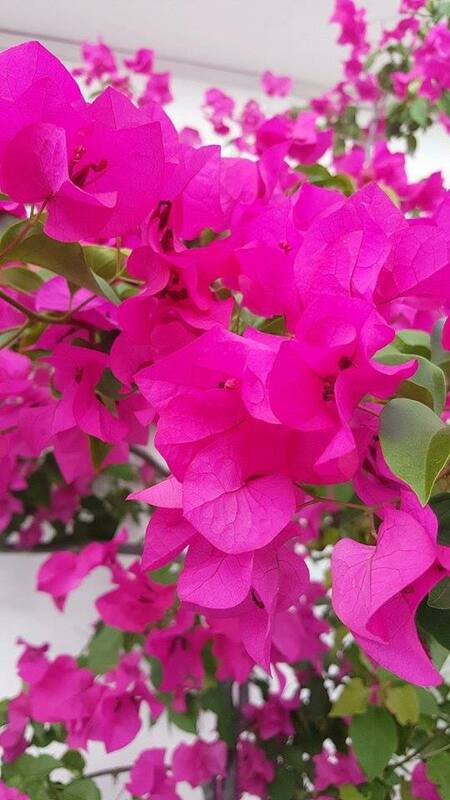 Bougainvillea. I have this one growing in a pot right outside the patio door. 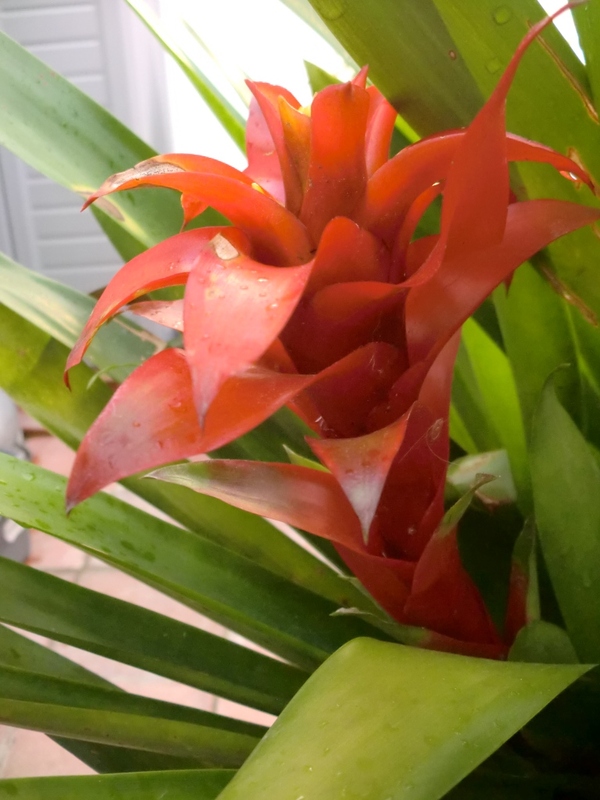 A red Bromelia. This one’s native to Costa Rica. 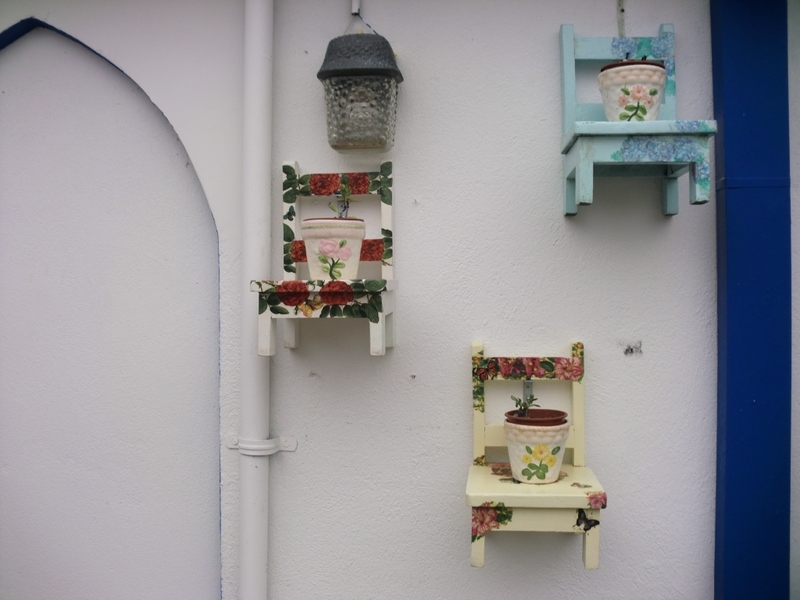 I have several of these growing in pots. They reproduce quite easily. 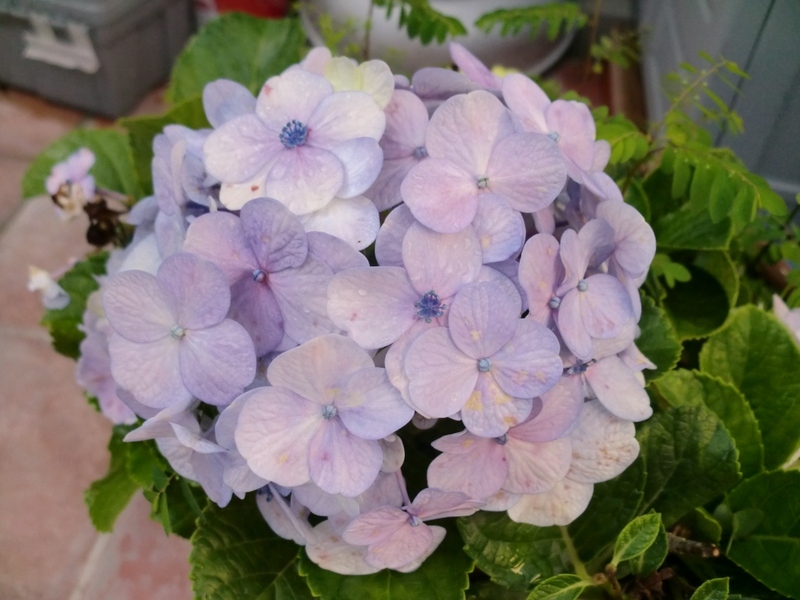 Here’s a potted Hydrangea. They grow abundantly in my area, even on roadsides. 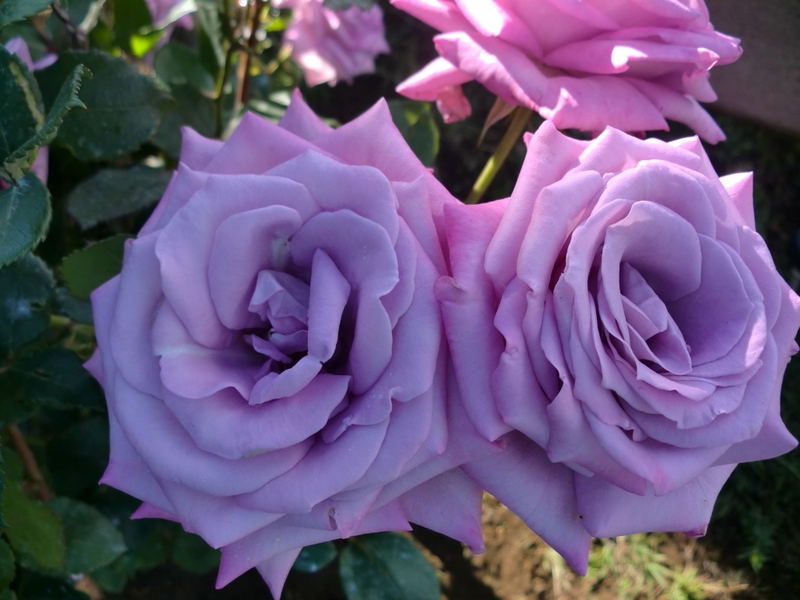 They always seem to bloom in varying shades of blue however, and even the ones that open white will eventually turn blue. 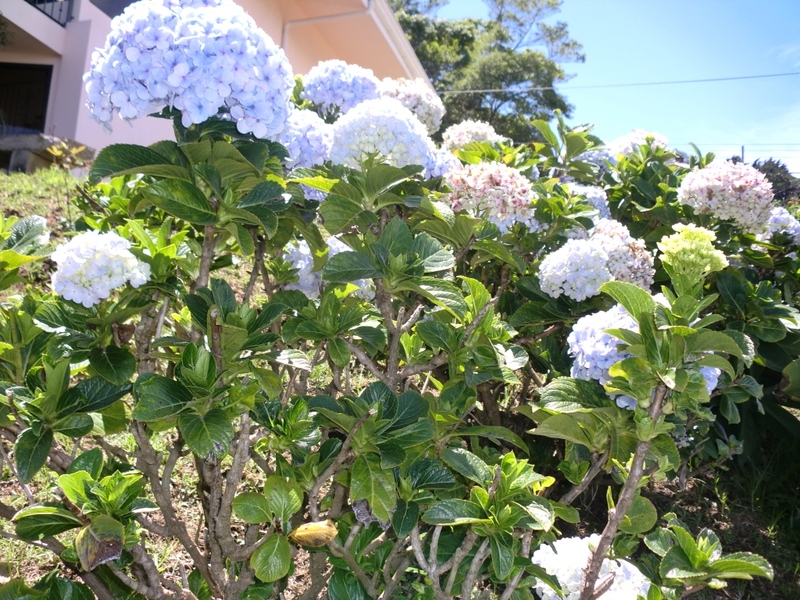 I’ve never seen a pink hydrangea in Costa Rica. I wonder if it’s the soil. 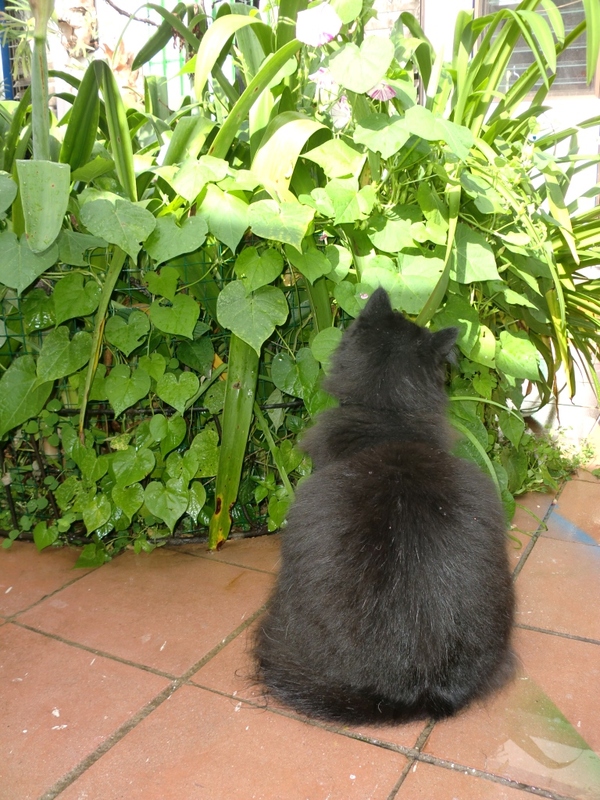 Leyla is looking longingly at the flower bed. There’s mesh all around it but it’s mostly hidden among the greenery. 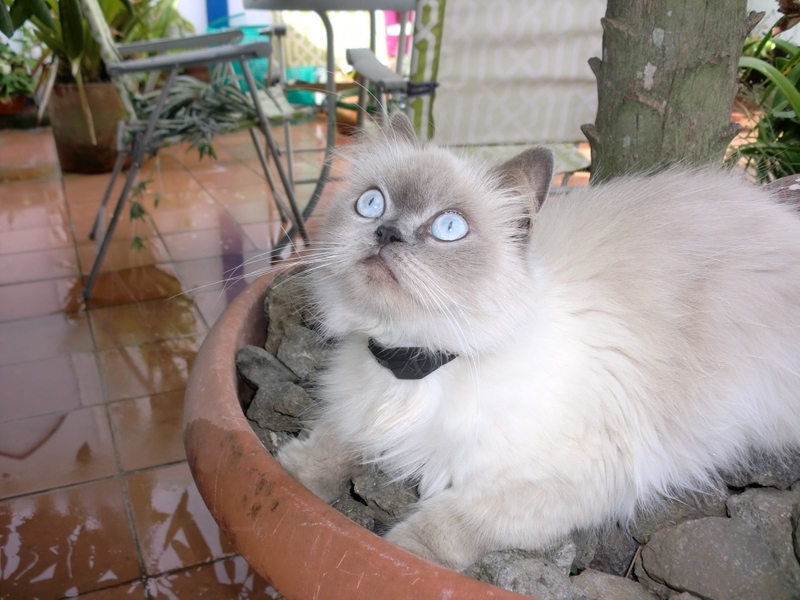 Semsema loves to lay in the flower pots. I guess the damp soil and cool rocks are refreshing on a hot tropical afternoon. 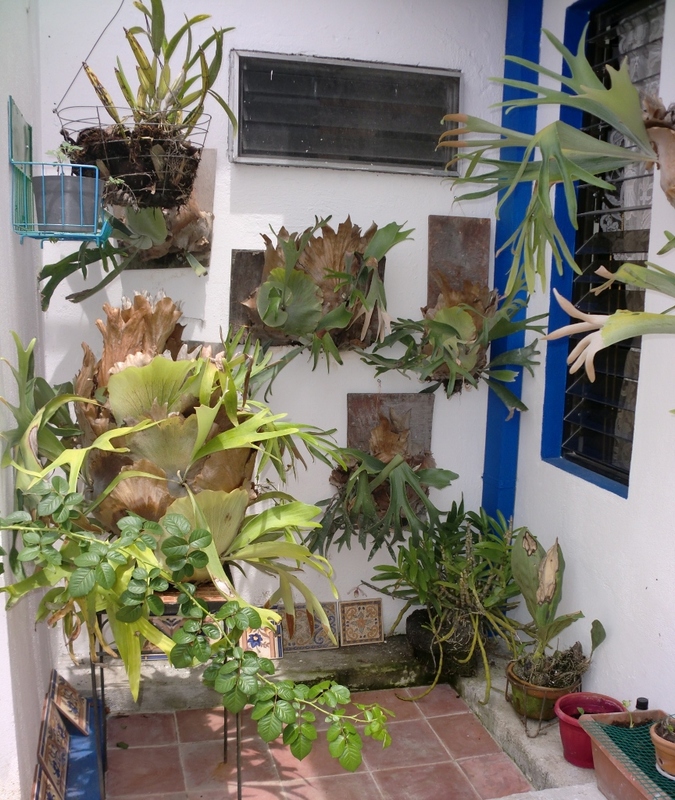 This is a little shady spot where I keep the staghorn ferns and some of the orchids. Notice the mesh over the planter. That’s so the kitties won’t scratch the soil around until the seeds germinate. Most of the seeds that I planted a couple of weeks ago have sprouted and are growing nicely thanks to the abundant rain but there is still so much to do in the garden. 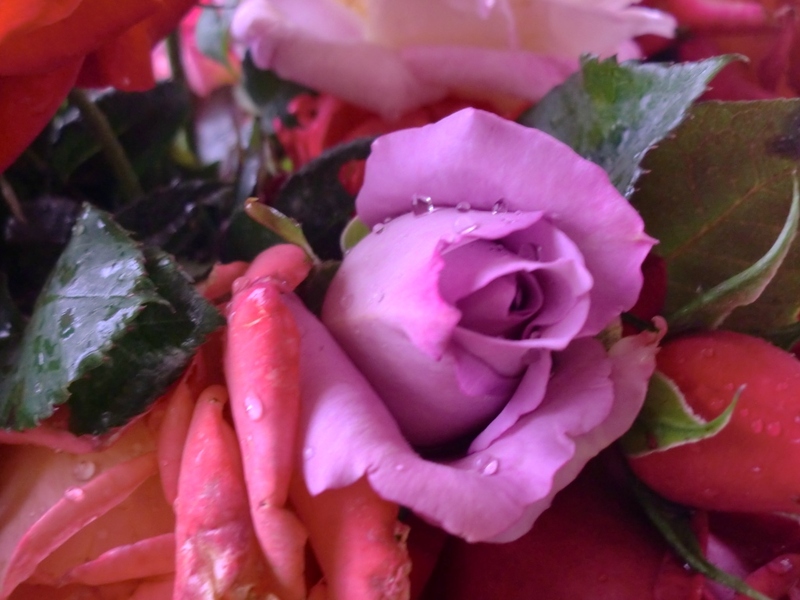 I’m thinking of buying some miniature roses ….or maybe even some hanging roses, more water lilies for the pond and perhaps some quick growing ivy to trail up the stark walls. 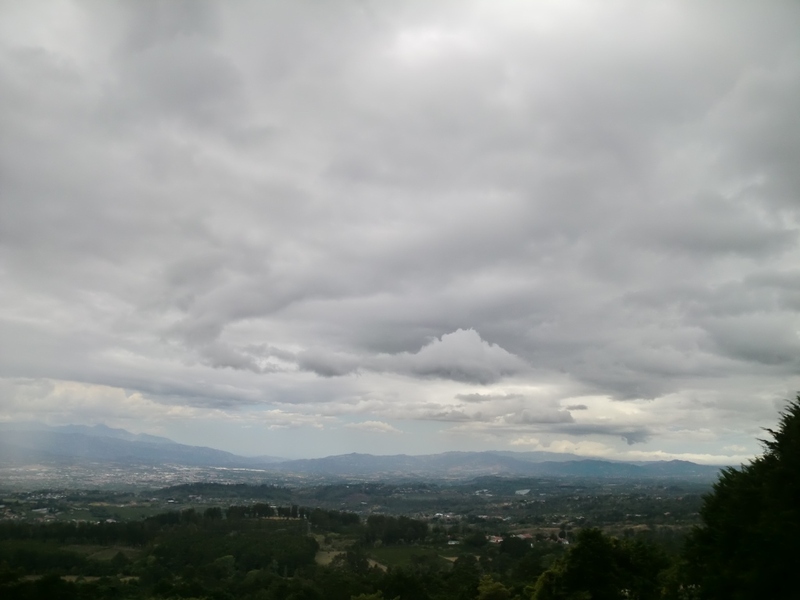 Rainy season is almost upon us again and the sky has become a swirl of puffy white clouds edged with ominous darker gray ones which bring with them a telltale drizzle and cool humid breezes. 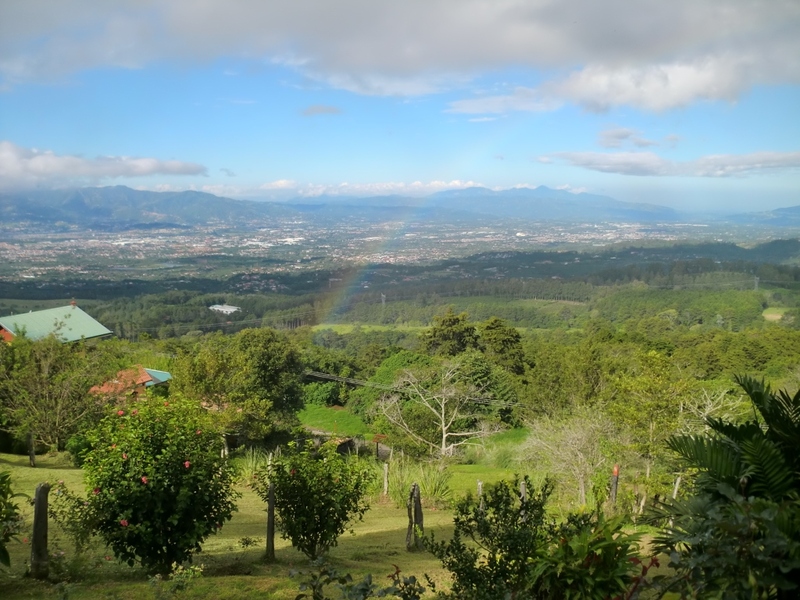 April marks the transition into rainy season and although we still have dry sunny days, they will steadily become fewer and fewer throughout the month until they are gone completely. This year I’m kind of looking forward to the rain, I never thought I’d say that but my garden is suffering a bit and things are starting to look dry and thirsty no matter how much they’re watered with the hose. I think that too much sun is about as bad as too much rain. 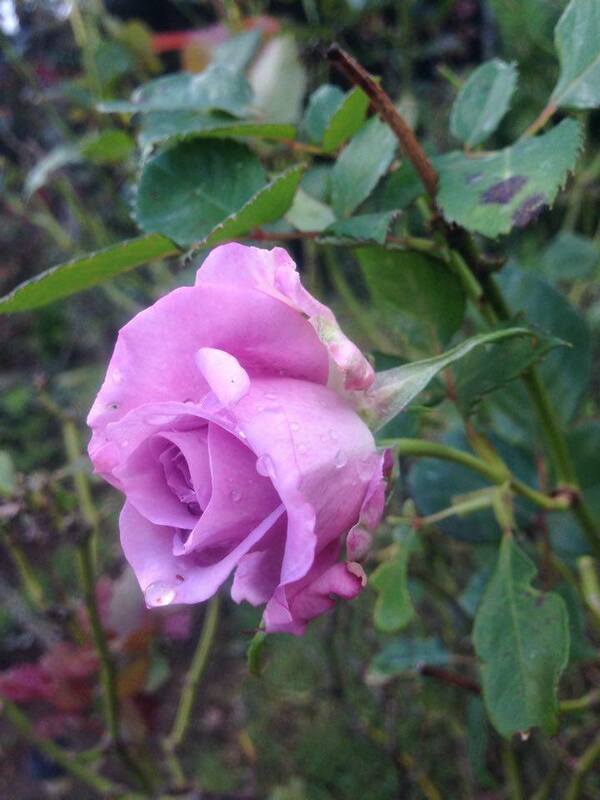 Only a few of my rose bushes have blooms on them now and most of the water loving annuals including the zinnias and marigolds have dissapeared. It seems that this dry season has been uncharacteristically harsh. I was going to re-seed last week but I figured I might as well wait til the end of the month when the rains return and I won’t have to worry about watering them every day. 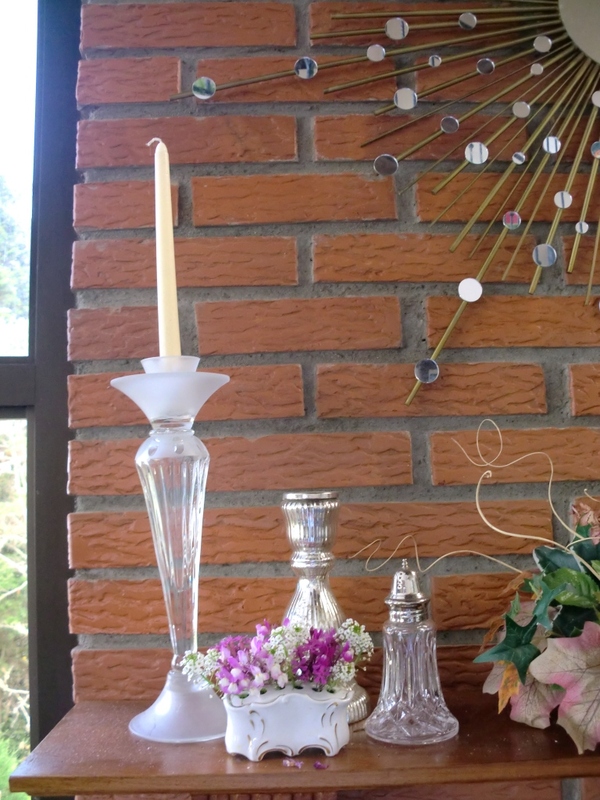 Two things that seem to be thriving are the sweet alyssum and the hydrangeas, bless their dear hearts. 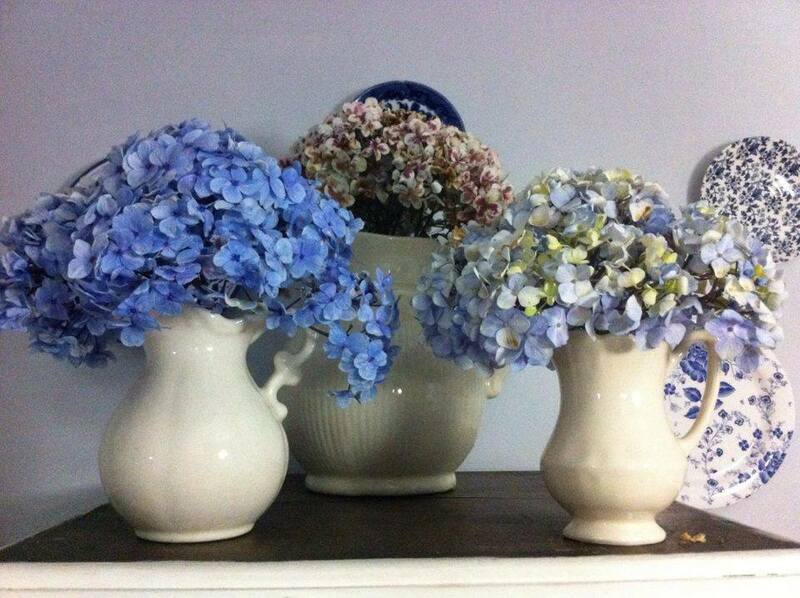 Hydrangeas are practically indestructible around here and most houses have several bushes growing in their gardens. 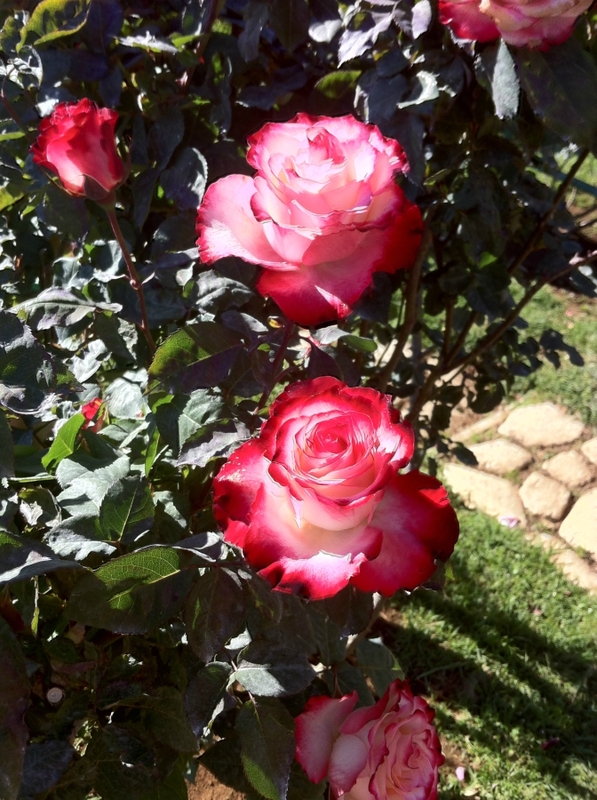 A few of my roses are blooming, though not as profusely as they usually do. This orange and yellow blend is almost always in bloom come rain or shine. 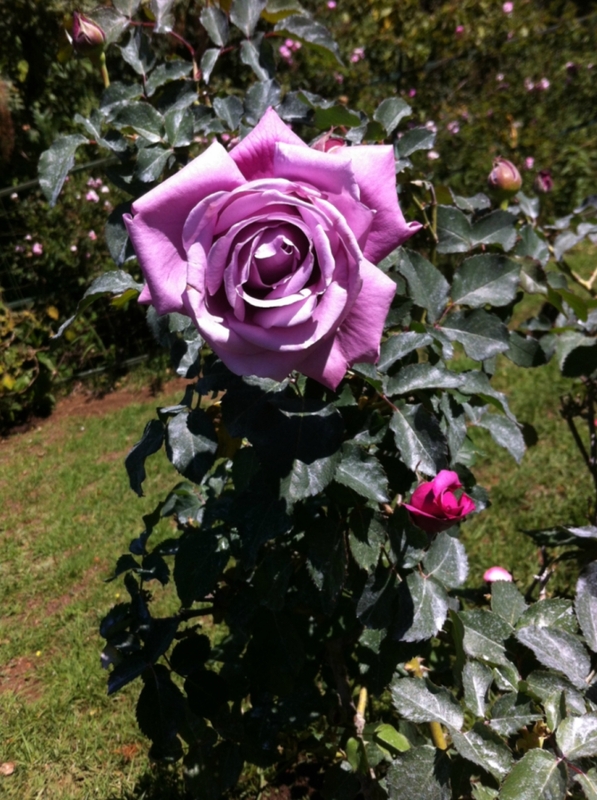 I wish I knew what it was called but most nurseries around here don’t provide the real names of roses. I thought it might be Charisma, but it’s anyone’s guess. 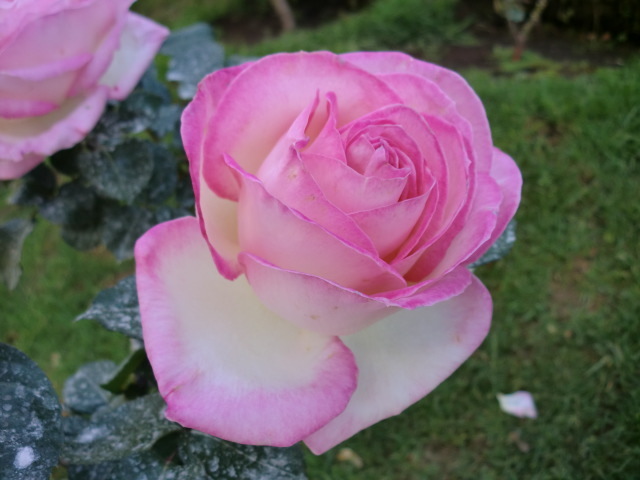 This pink edged white rose reminds me of strawberries and cream. It’s called Princess De Monaco. 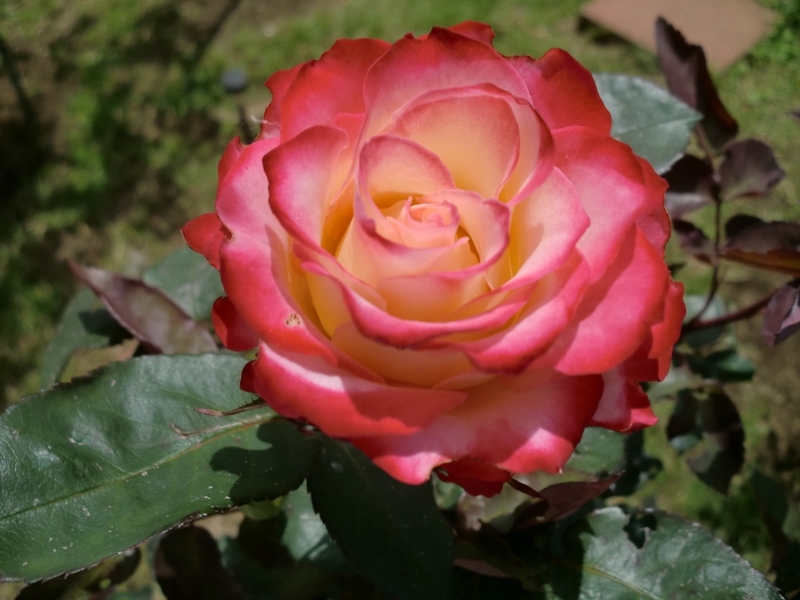 This russet colored rose is one of my favorites. 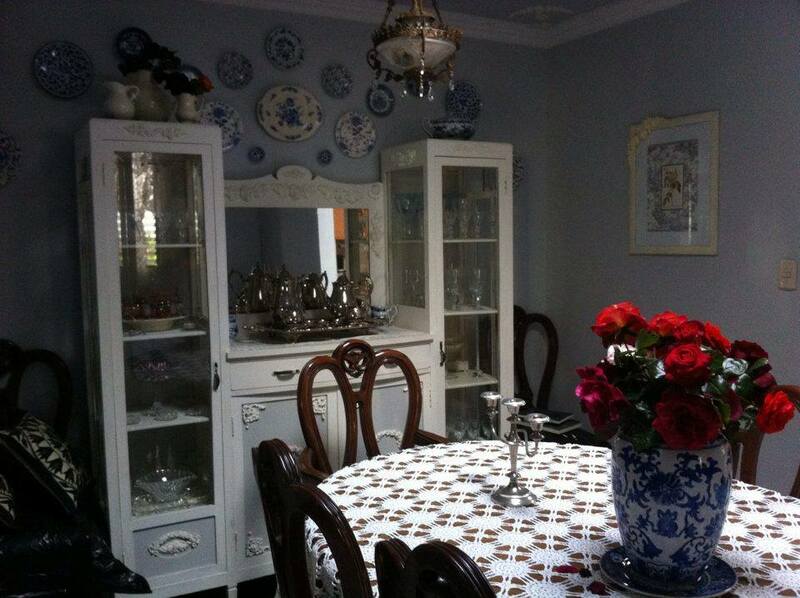 The color is somewhere between terra cotta and cinnamon. 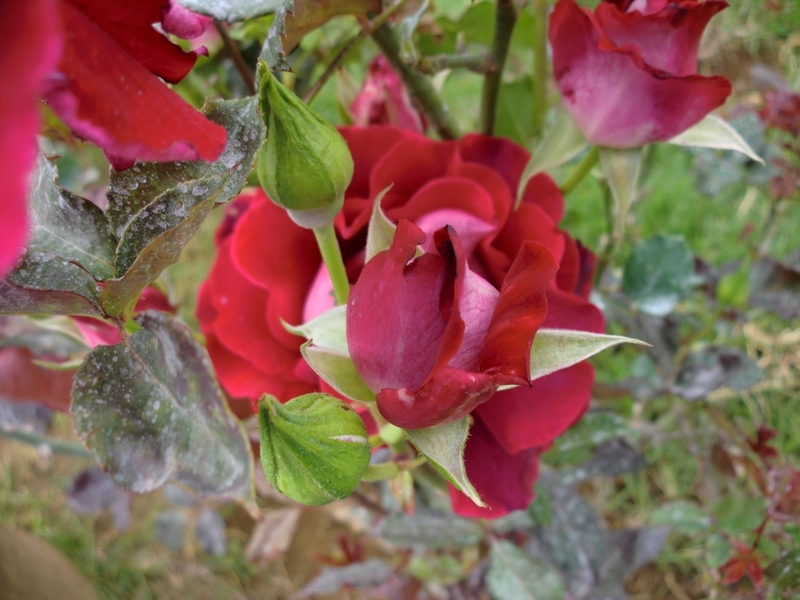 In case you’re wondering, the white residue on the rose leaves is a fungus spray, it’s the only way to keep blackspot and downy mildew somewhat under control in this humid climate. My fig tree is doing surprisingly well. I had this tree in a large clay pot for about 12 years where it dutifully produced 5 or 6 figs per year. It never grew more than 2 ft. tall. 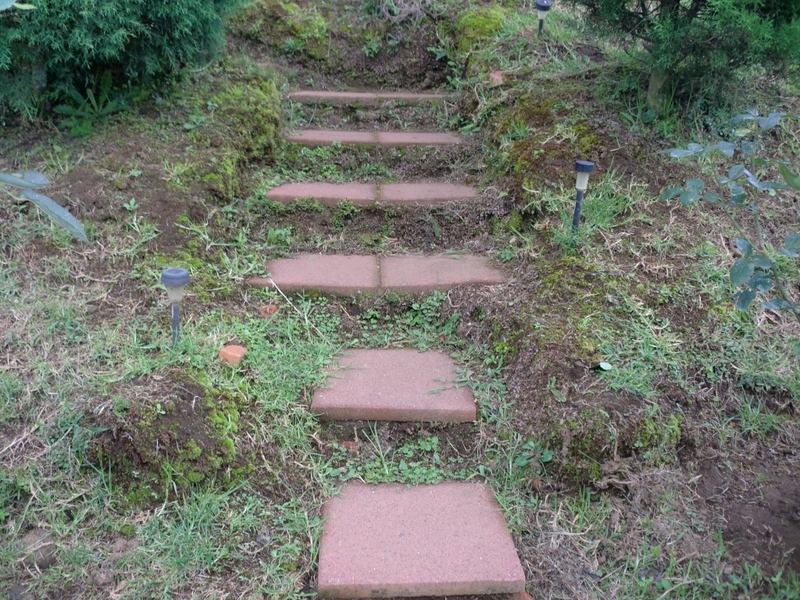 When we bought the mountain house I brought it up here and took it out of it’s clay pot and put it in the ground. 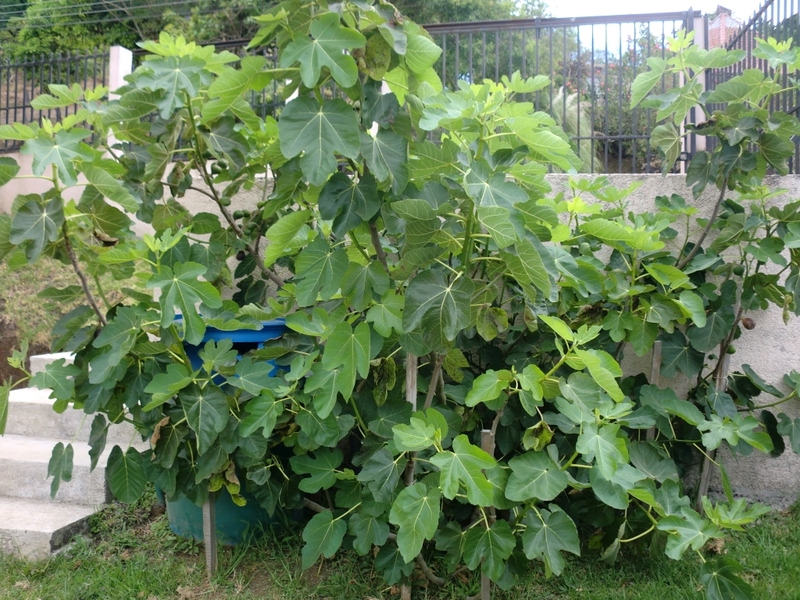 I am amazed at how much it’s grown in just a couple of years and how many figs it’s producing now. Fig compote (with cheese!) is one of my very favorite desserts. I just wish my grapevines were doing as well. They’ve been in the ground longer than the figs but they are really putting up a fight and refusing to grow. They’re just scraggly and tend to lose all their leaves during the wet season. I have no idea what’s wrong with them. I had hoped to be eating grapes by now but it seems that they take one step forward and two steps back. I’m guessing that they prefer a drier climate. The giant passion fruit is looking nice and green. 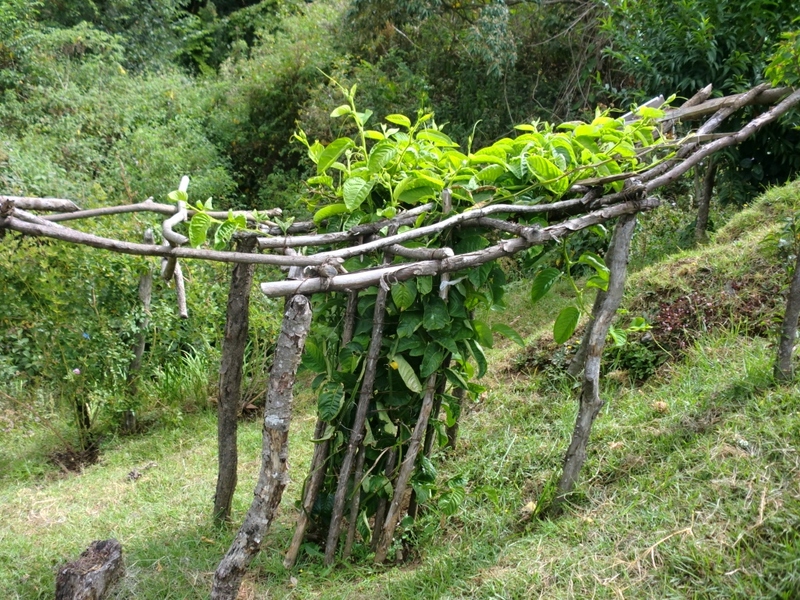 I had to build a trellis support for it. No fruits in sight yet though. I don’t know what these black berries are but they look terribly poisonous. They’re hanging from the palm trees. I’ve already cut several of these palm trees down but they just keep coming back. Sweet alyssum are springing up all over the place and their scent is simply heavenly. 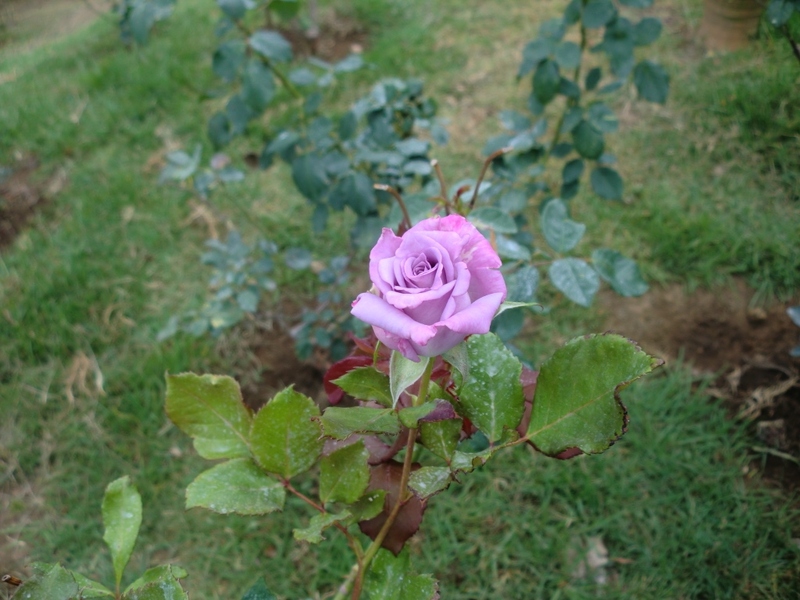 It overpowers even the fragrance of the roses. 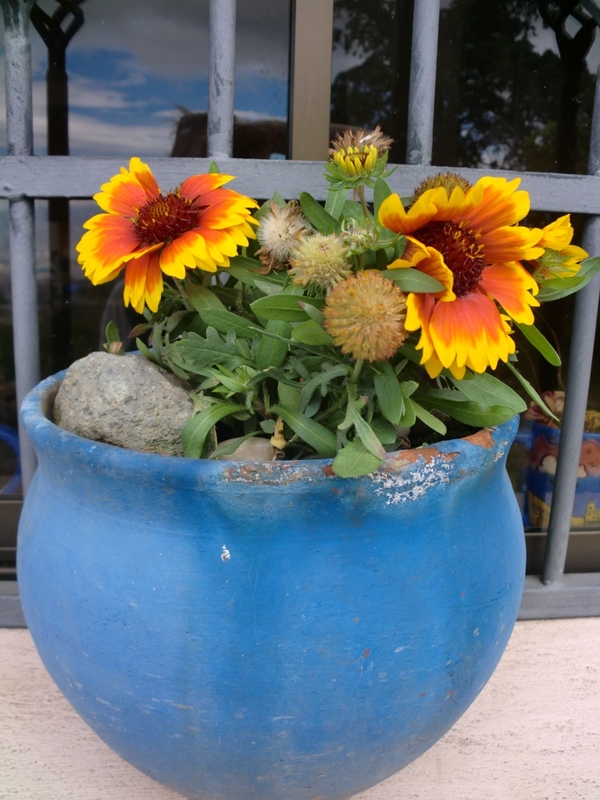 Dwarf Goblin Blanket Flower in a pot. A major dissapointment in my garden has been the pond. I had envisioned bloom after bloom of fragrant tropical water lilies delicately rising above the water to display their colors amid the water hyacinths and the Louisiana Iris. Everything would have gone according to plan if it hadn’t been for those pesky koi fish. They are like eating machines and they devour everything in sight. 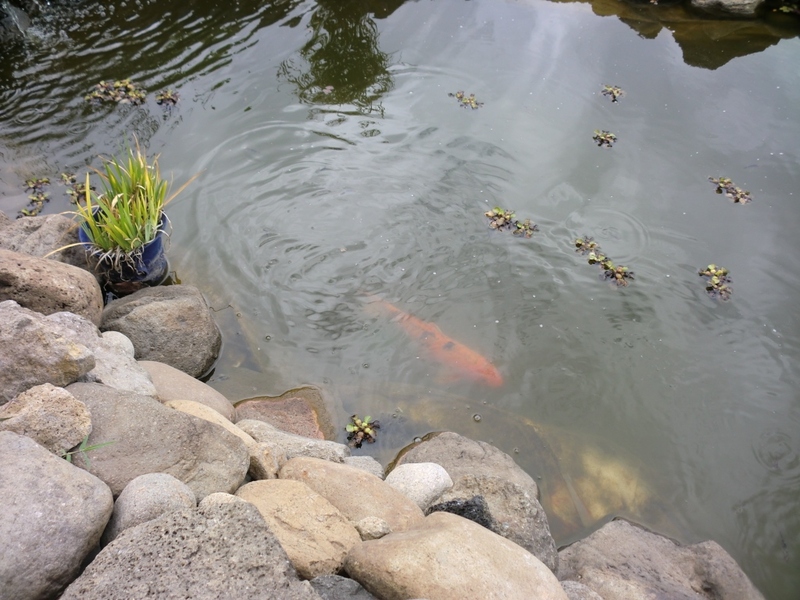 Now my pond looks like nothing more than a muddy murky hole full of water and dying plants where monster fish lurk like sharks waiting for any tidbit to fall in so they can eat it. These fish actually climb up on the rocks and out of the water so they can get at the plants that are out of their reach! I find them frightening. I had been quite hesitant about buying koi because I’d heard that they were incompatible with plant life. I had intended to buy goldfish instead but hubby beat me to the punch and went ahead and bought the koi. Not just any koi but 15 inch long koi who had about a million babies in my pond within a week of their arrival. I’ve decided that I’m going to call up the breeder who sold them to us and beg him to take them back. Free of charge. Heck, I’ll pay him to get those pests off my hands. Maybe my water lilies will recover. 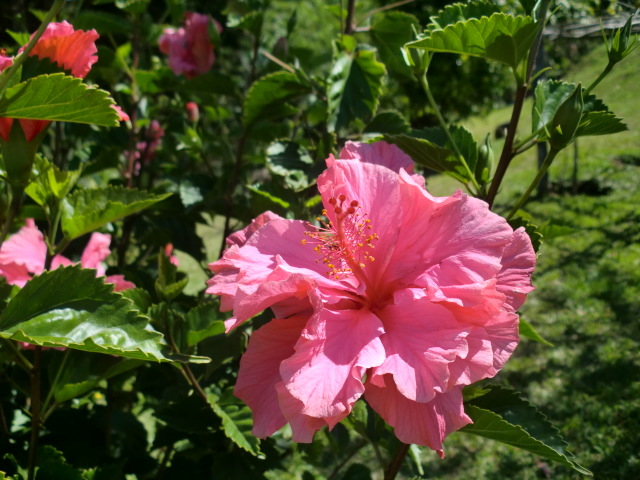 The Hibiscus bushes that line the property look quite happy. 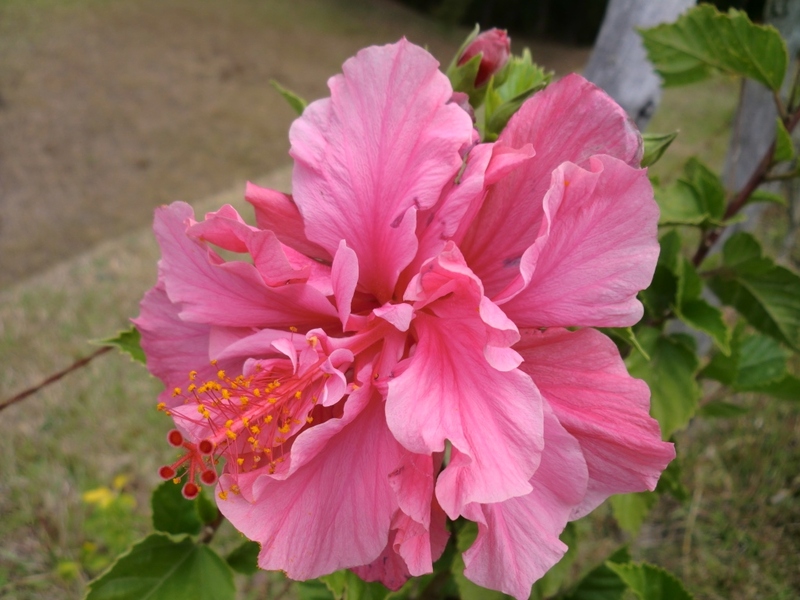 Hibiscus always does well here. 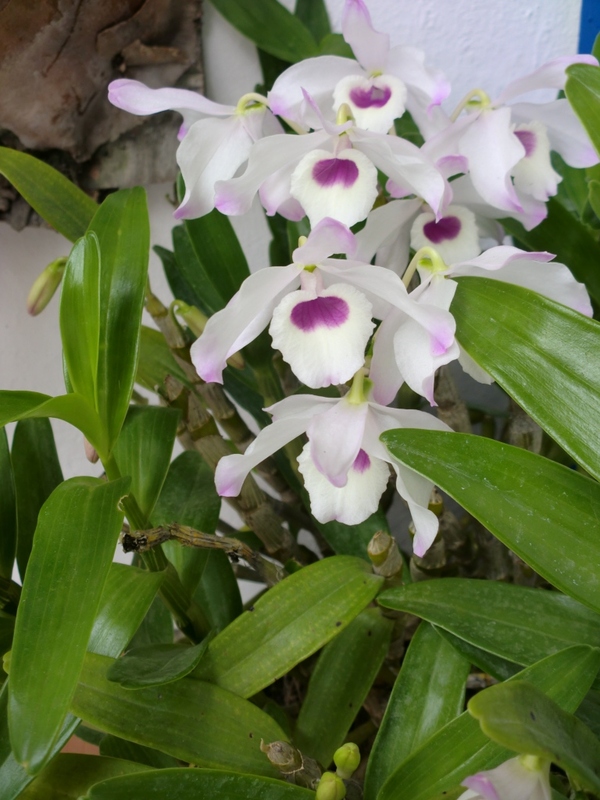 I’d love to get some of those really exotic colored hybrid varieties that I’ve seen online. Another pink variety. This one is more ruffly. 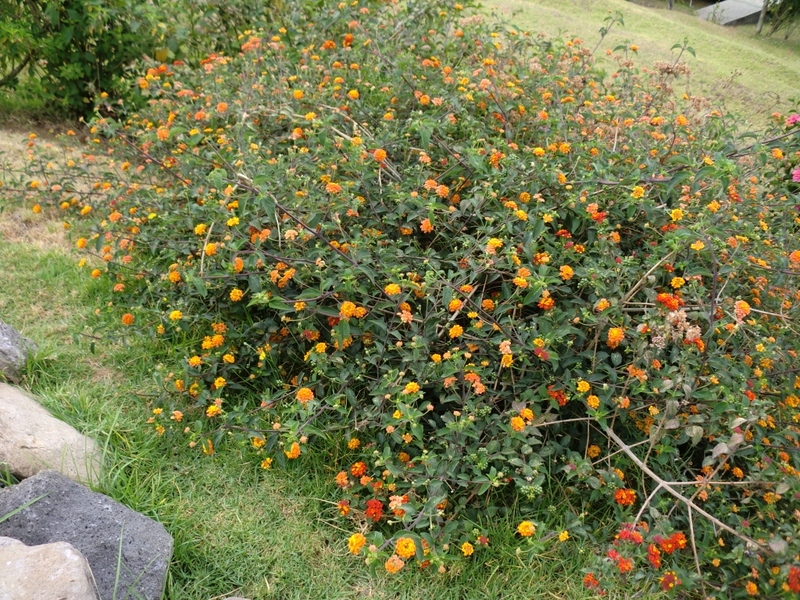 The lantana bushes are full of bright little flowers. These guys will need a good pruning before the rain starts or they’ll just take over the garden. Even though there weren’t very many long stemmed flowers in the garden today, nature always has a way of providing something to use in a bouquet, even if it’s the tiniest of flowers. 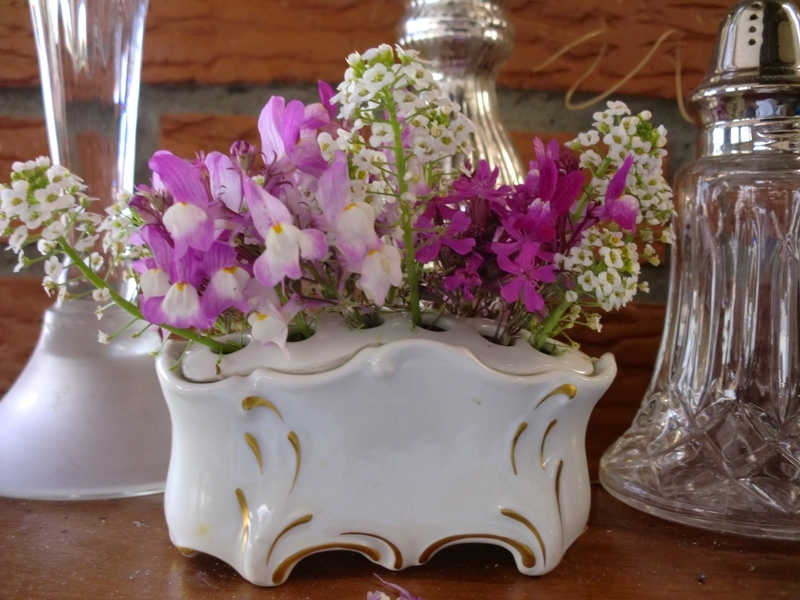 I cut what I found growing…toadflax, catchfly, alyssum, and I was still able to enjoy the sweetest fragrance from these miniature bouquets. 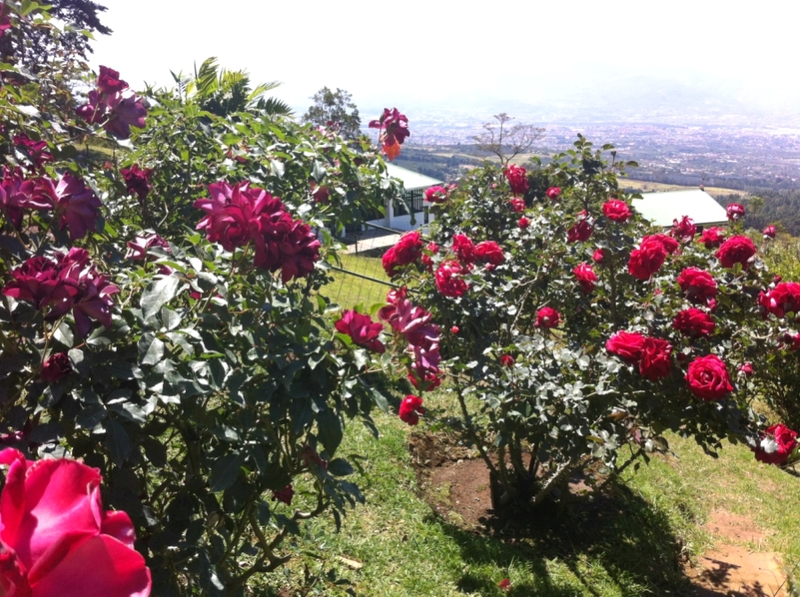 Last Saturday I was up at the mountain house and I was more than happy to see that my roses are finally looking green and healthy once more. It has become a yearly battle. Most of the blackspot and downey mildew that always plagues them during the rainy season has dissapeared for the most part. Diligent spraying seems to have put these pesky diseases under control for the time being. 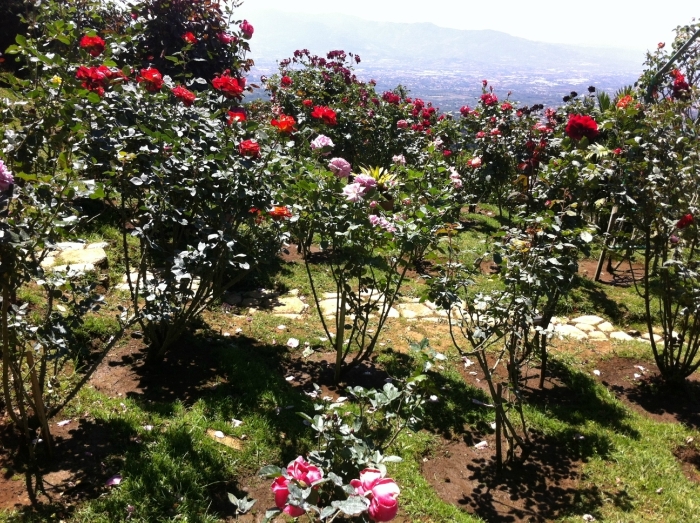 Many of the bushes are heavy with blooms and all the rest are full of buds that are ready to burst open. 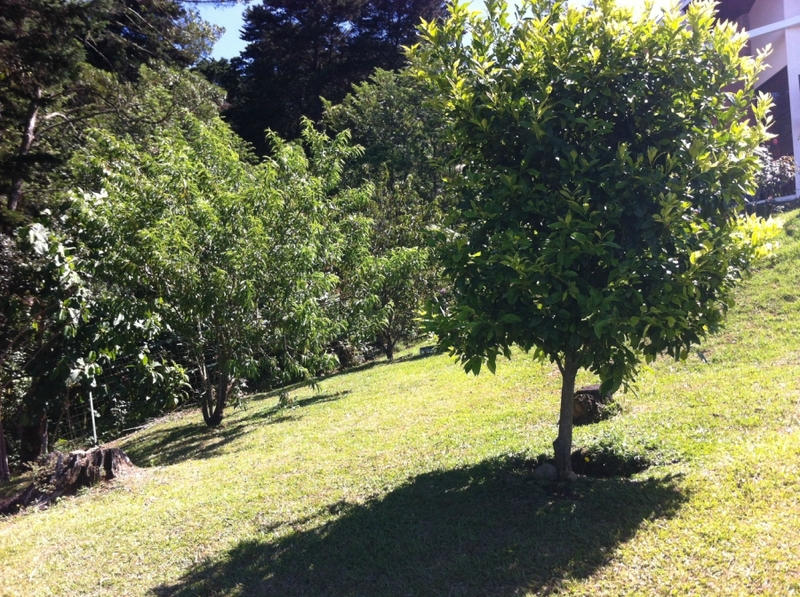 I love warm sunny Costa Rican summers when the soft tropical breezes blow and gently rustle the leaves on the trees. Plants have a chance to recover from the downpours and they begin to show off their best colors. 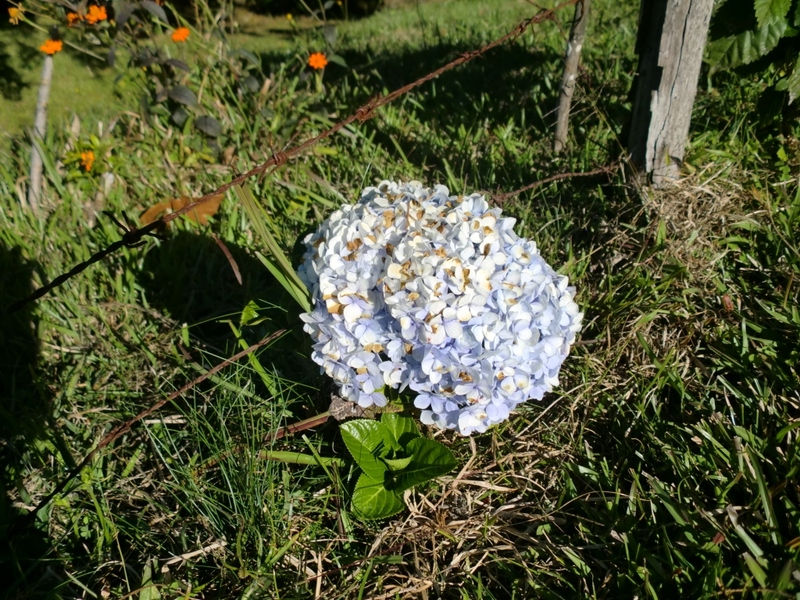 This little hydrangea sprung up here next to the fence posts. It has more flowers than leaves. 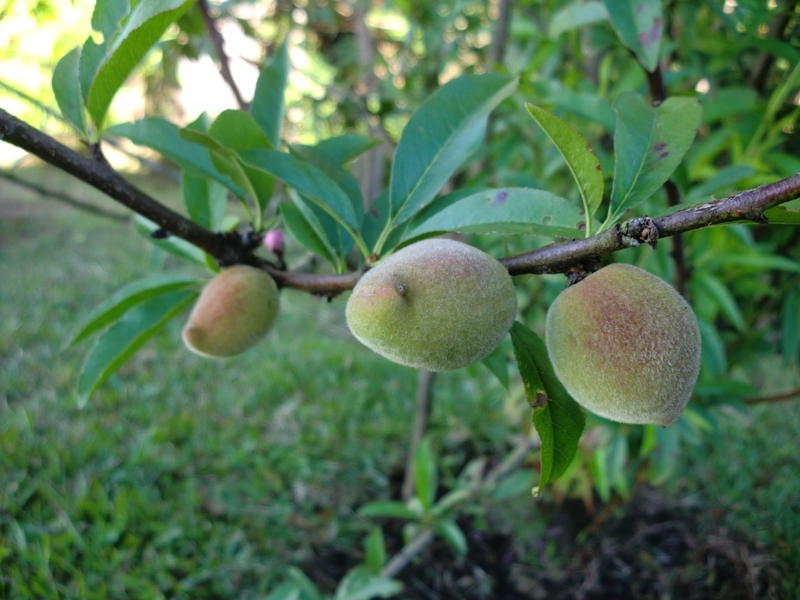 My peach tree is full of tiny little peaches, which is surprising because I was sure that the rains had washed away all the blossoms a couple of months ago, but I guess some of them hung on tightly and survived. Here’s something that baffles me. 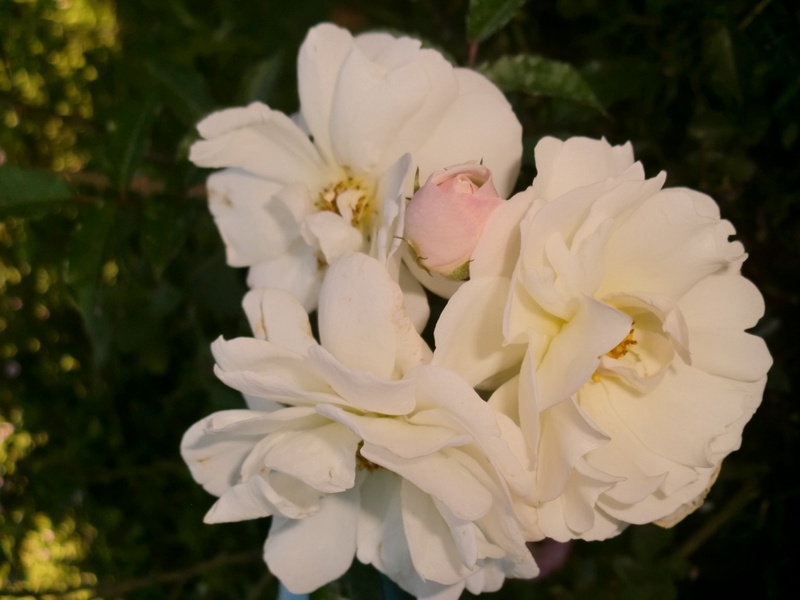 I had a beautiful white climbing rose at our city house that was killed by leaf cutter ants who stripped it bare and sent it into a leafless shock that it was unable to survive. 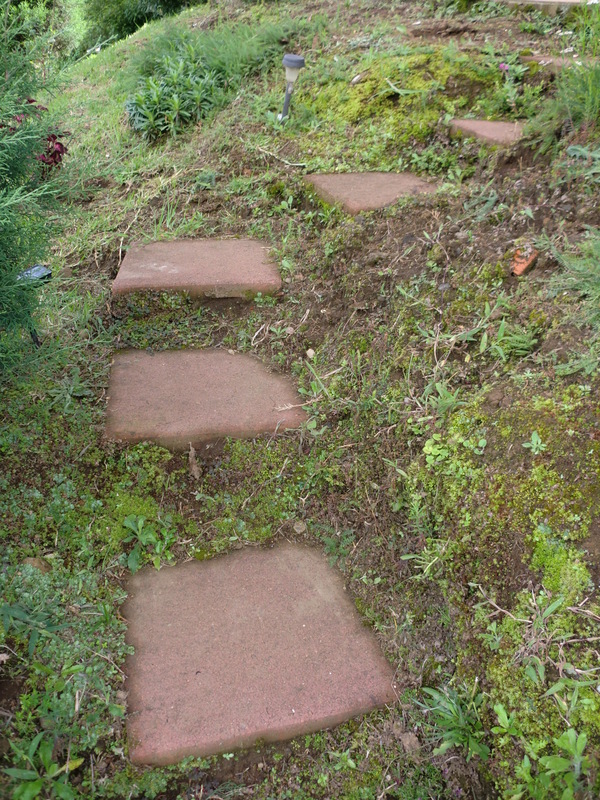 But not before I took several cuttings and rooted them. 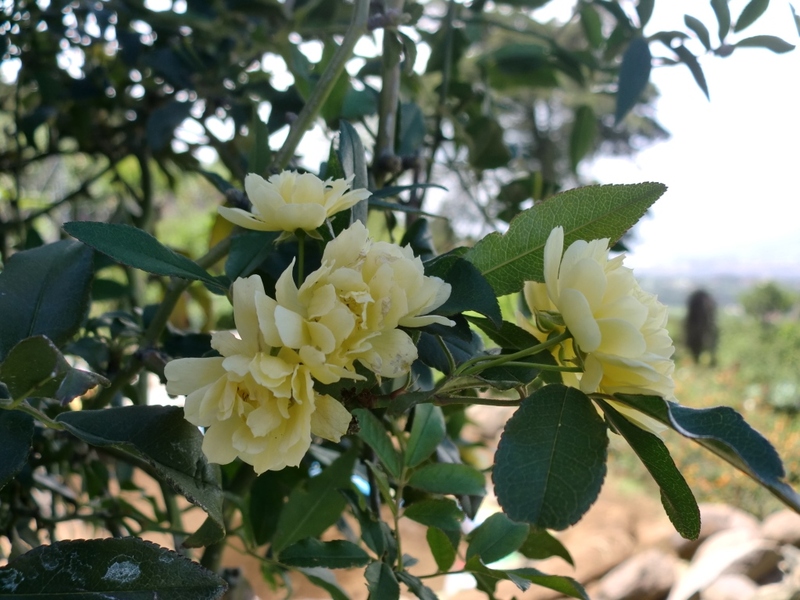 I planted all the cuttings along our property line at the mountain house thinking that the beautiful white roses would look lovely climbing over the fence. 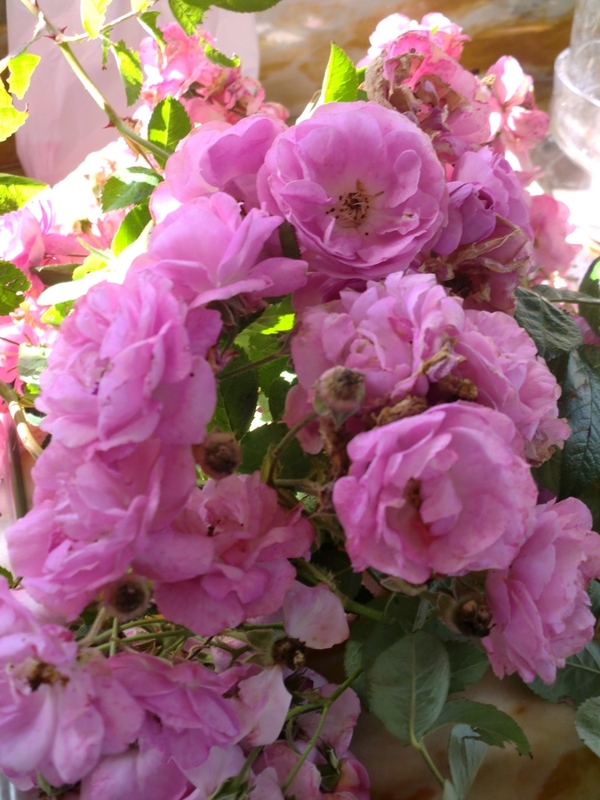 But much to my surprise, many of the cuttings bloomed pink! No idea how that happened. 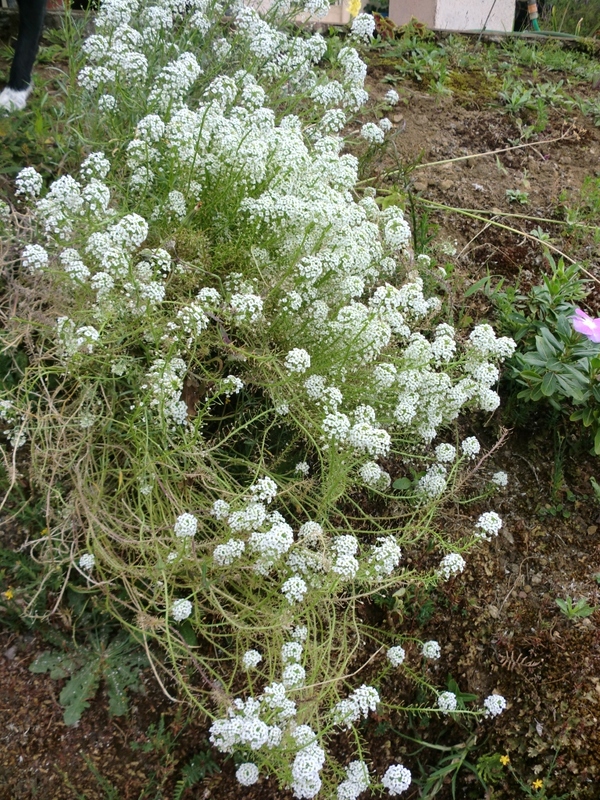 They are identical in shape and size to the white mother plant, but some of them bloom pink and some of them bloom white. How crazy is that. 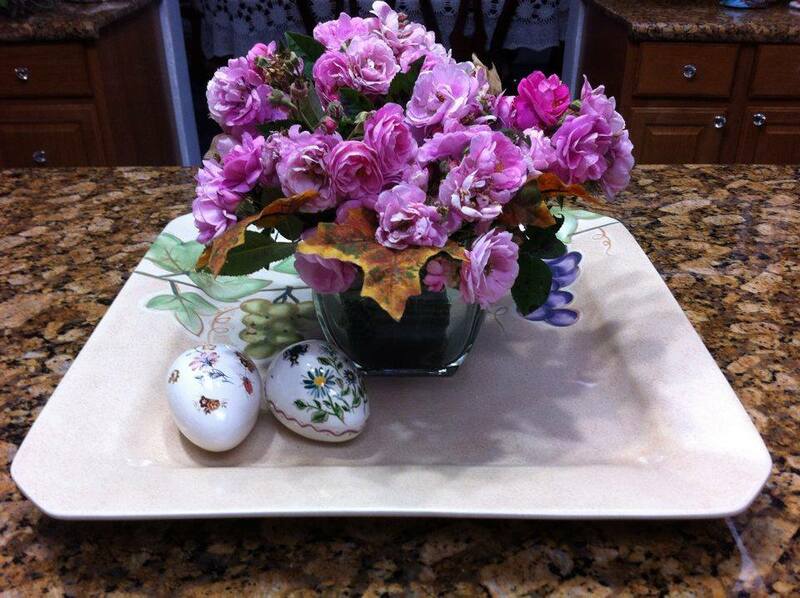 The one above is a white bloomer, but you can see that the rosebud is tinged pink. However, when they open up they are all white just like the mother plant. 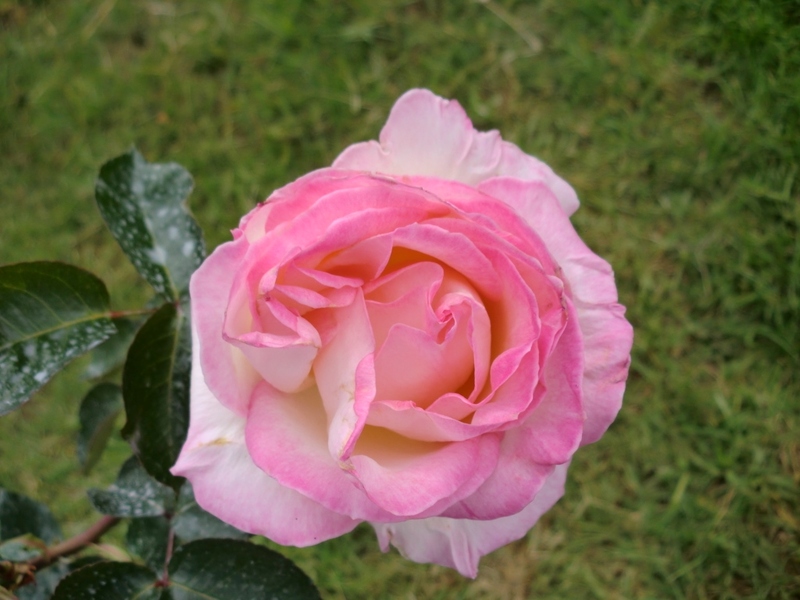 This pink rose is a cutting from the same white climbing rose, but it blooms pink. Not a trace of white. Climbing Blaze seems to have woken up from it’s slumber and is beggining to produce more blooms now. 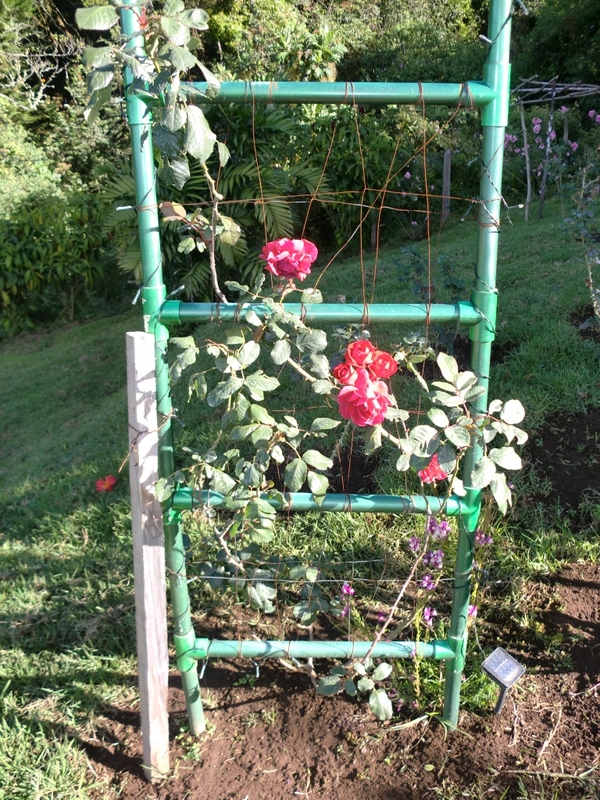 It still has a long way to go before it reaches the top of the trellis. 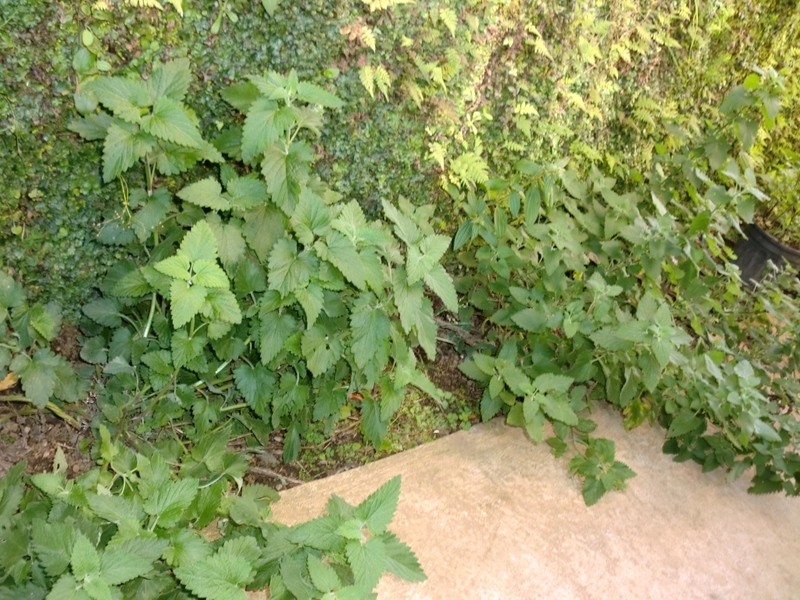 The catnip is doing really well in the cool shady area behind the house. Every evening all the neighborhood cats come over and roll around in it. 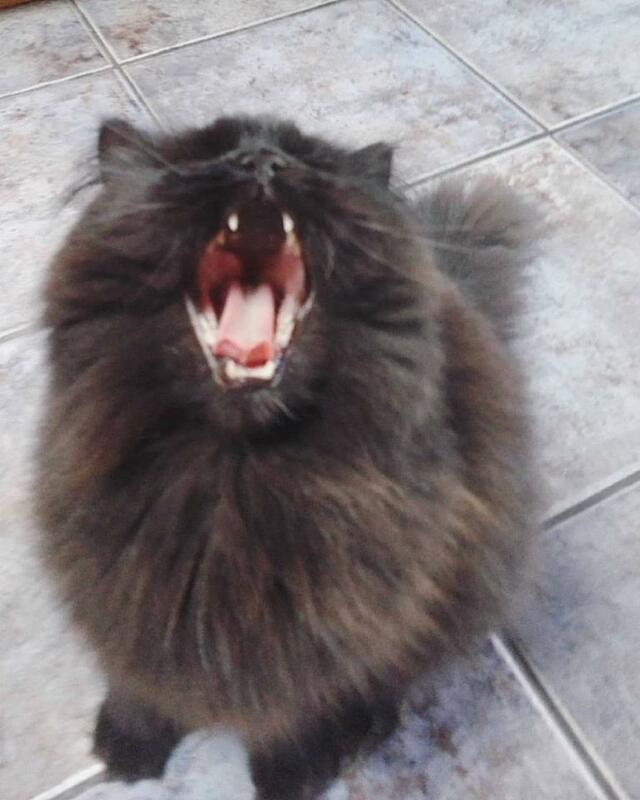 It’s a real kitty treat for sure. 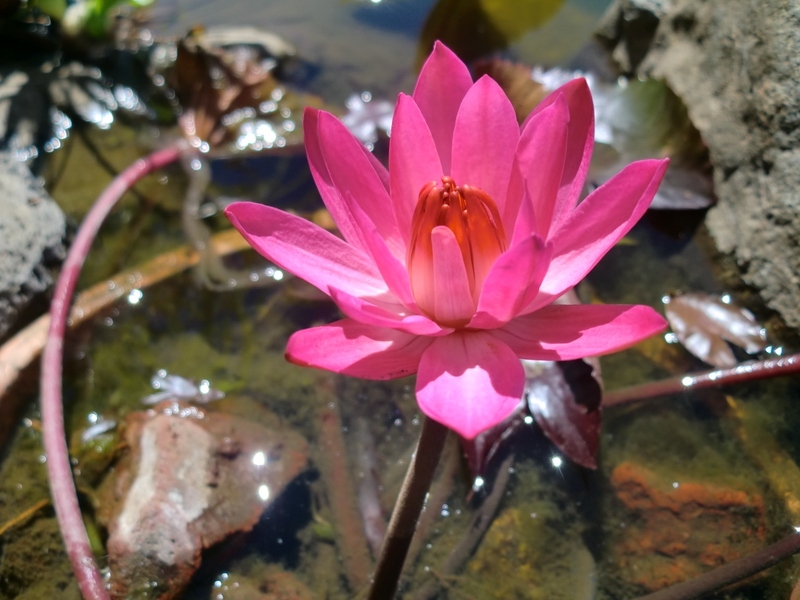 A tropical water lily in the fishpond. I’m not sure what this variety is called but it’s so colorful. It’s a night bloomer, which is why it’s only half open in this picture which was taken during the day. 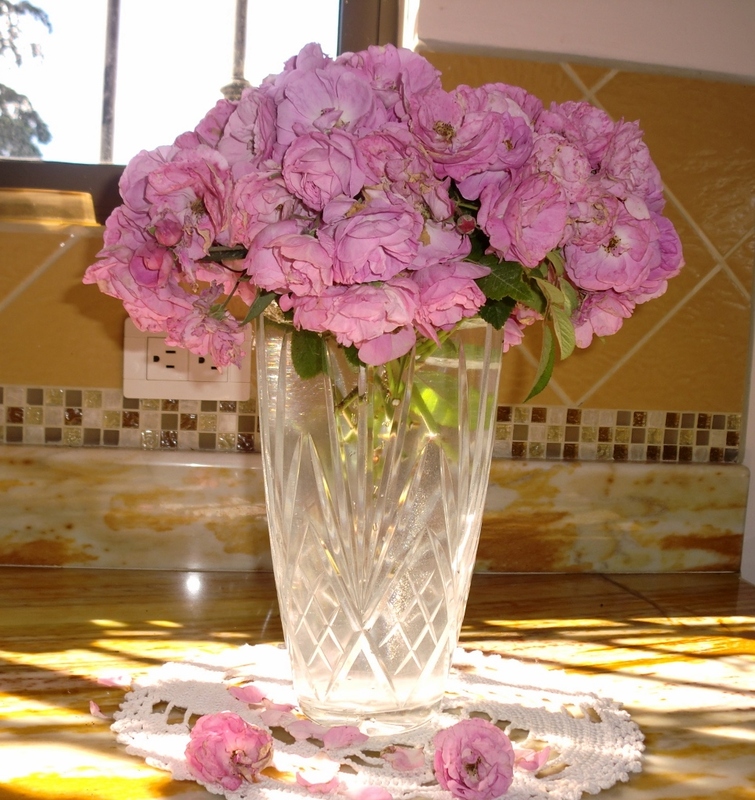 The pink climbing rose bushes were so heavy with blooms that I couldn’t resist cutting some and bringing them inside to enjoy. A humble little tomato plant sprang up among my Amaryllis bulbs recently. I have no clue who planted it, I know I sure didn’t, so I was pleasantly surprised when I spied the little plant last month even though I was doubtful as to whether it would set fruit or not. But set fruit it did! I’ve counted 35 tomatoes so far and they’re still coming. My courtyard at our city house has red brick pavers set on the ground and there are only a few small patches of soil where I have plants that will tolerate alot of rainfall. 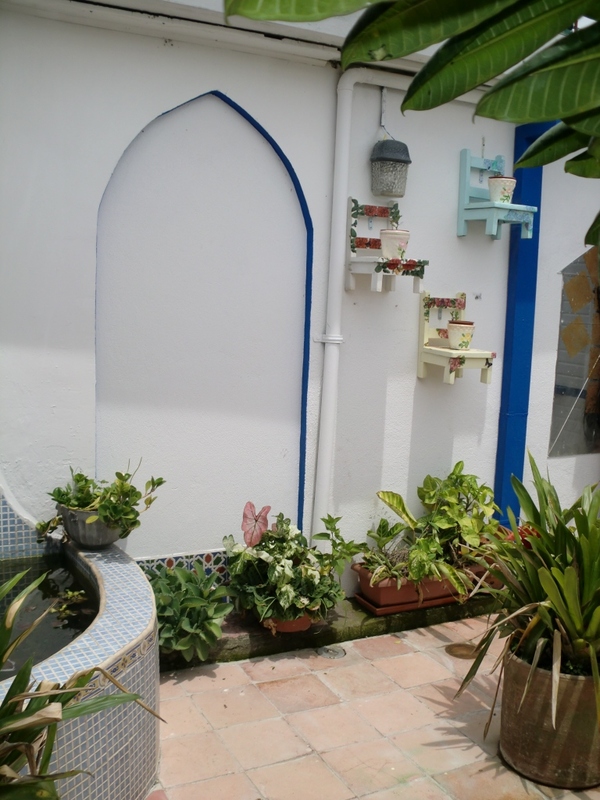 The rest of the courtyard plants are in pots. 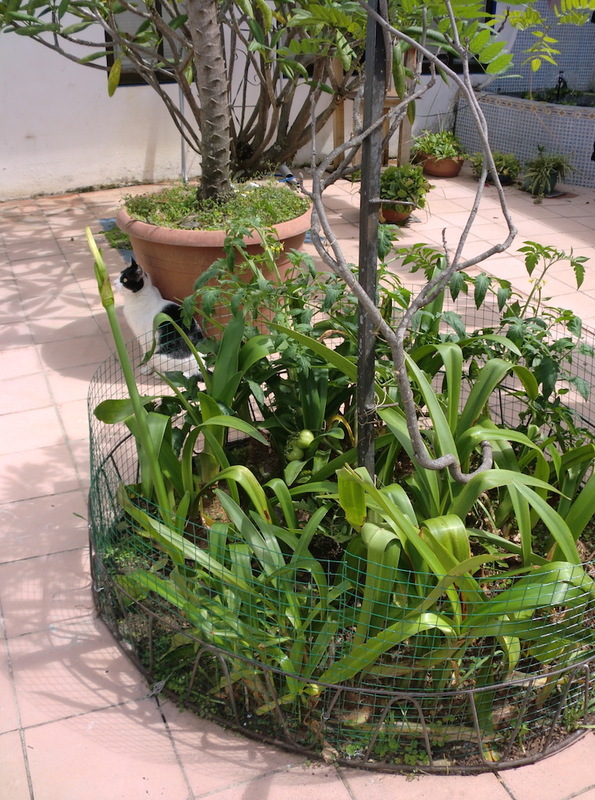 A couple of months ago I had to enclose the area around my Amaryllis bulbs with garden mesh because my kitties insisted on using it as a litter box. 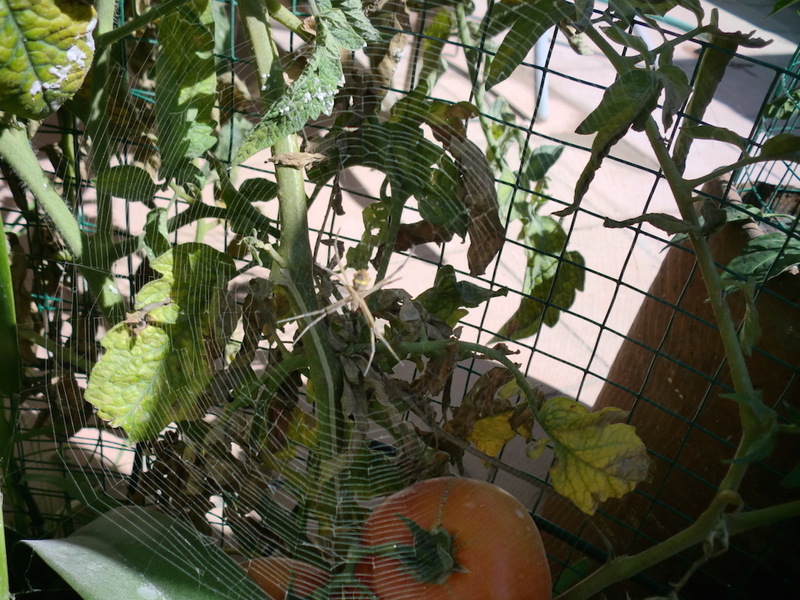 The mesh effectively stopped them from going in there anymore, but I have the feeling that that’s why that lone tomato plant is now going overboard with the tomato production. It had lots of kitty fertilizer. I also kind of have the feeling that that’s how the seed got in there in the first place. Ewwww. 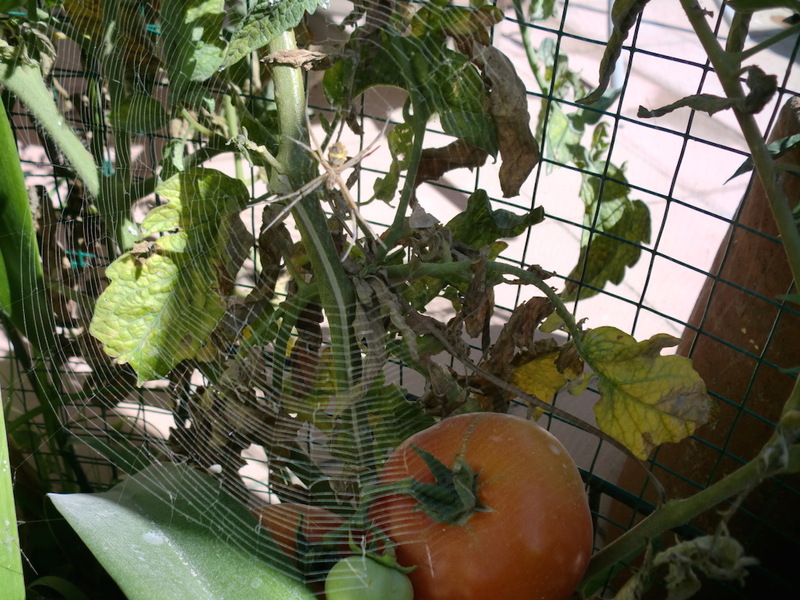 Today when I went to pick a few of the tomatoes that had ripened I discovered that a large green spider had woven a beautiful web right in front of the two largest, ripest ones. 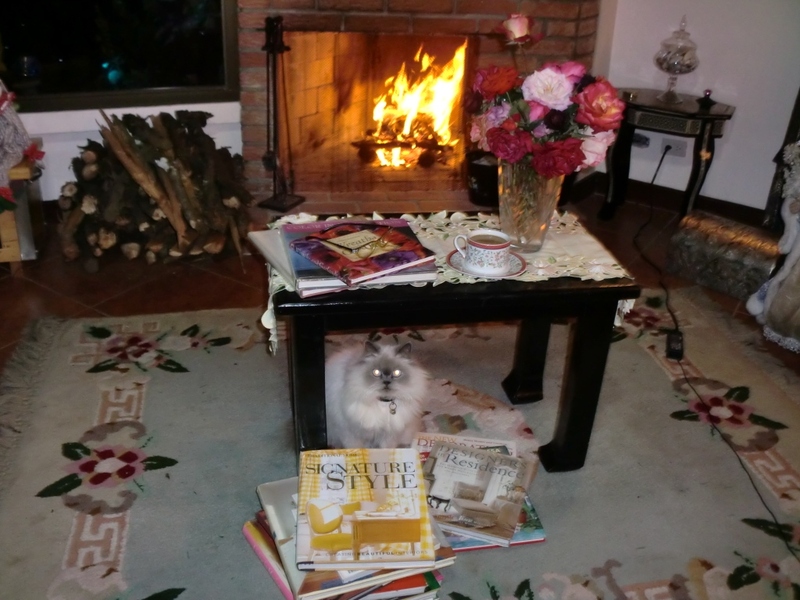 I didn’t have the heart to disturb him. He seemed so watchful, holding perfectly still just waiting for his lunch to fly by. So I left those two tomatoes for another day. I did get some nice plump ripe ones from a neighbouring branch, which quickly became part of a delicious spaghetti sauce. 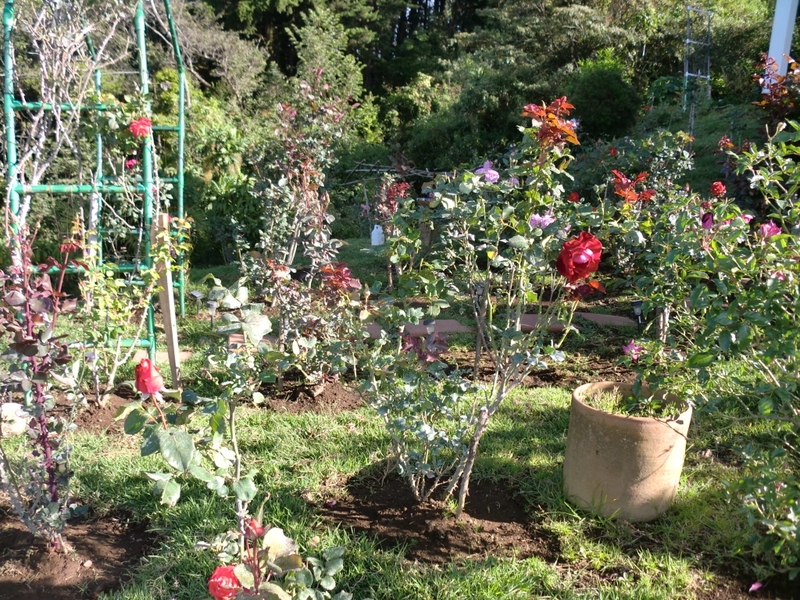 This past week-end I pruned all of my roses which had become leggy and gangly. They’ve been affected by a couple of different funguses caused by the excessive October rains and they’d lost most of their foliage, leaving a garden full of bare stalks. The fungus was relentless and it seemed to be resisting all my efforts to erradicate it so I finally decided that drastic measures were necessary. I went ahead and pruned them down in the hopes that they will leaf out again and resume normal growth. 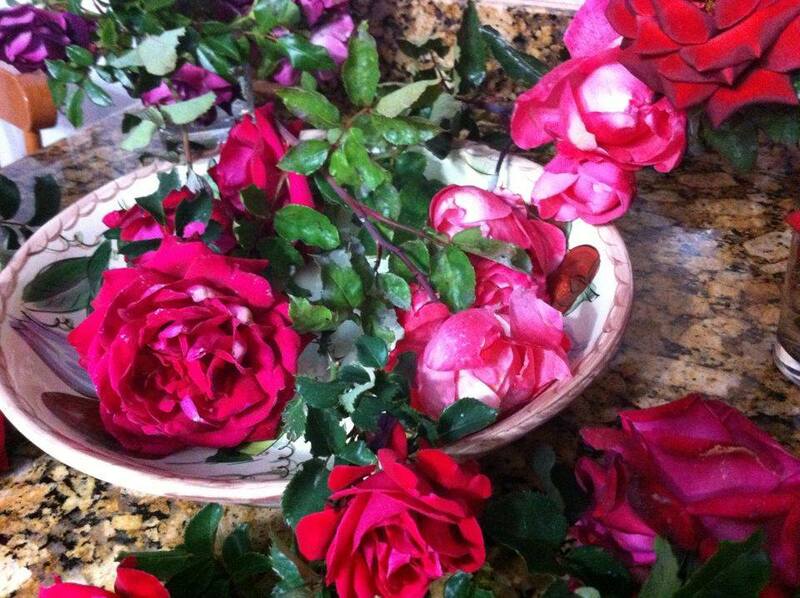 We don’t have marked seasons here so roses can be pruned any time of year. 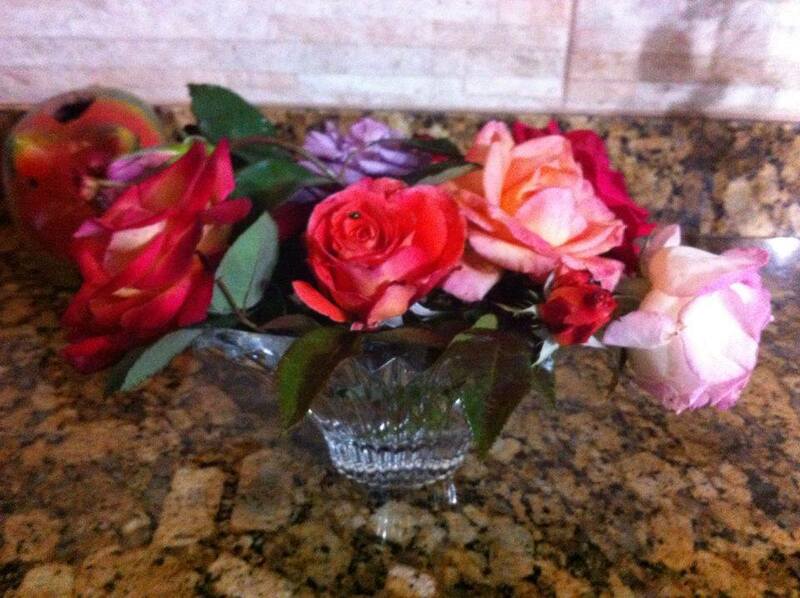 Some of them were blooming and I gathered enough roses for a vase. 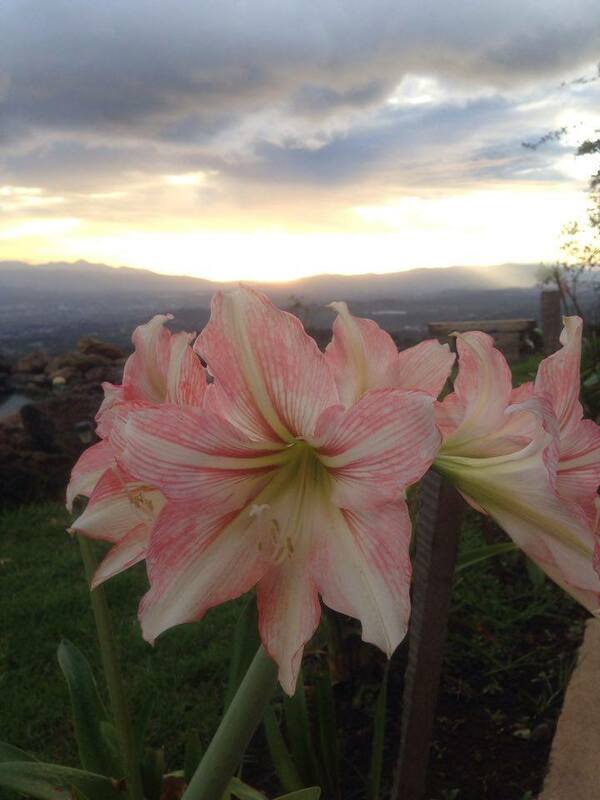 I was happy to be able to enjoy these last few blooms as there won’t be anymore for at least a couple of months. 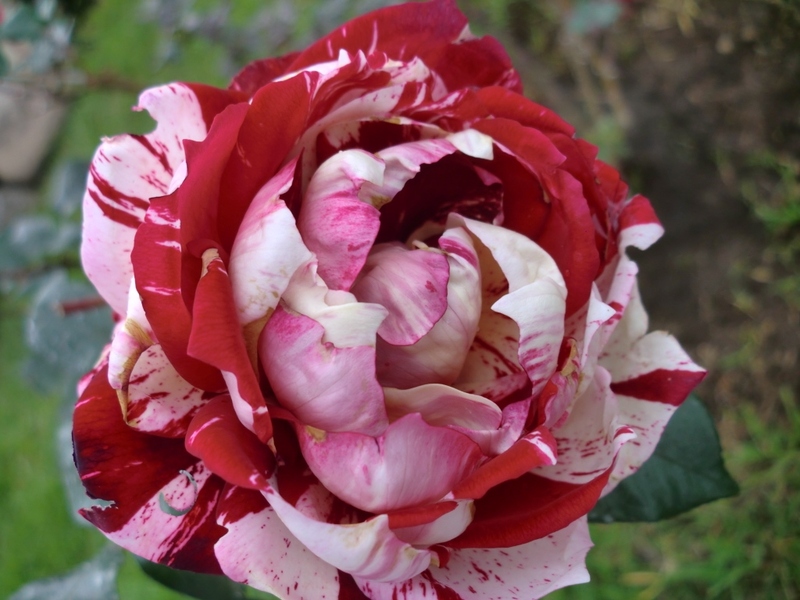 Unfortunately I don’t know the names of all my roses, nurseries here rarely have them labelled by name. 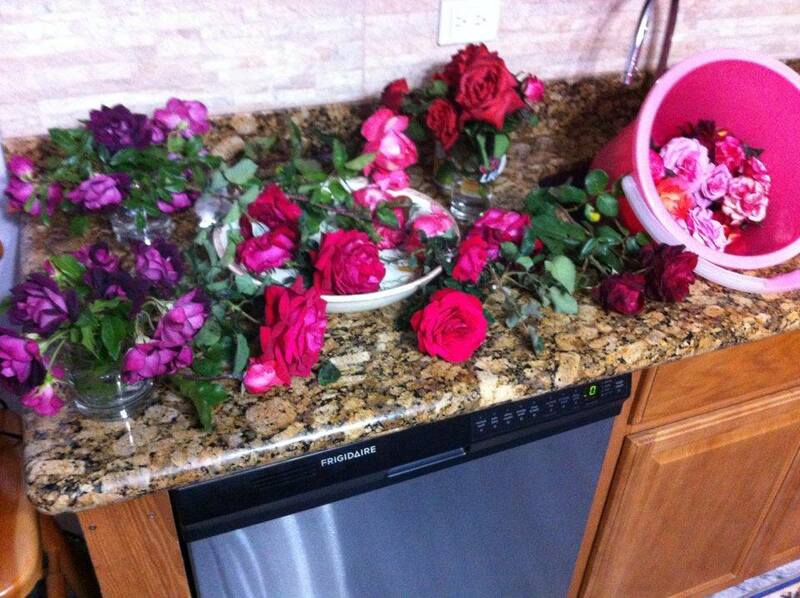 Most roses are just sold by color. 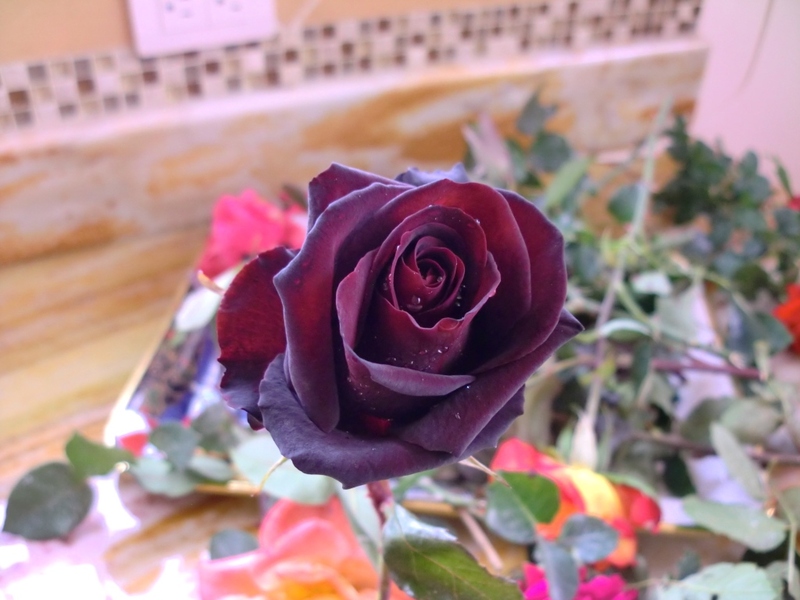 This velvety rose is such a deep shade of burgundy that it actually looks black from a distance. 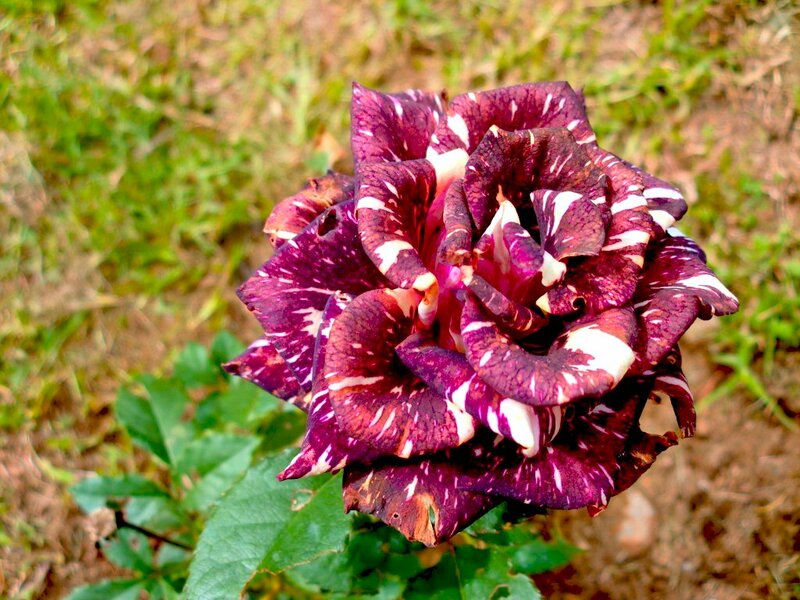 No idea what it’s called, so I just call it….black rose. 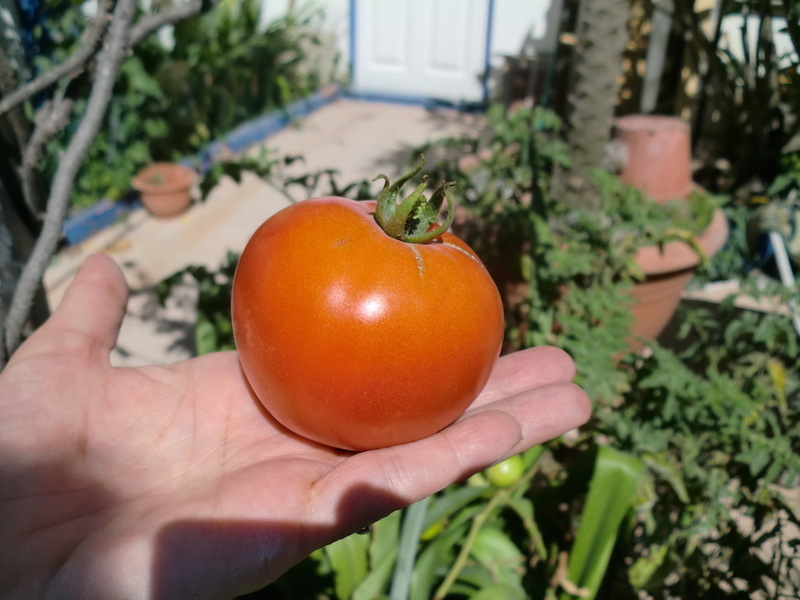 This one has russet colored edges and a yellow center. 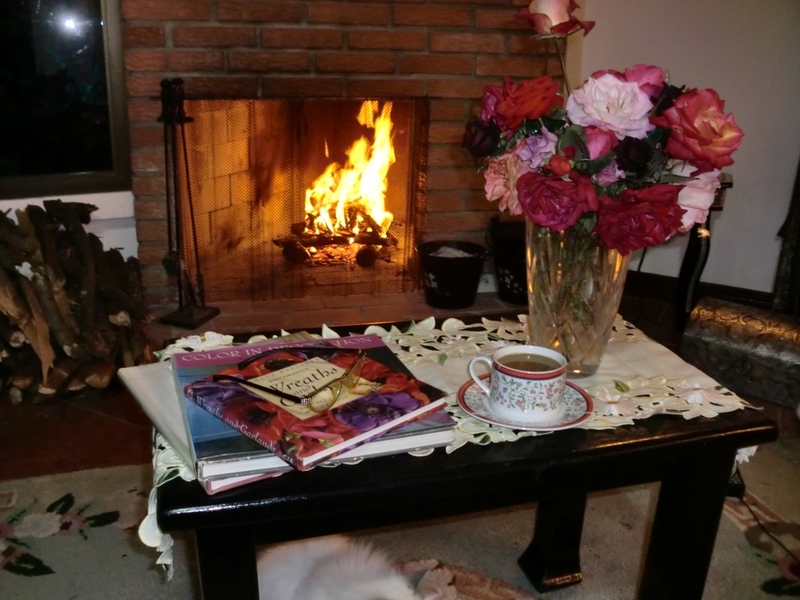 I moved the vase over to the coffee table to better enjoy the fragrance as I leafed through a stack of new books. I hit the jackpot at moving sale that same morning and found more than a dozen huge decorating books loaded with mouth watering pictures for about a dollar each. Score! 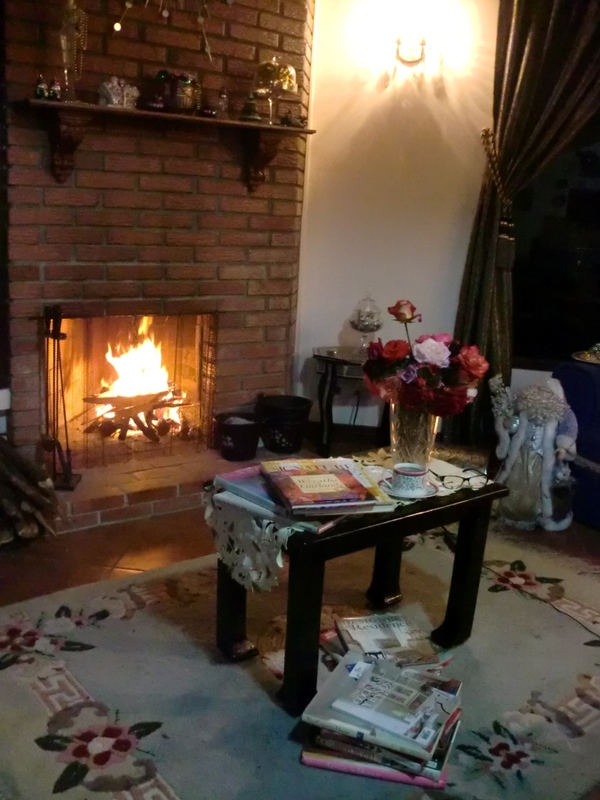 I spent a quiet evening alone, reading in front of a cozy fire with a hot cup of coffee and the heavenly scent of roses as the wind howled outside. Sheer bliss.